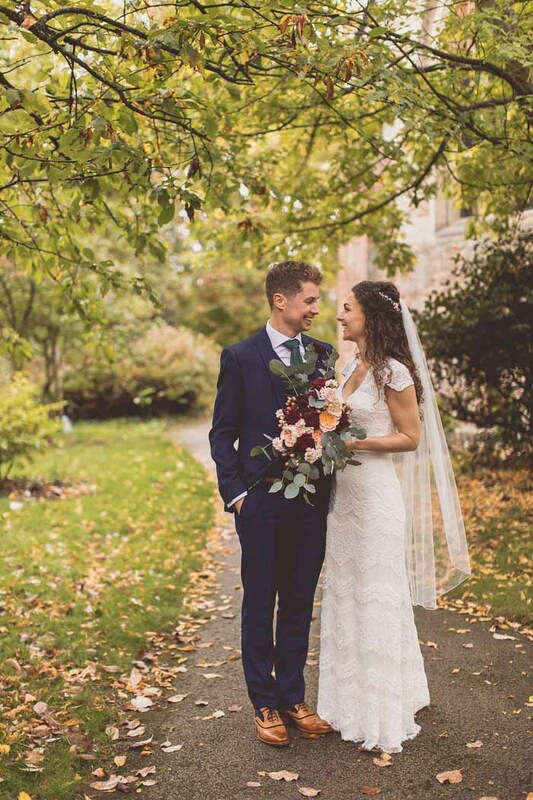 We love autumn wedding colours and were delighted when Kate and Al chose us to be the florist for their elegant autumn wedding. 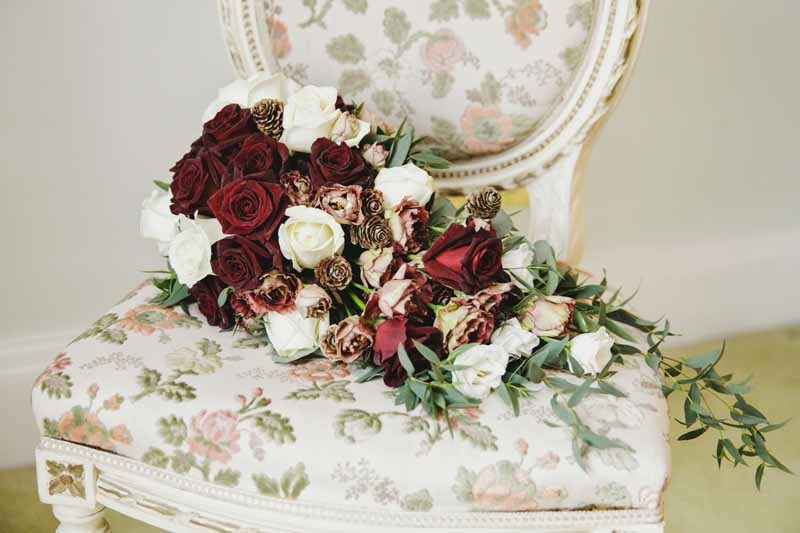 We worked on a brief of mixed metallics, bronze, copper and gold with candlelight, burgundy red, emerald, dusky pinks and touches of peach. 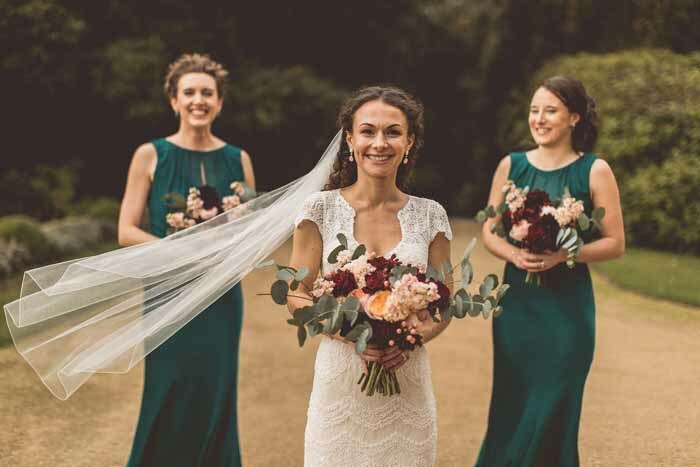 Kate suited a natural free form wedding bouquet with a mix of autumn colours. 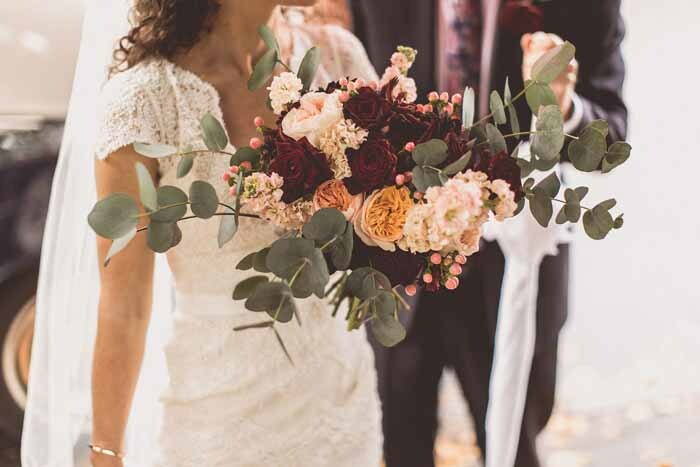 Deep peach Juliet roses, dark burgundy red Black Bacarra and Quicksand roses with dahlia and kangaroo paw for added texture with stocks, hypericum berries, frilly lisianthus and eucalyptus. 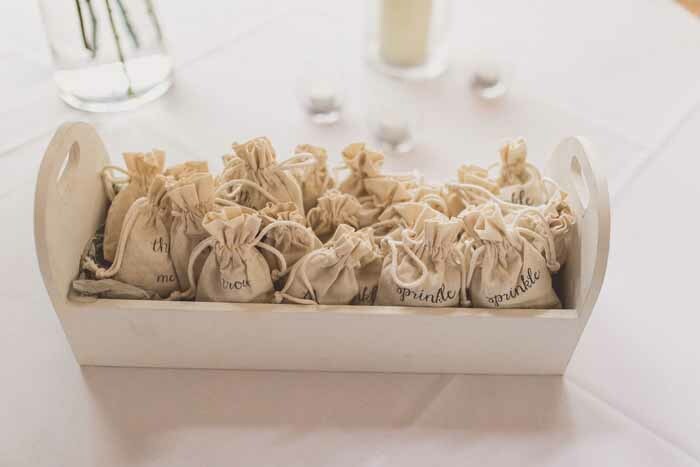 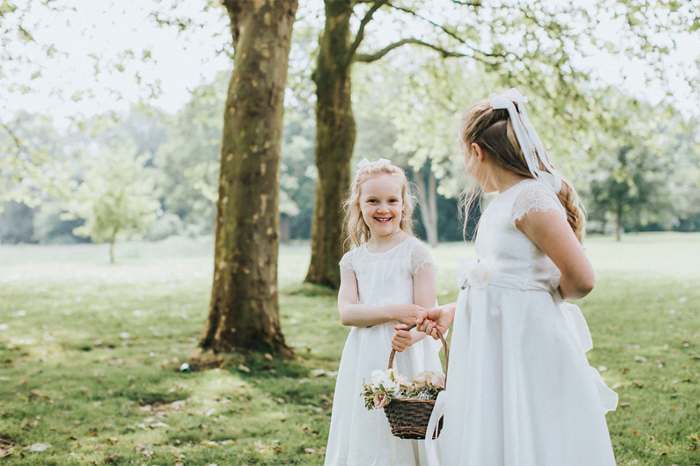 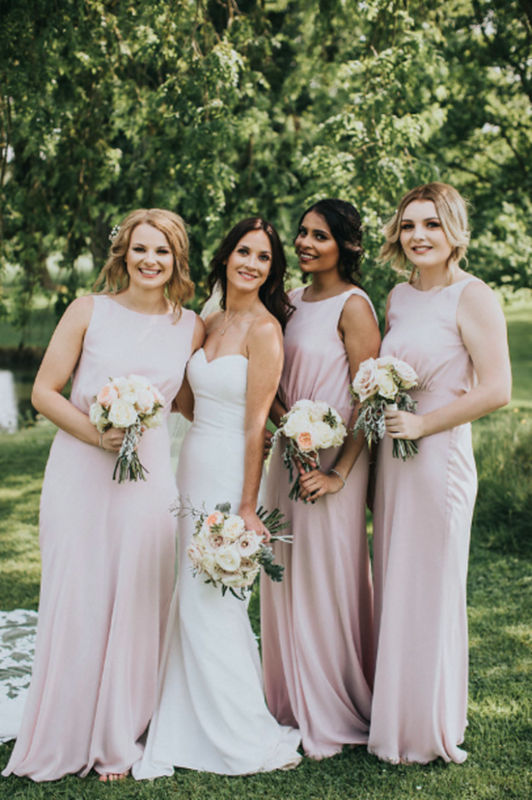 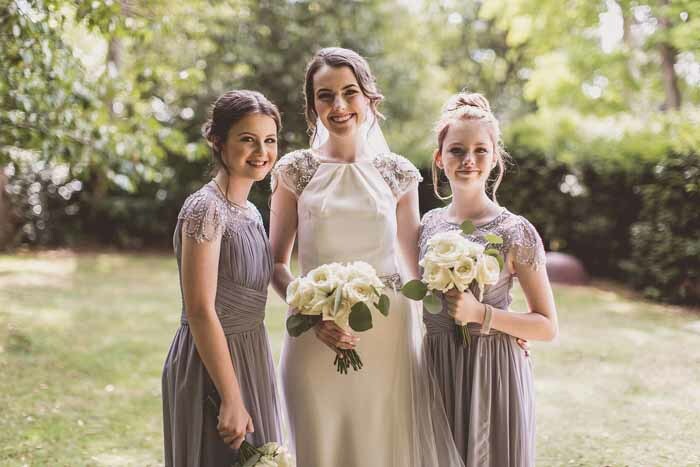 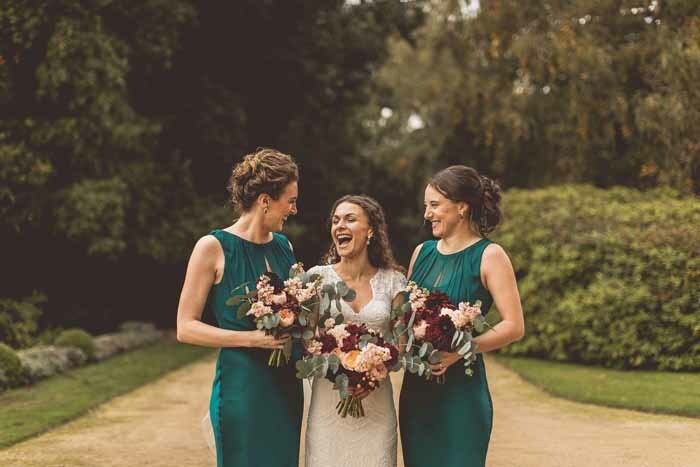 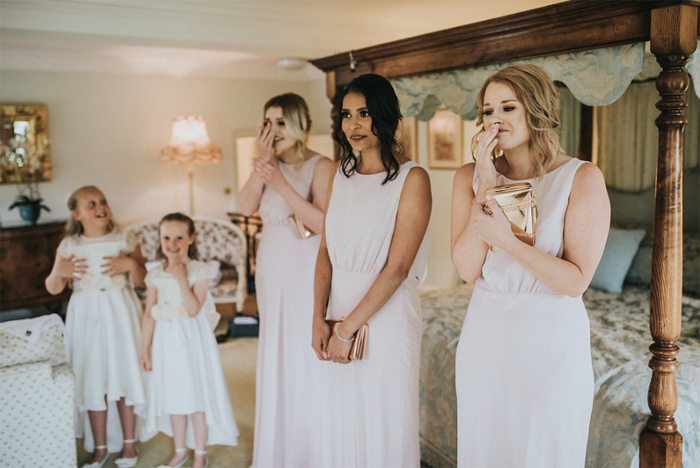 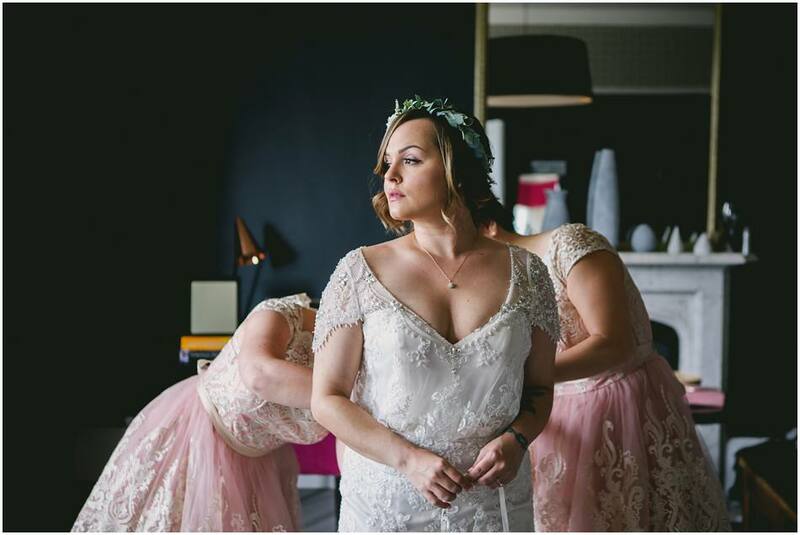 The bridesmaids bouquets suited their elegant emerald green Ghost dresses and by choosing the same colours for the bride and her bridesmaids bouquets the look is pulled together effortlessly. 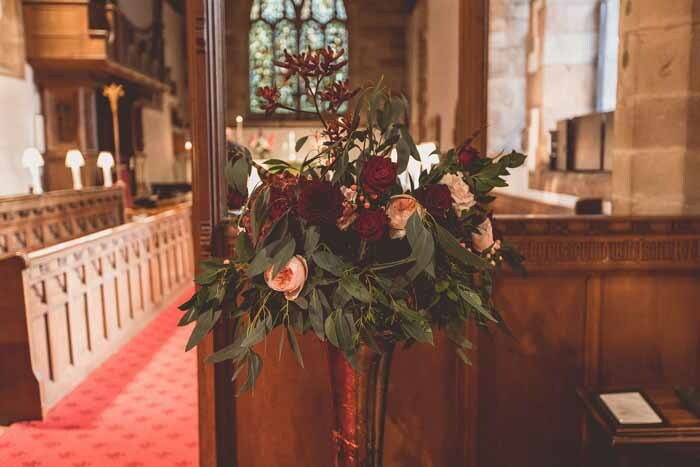 For an Autumn wedding bronze tall vases filled with a mix of flowers and foliage from the day created a beautiful backdrop for the church wedding at Hampton in Arden church. 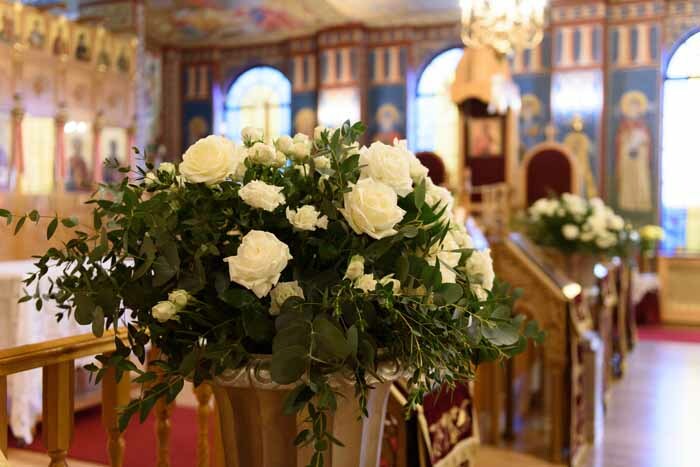 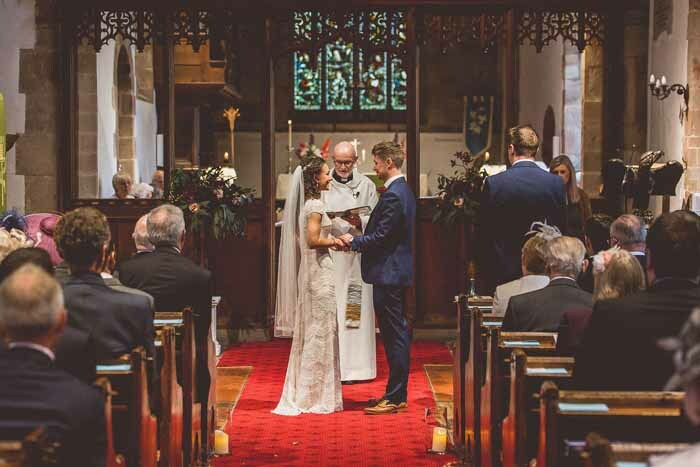 Candle light was used on the windowsills and down the aisle to give a warm look to the church. 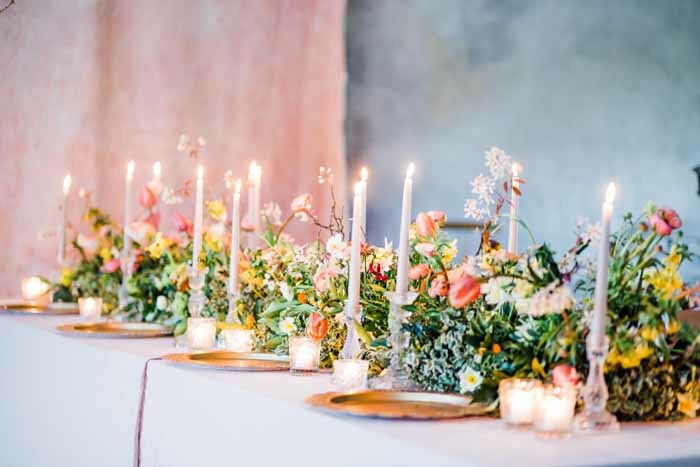 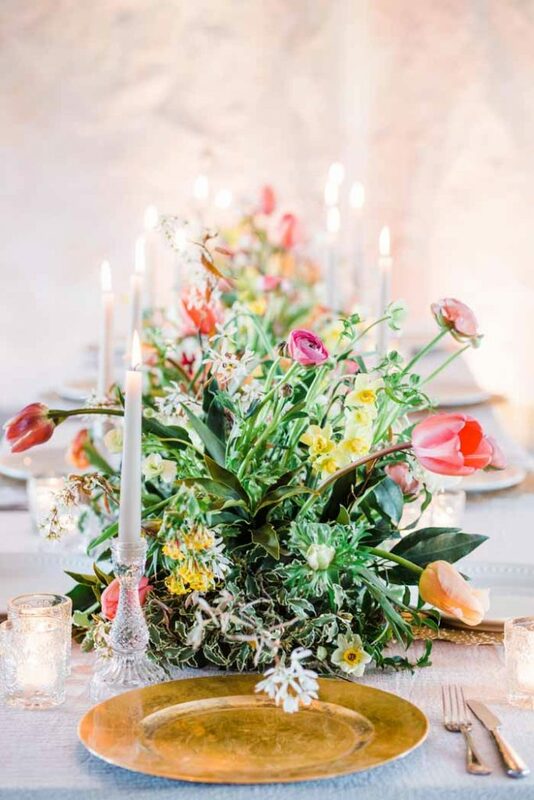 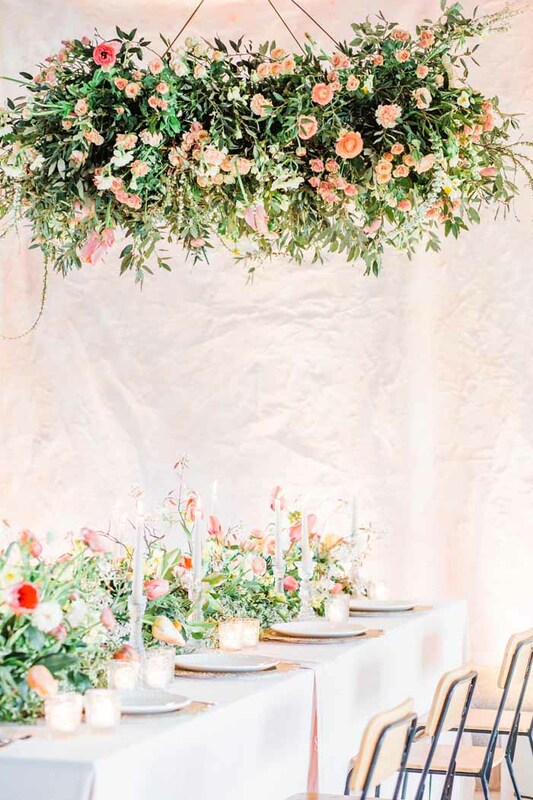 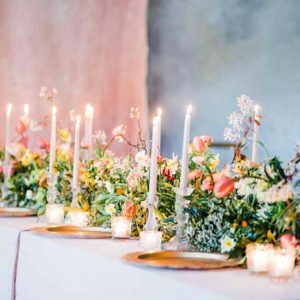 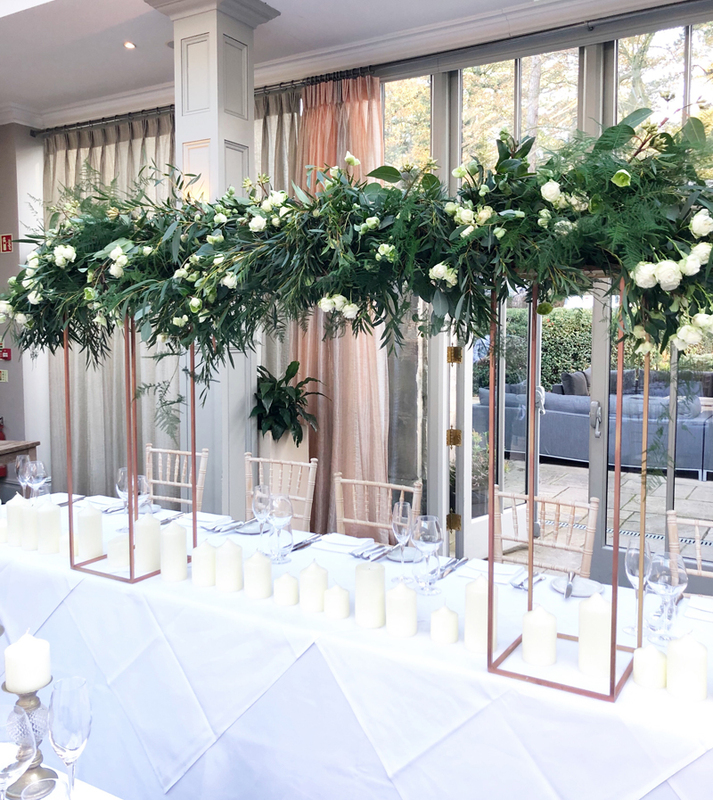 The long tables were dressed with bronze floral stands with foliage and feathers with hanging baubles and foliage along the length of the table intertwined around a mix of gold, copper and bronze votives. 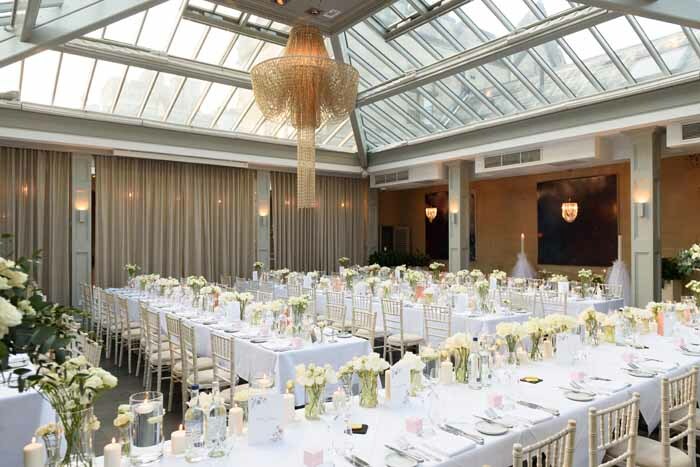 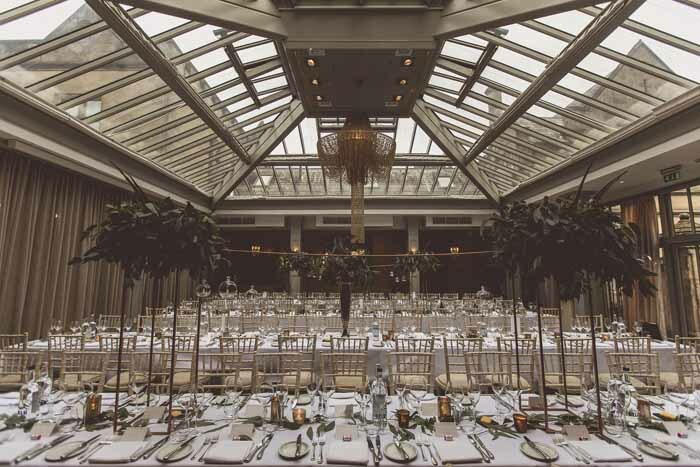 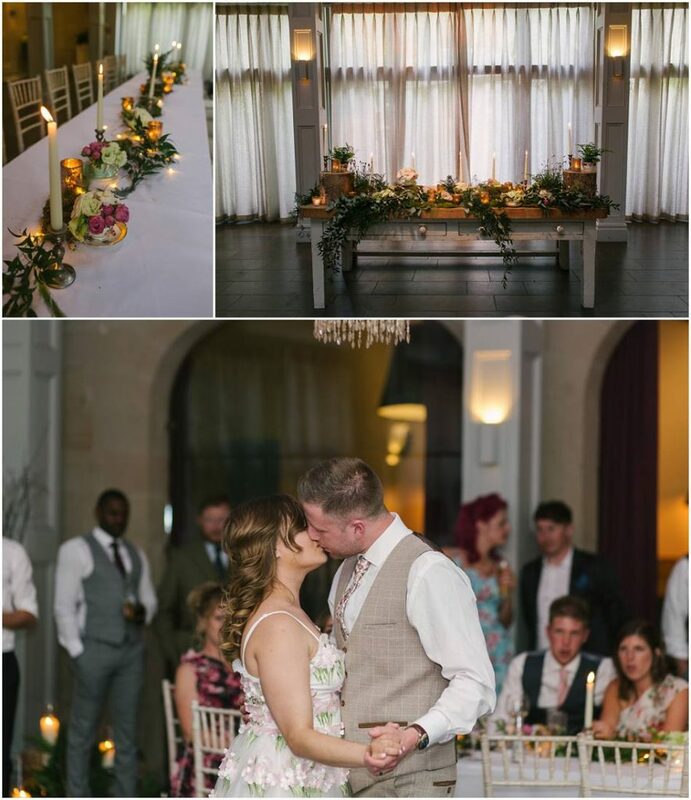 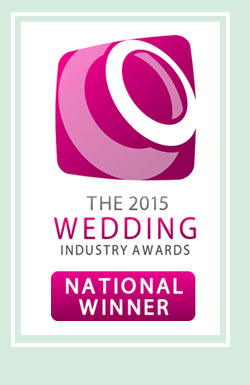 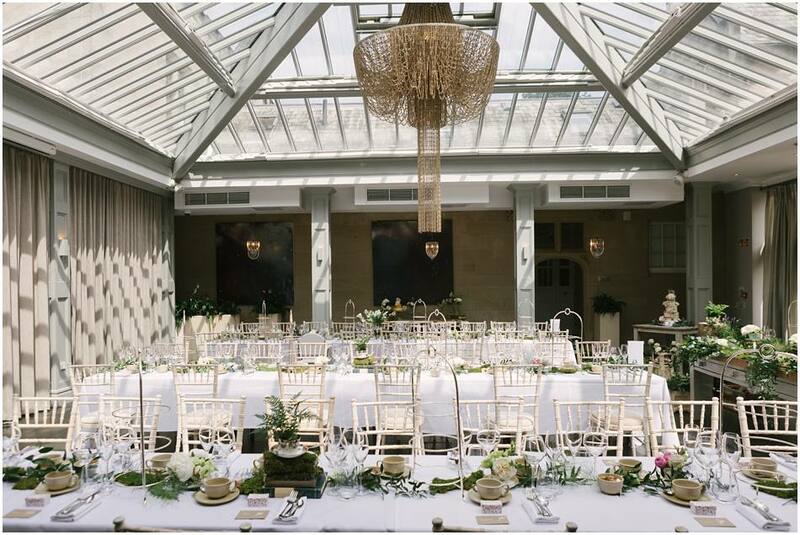 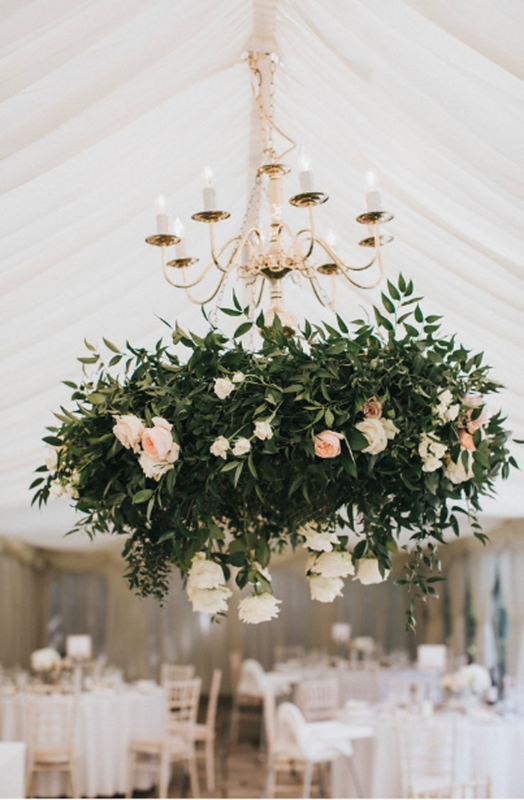 These colours work well with the venue decor including the stunning chandelier in Elizabeth’s Court. 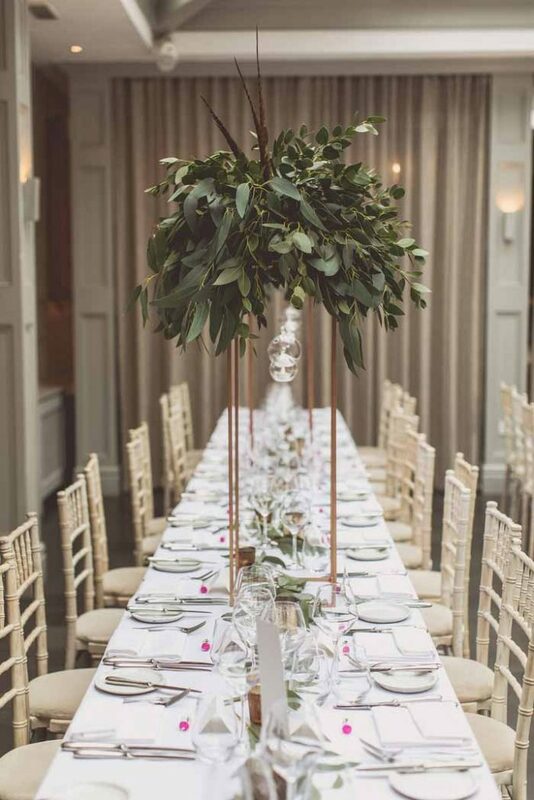 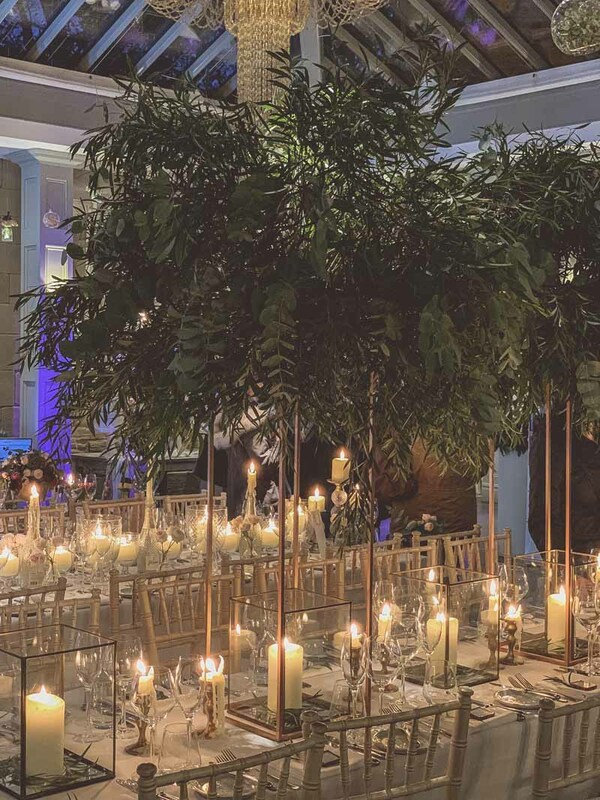 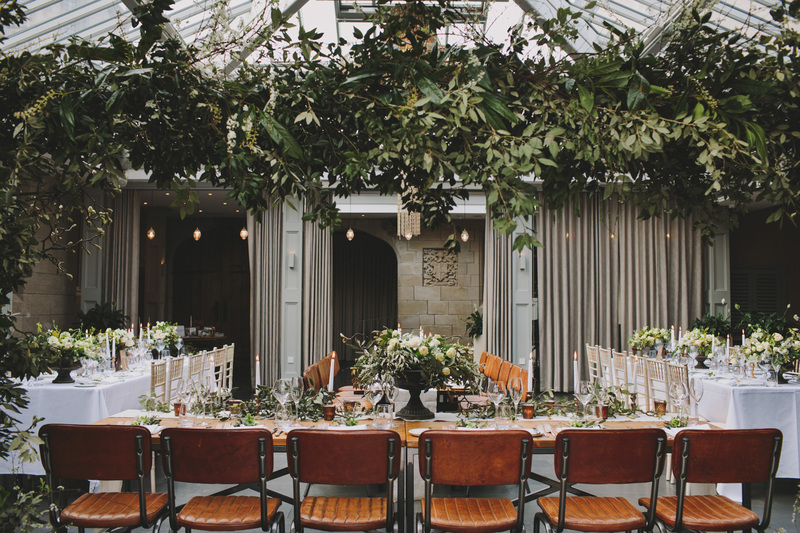 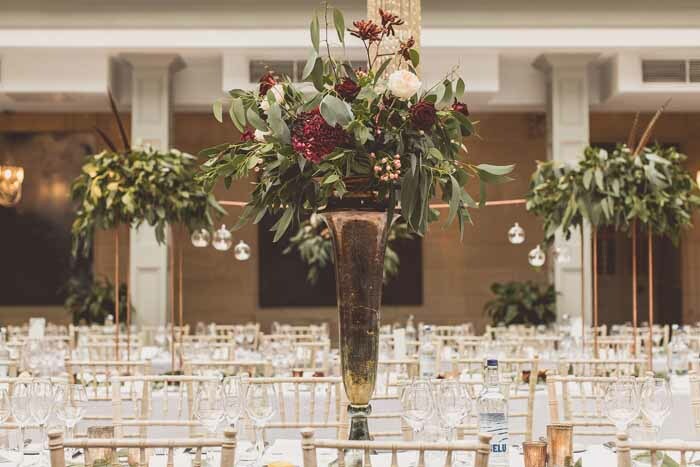 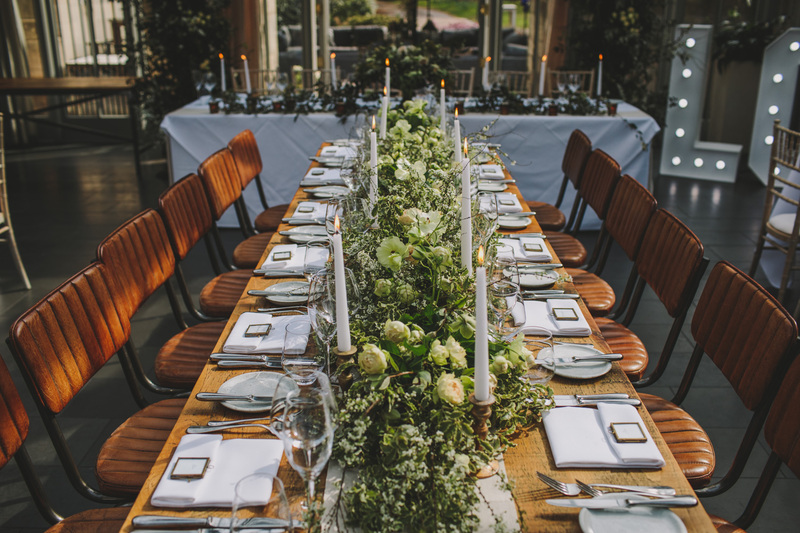 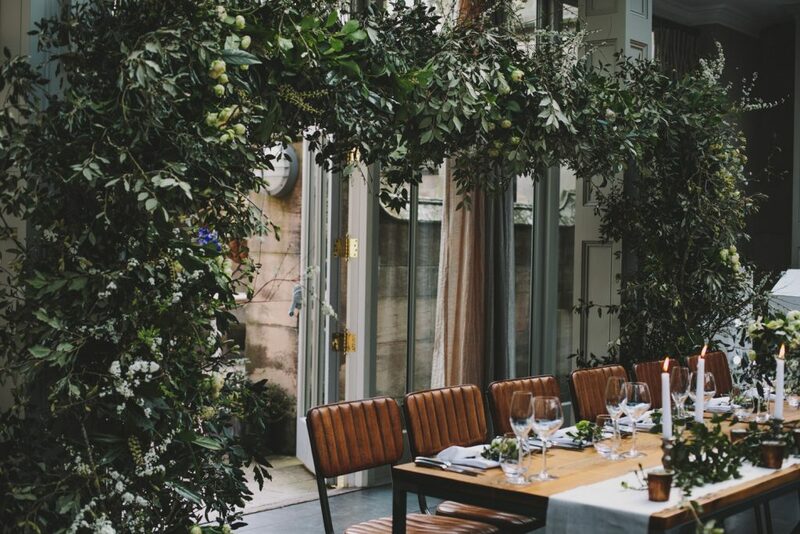 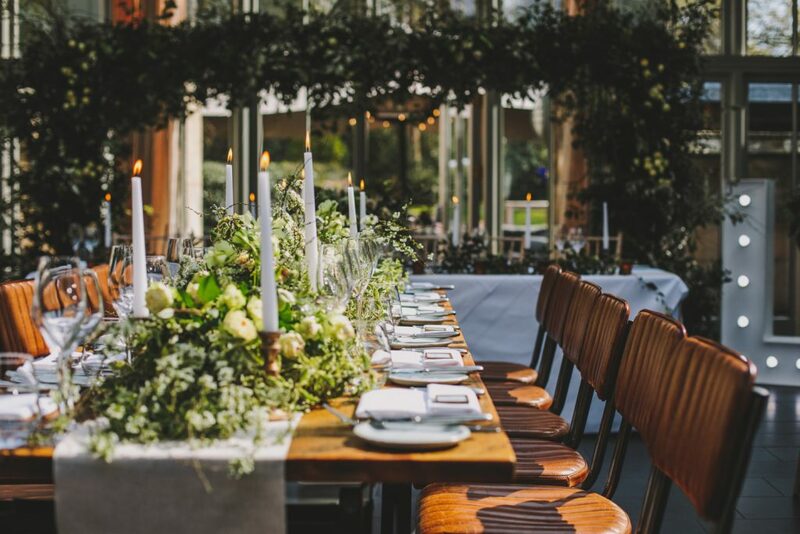 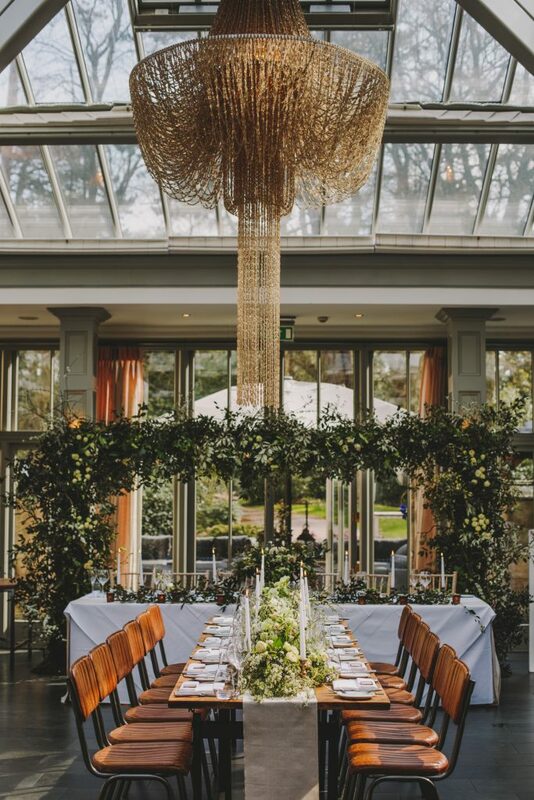 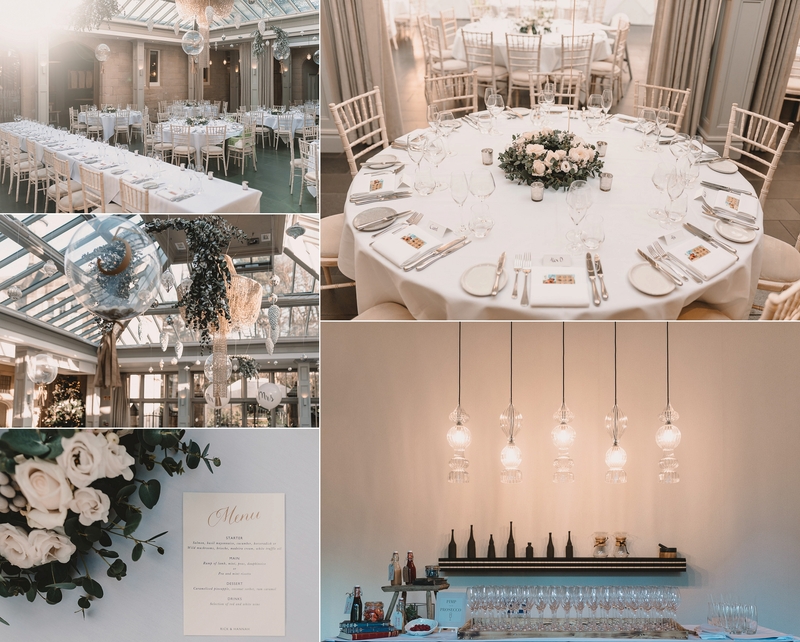 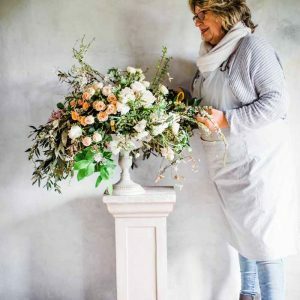 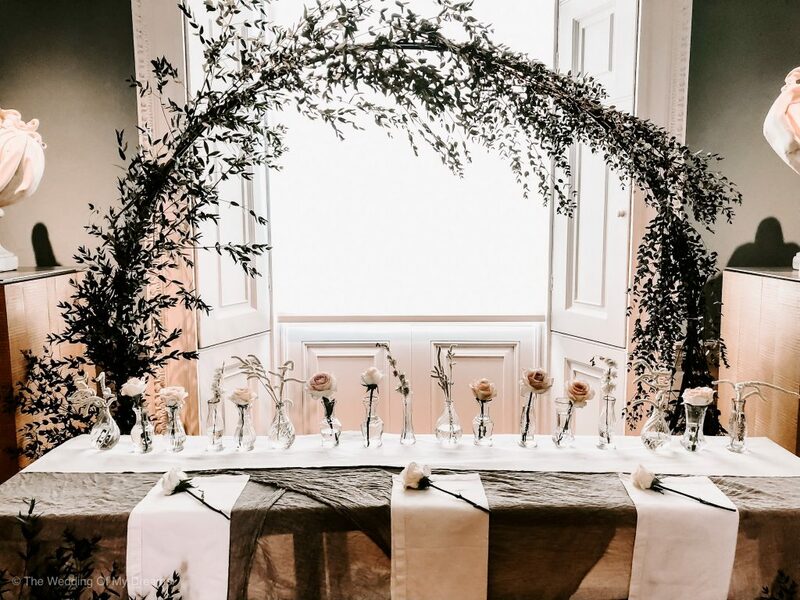 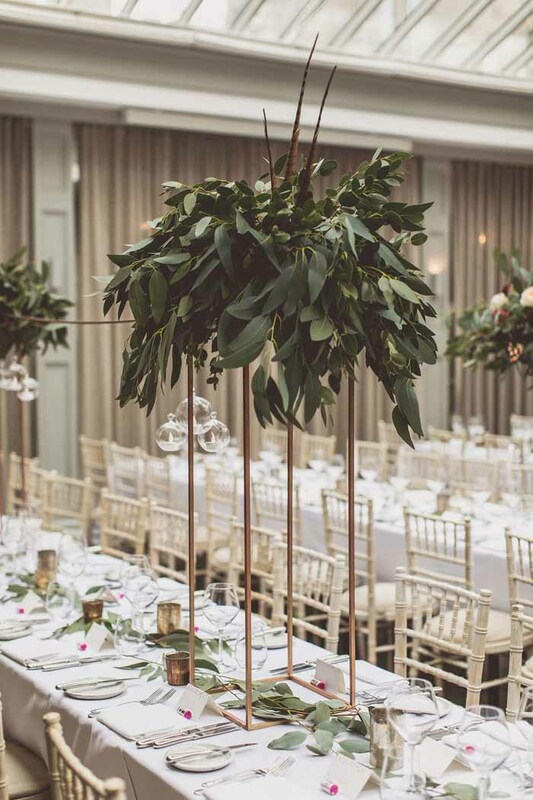 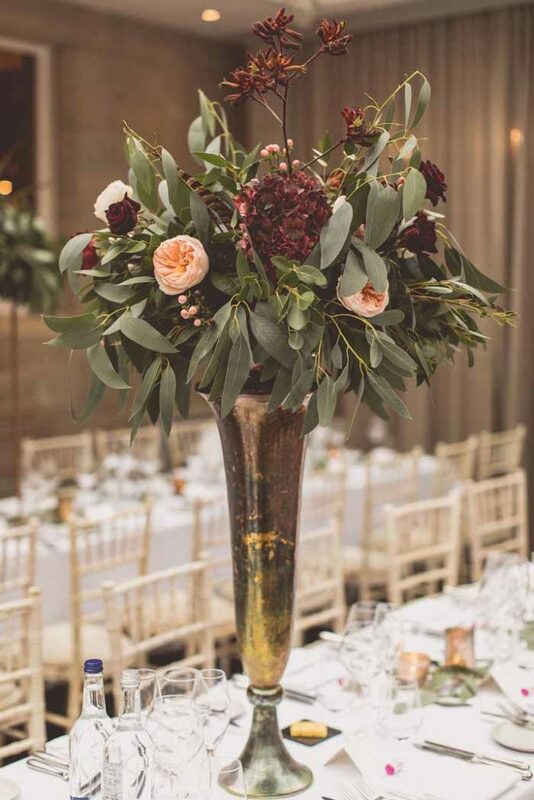 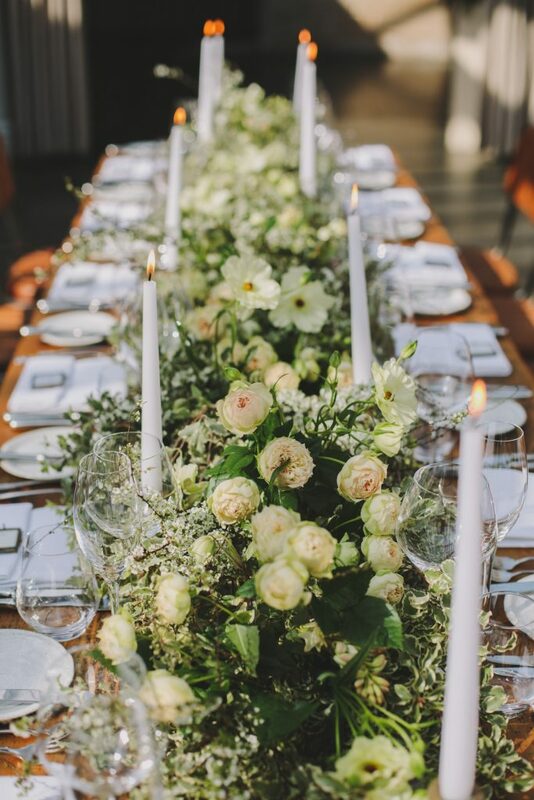 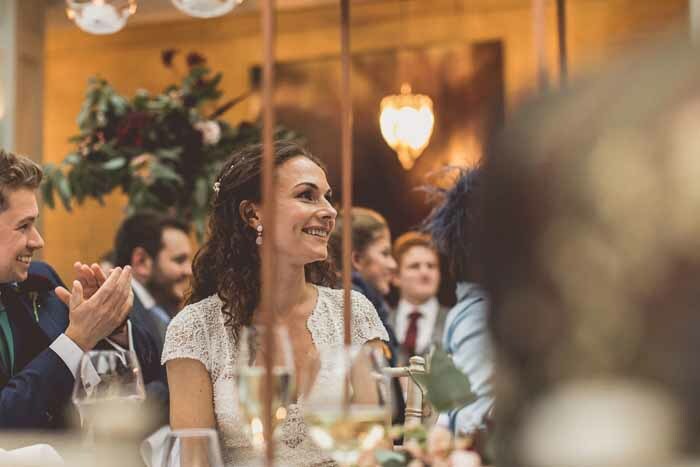 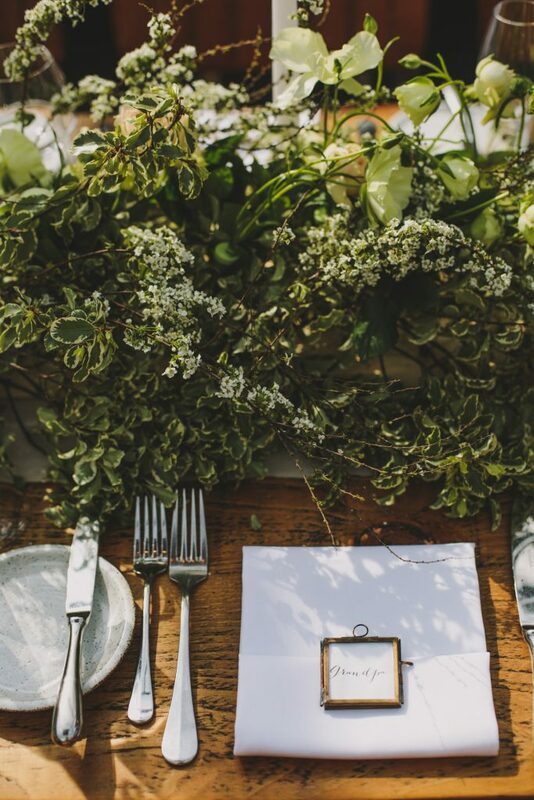 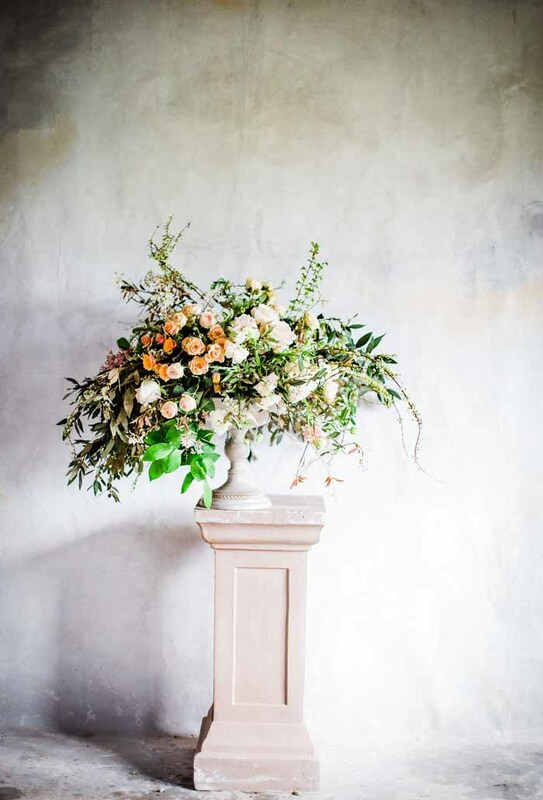 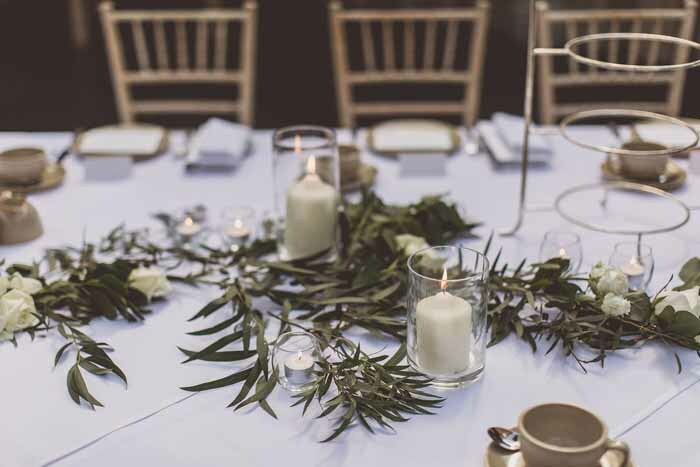 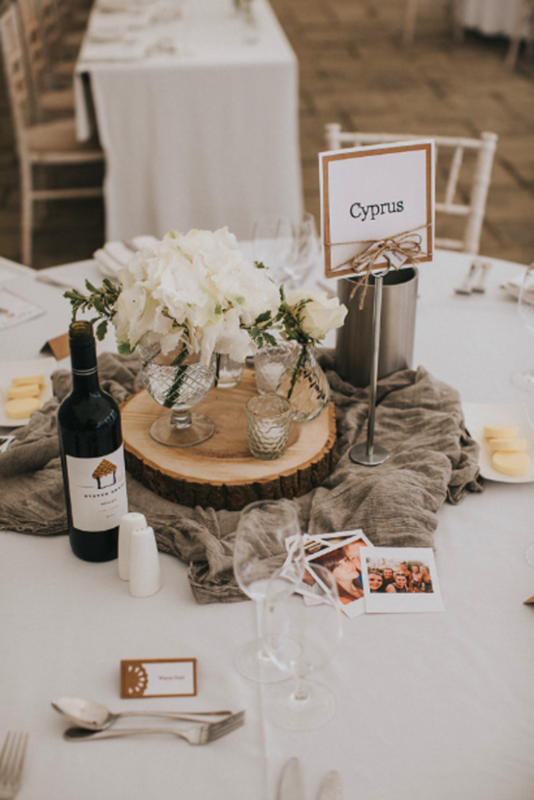 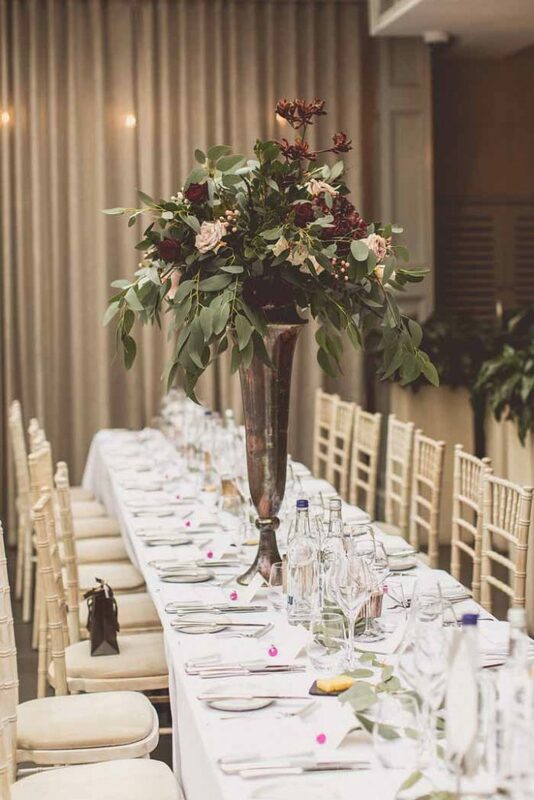 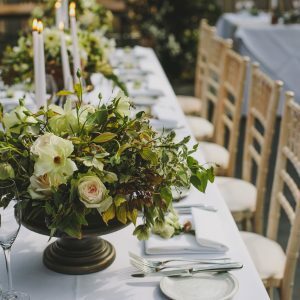 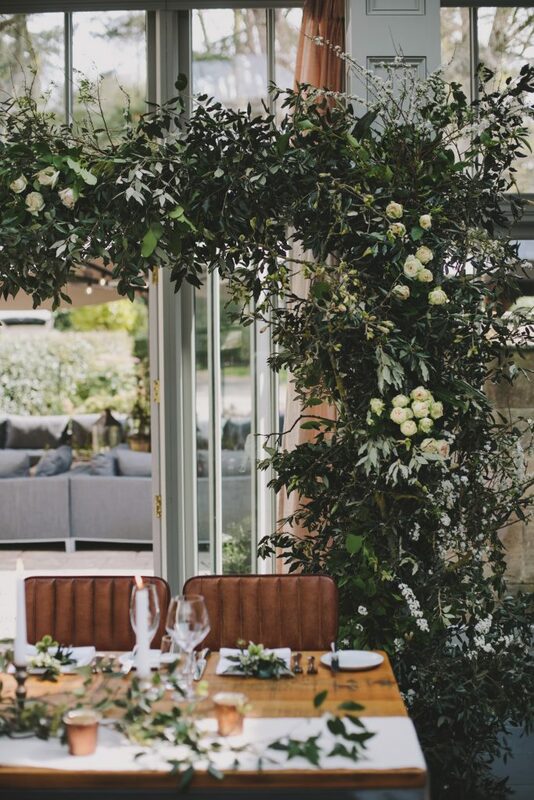 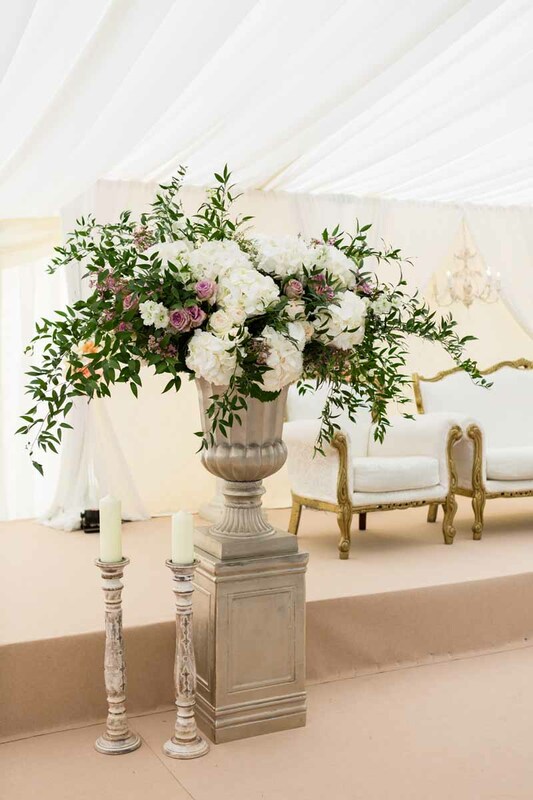 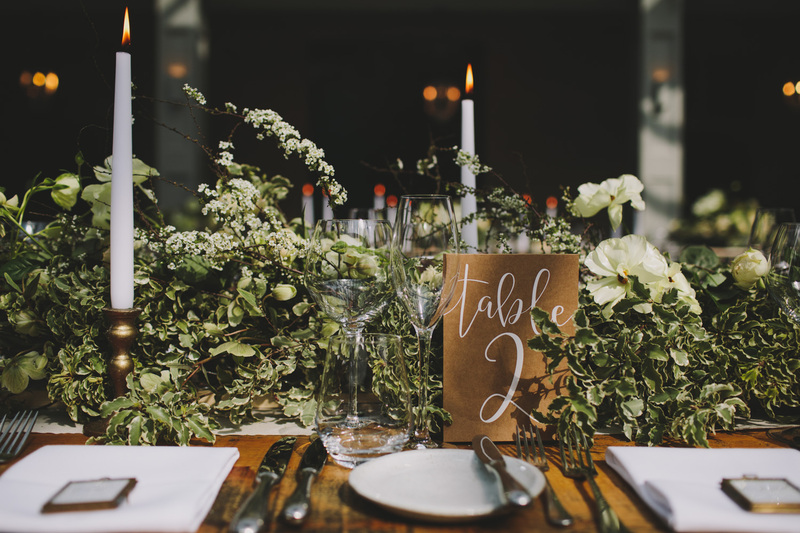 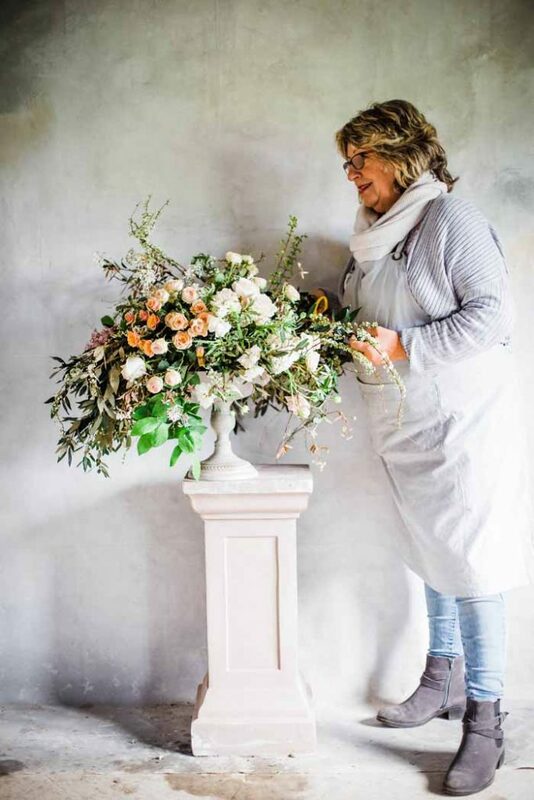 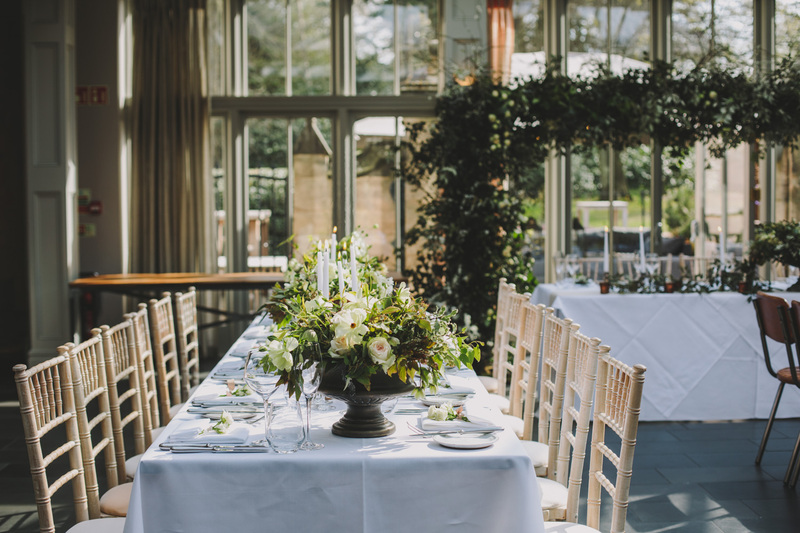 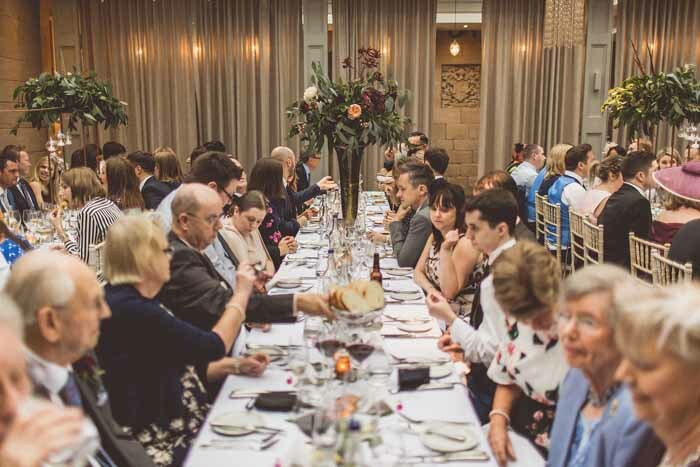 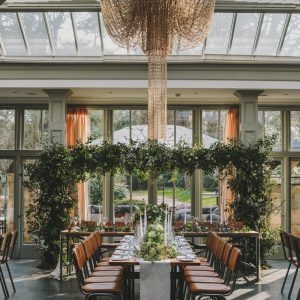 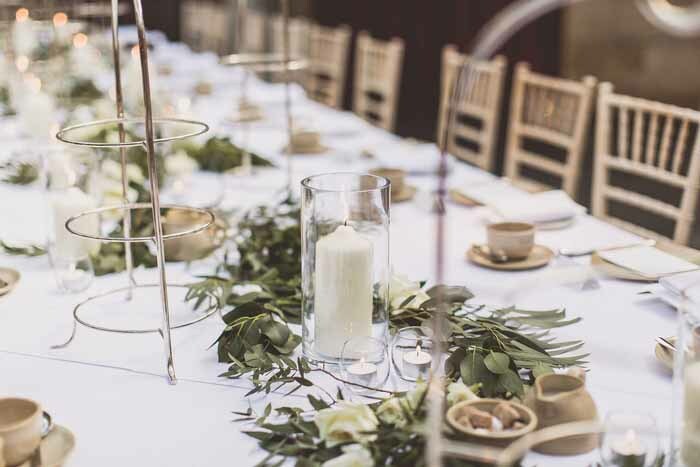 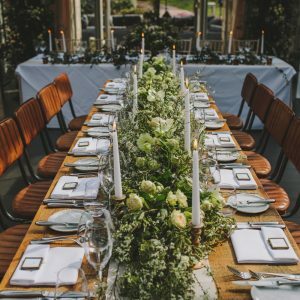 The centrepiece bronze tall vases looked elegant on the long tables with a lush arrangement with dahlia, Juliet, Black Bacarra and Quicksand roses, deep toned fluffy hydrangea and plenty of foliage with kangaroo paw and hyericum berries for an autumn wedding. 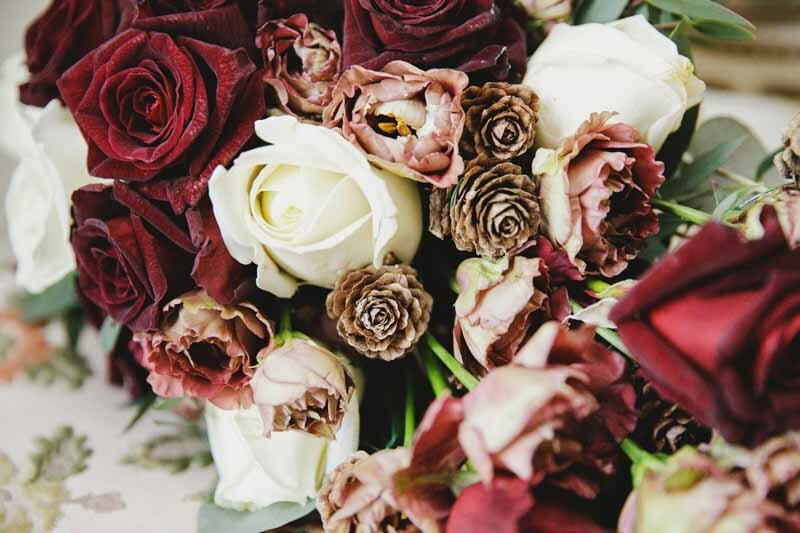 Soft Quicksand and deep burgundy black bacarra roses decorated the naked wedding cake and Kate laid her bouquet to the side. 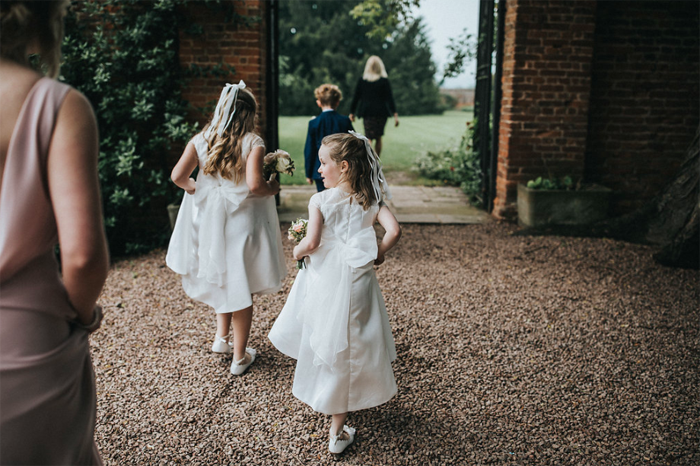 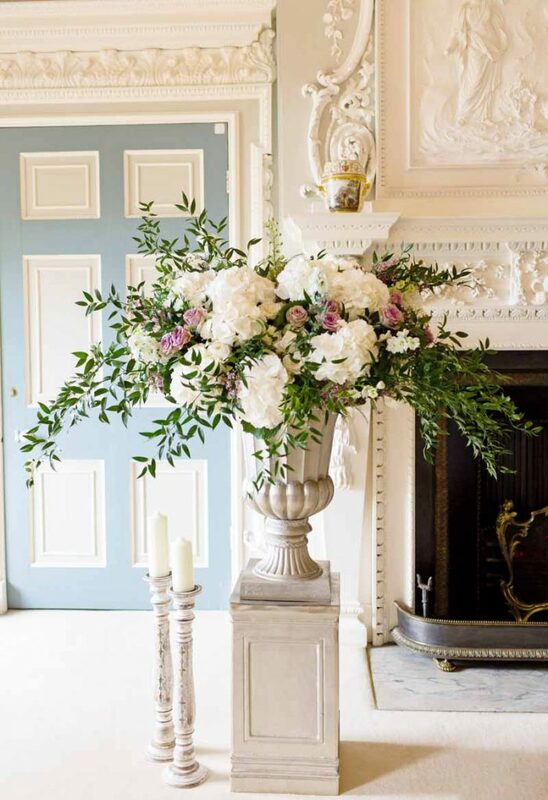 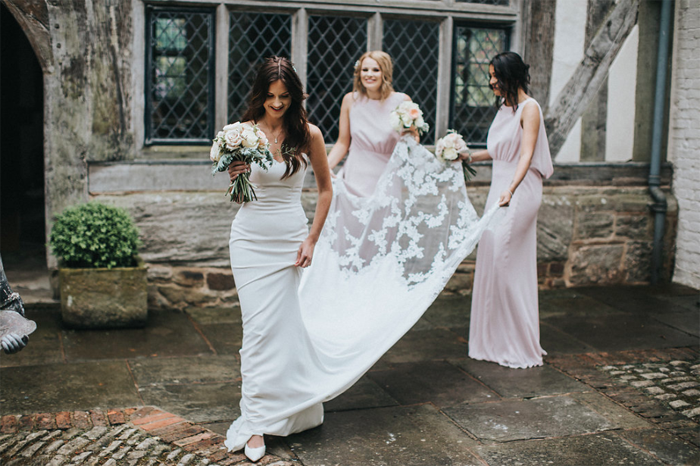 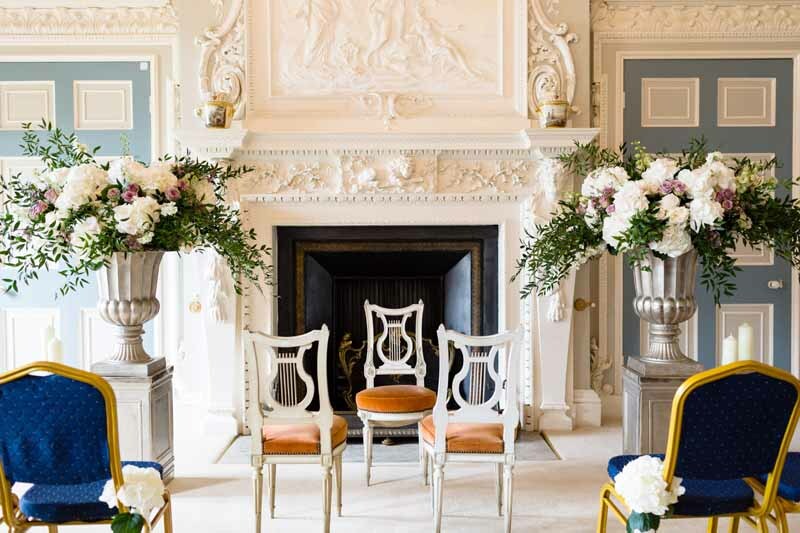 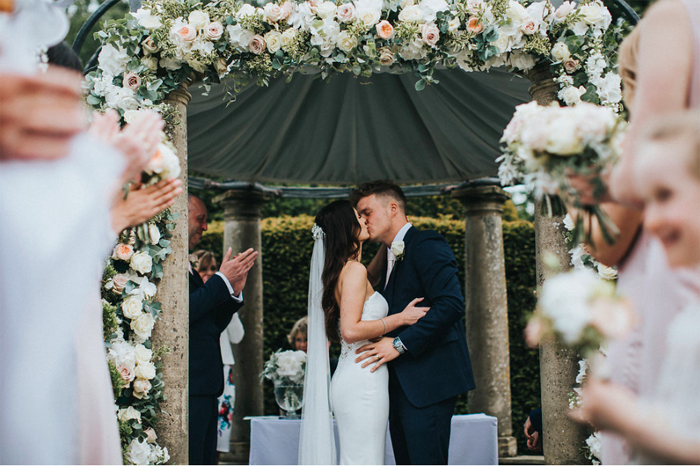 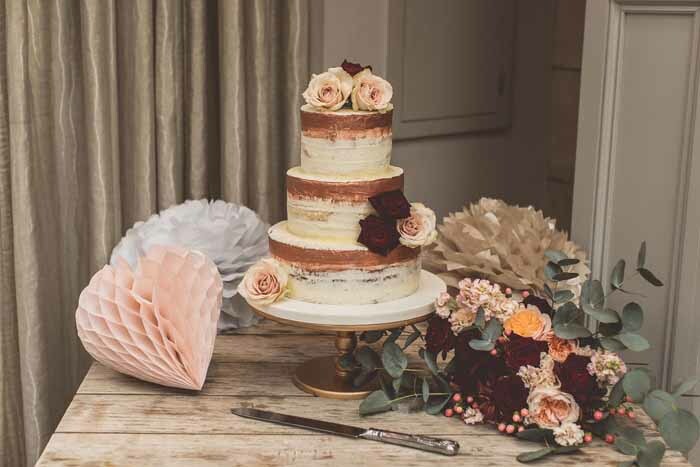 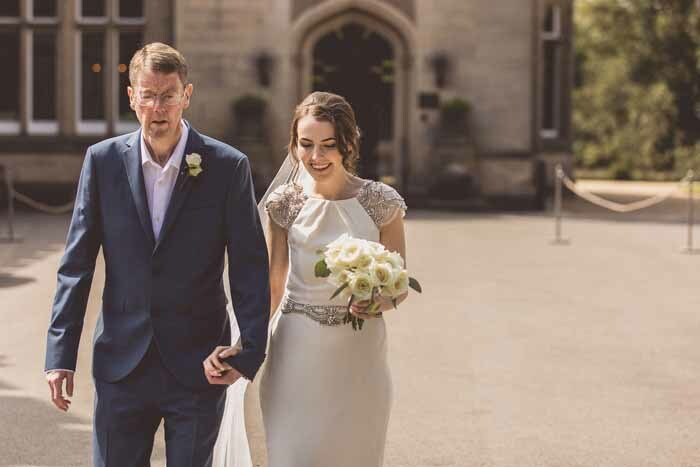 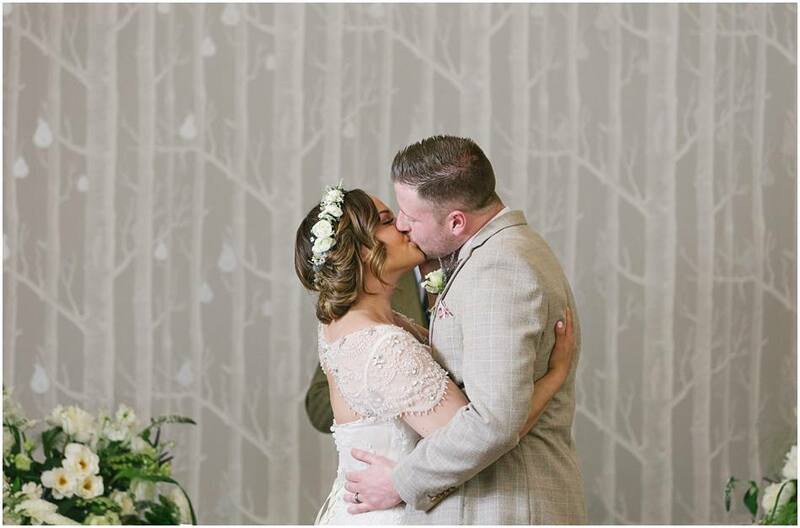 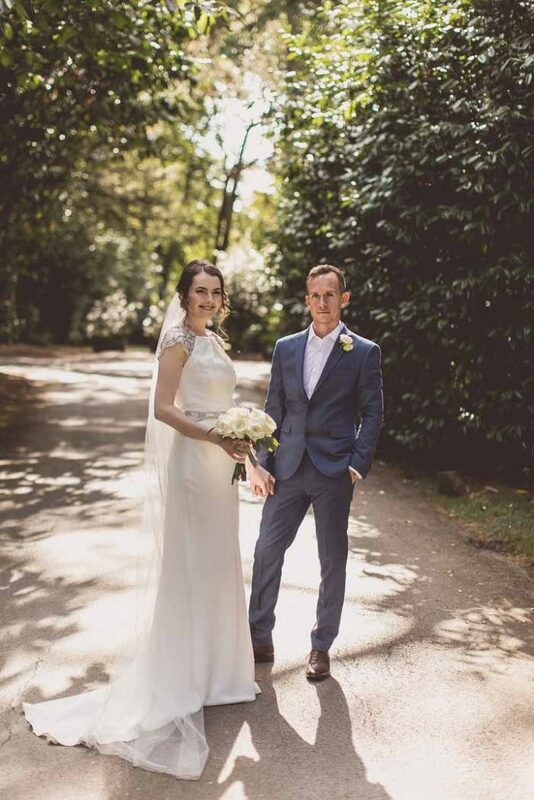 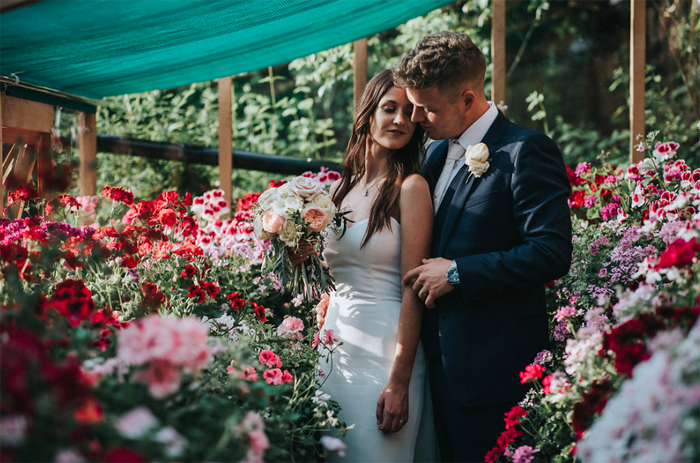 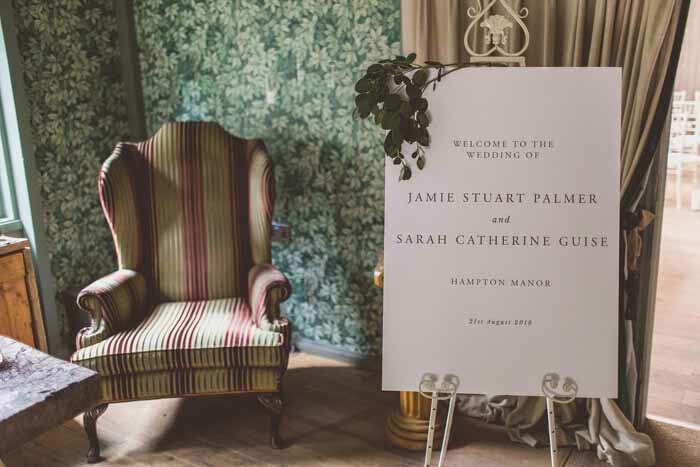 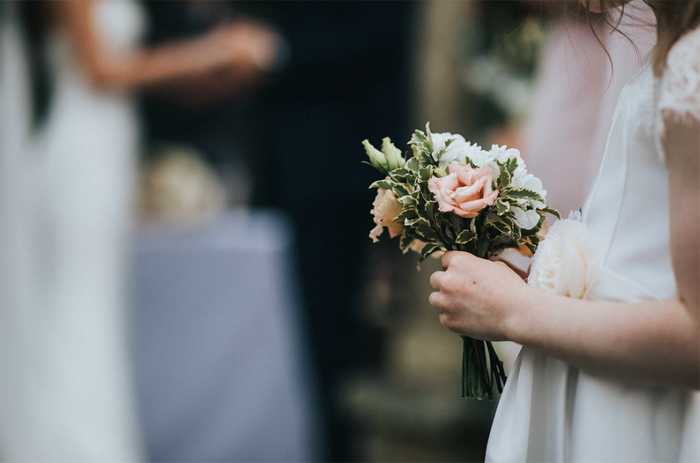 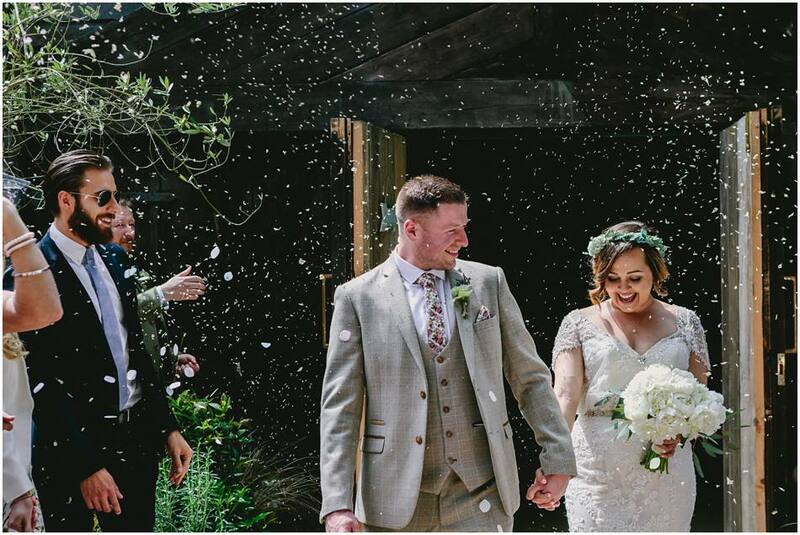 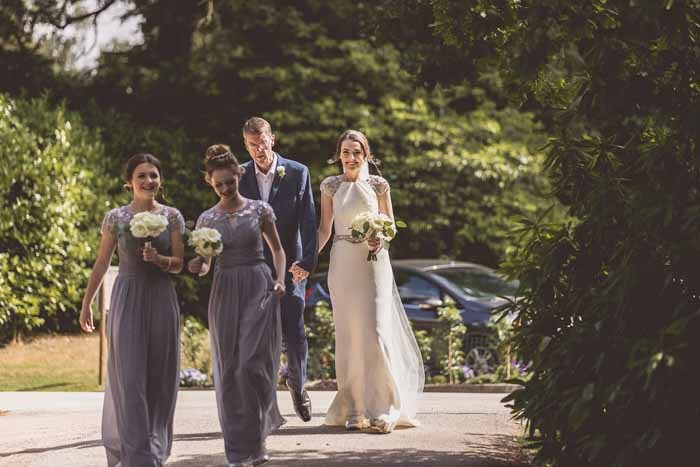 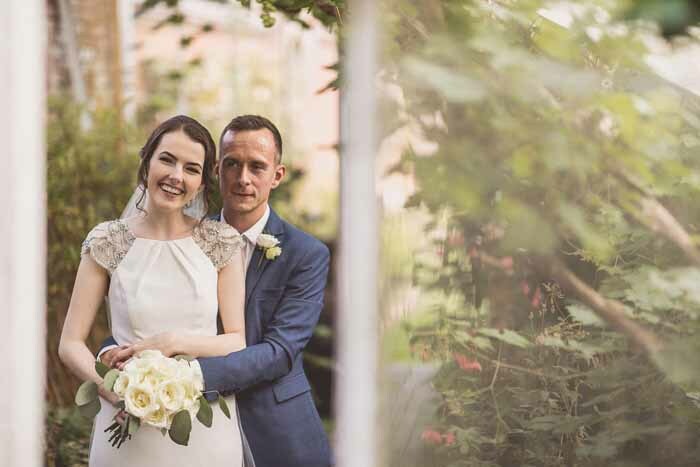 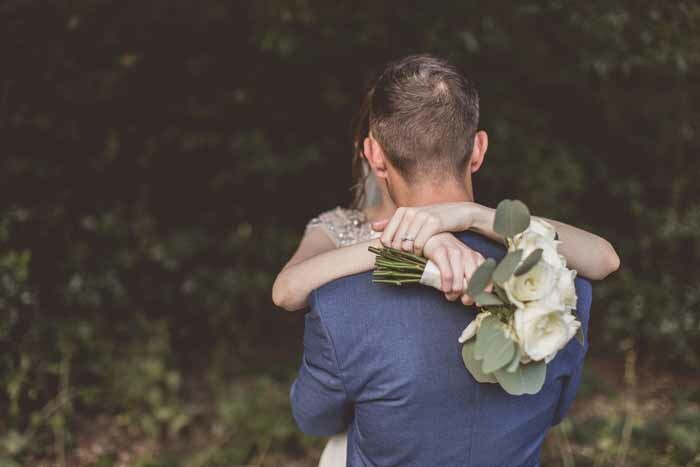 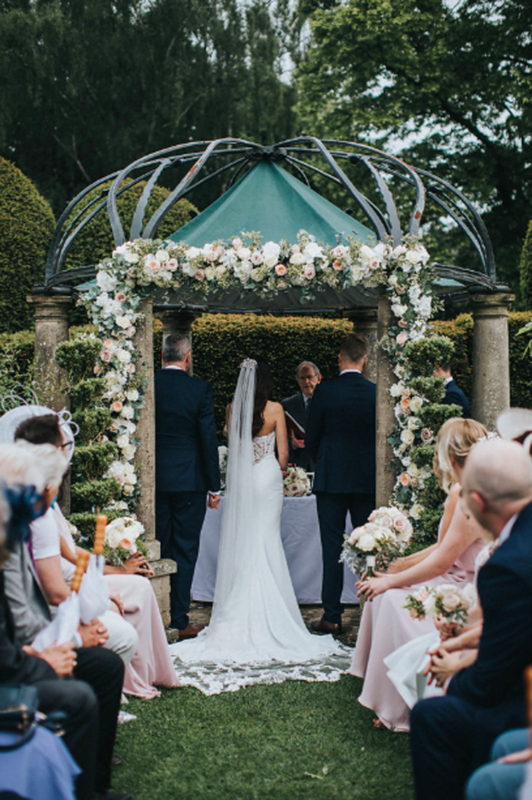 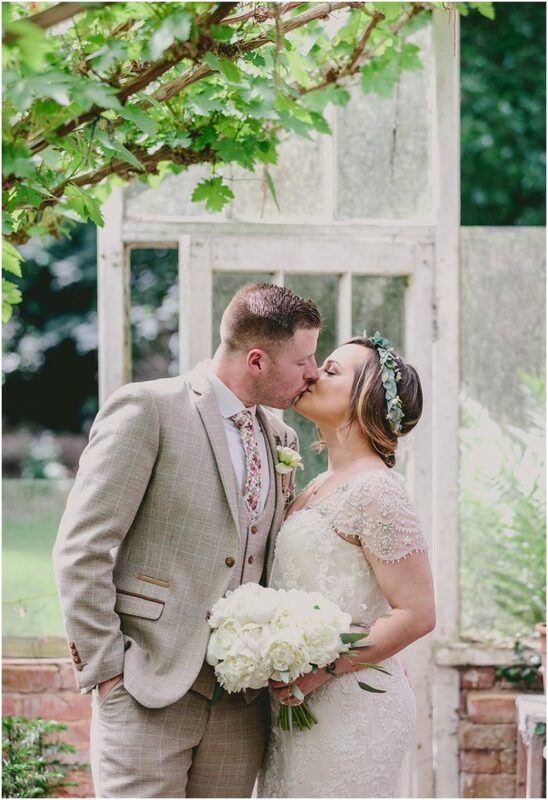 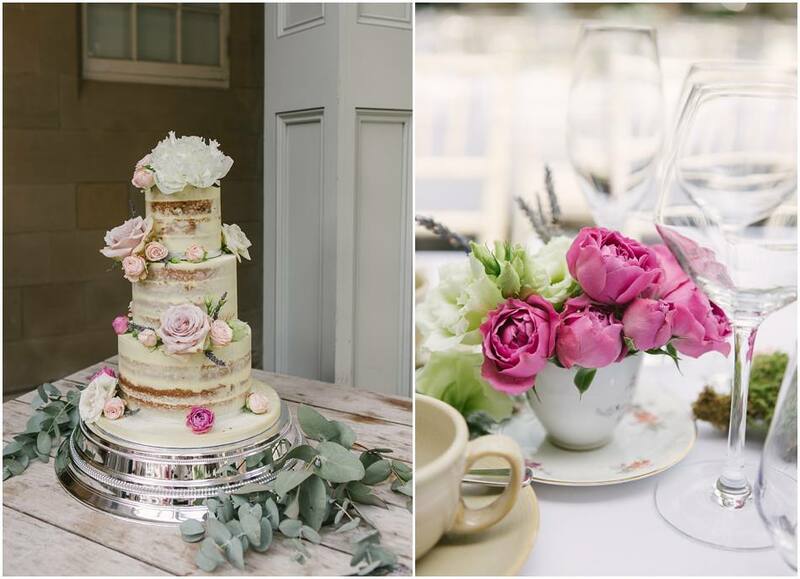 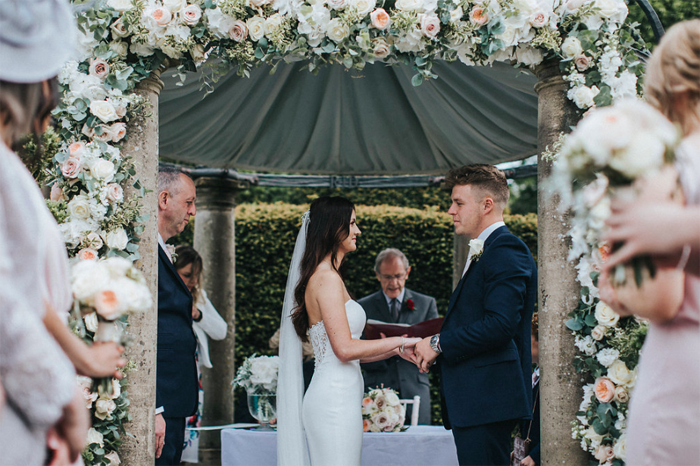 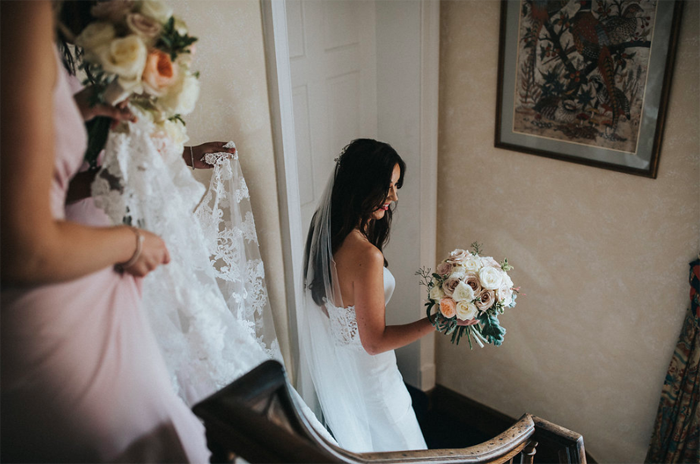 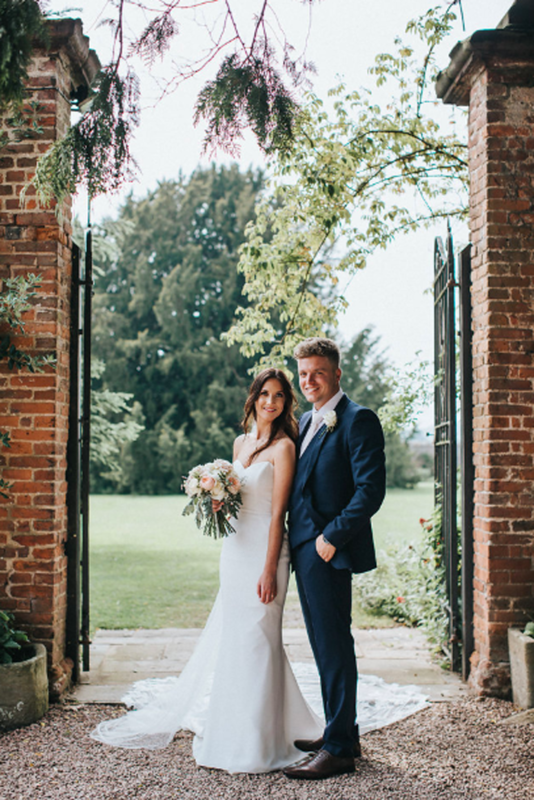 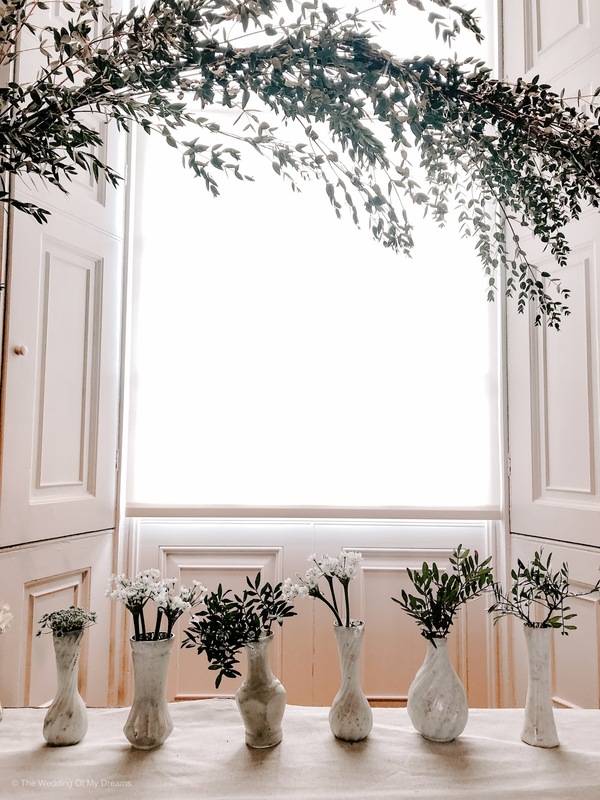 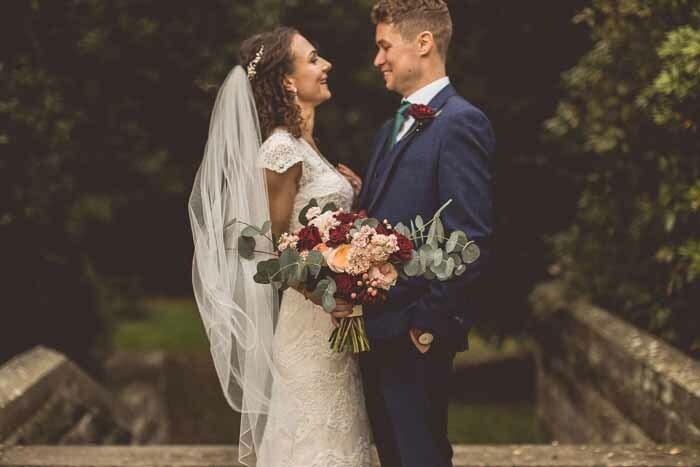 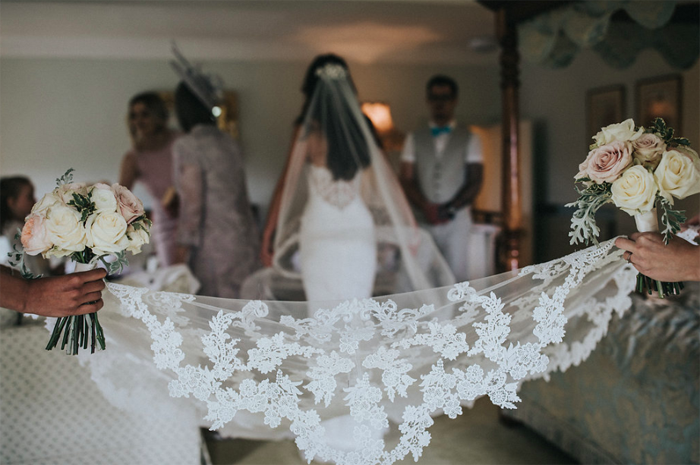 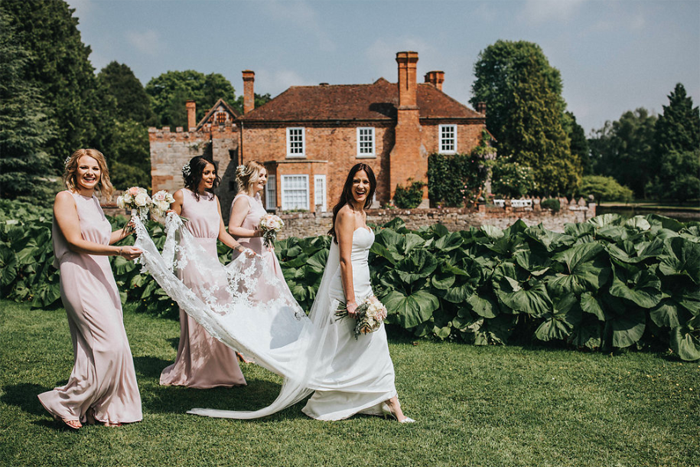 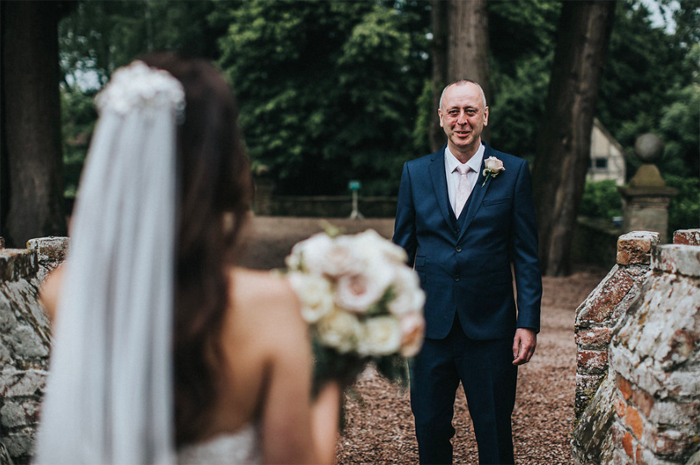 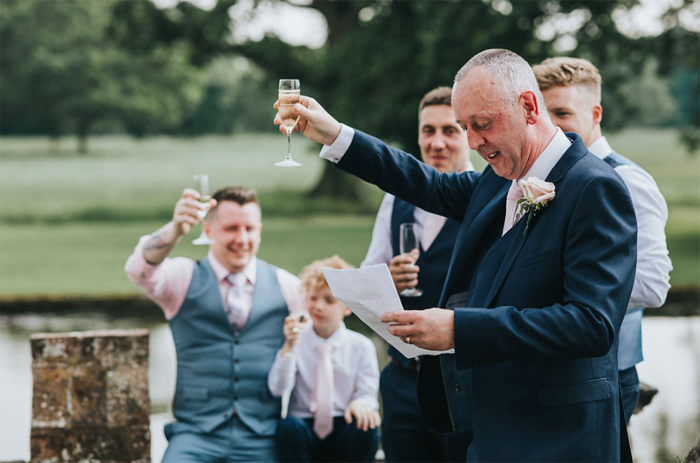 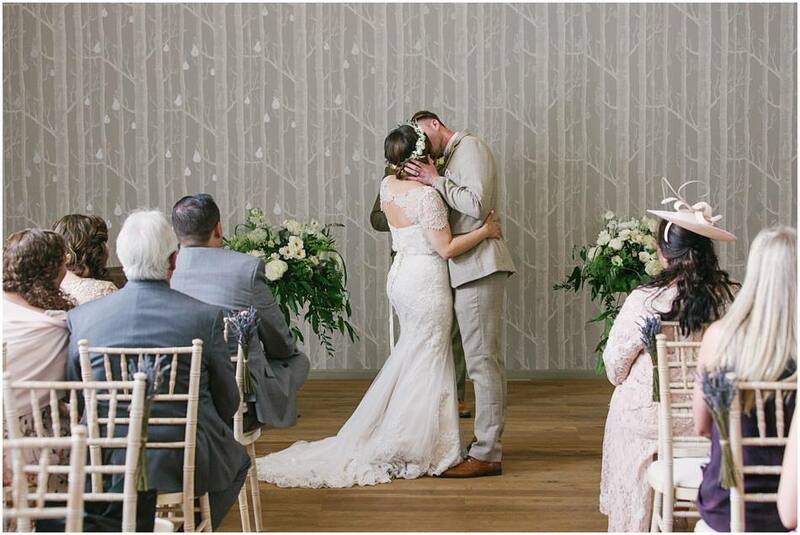 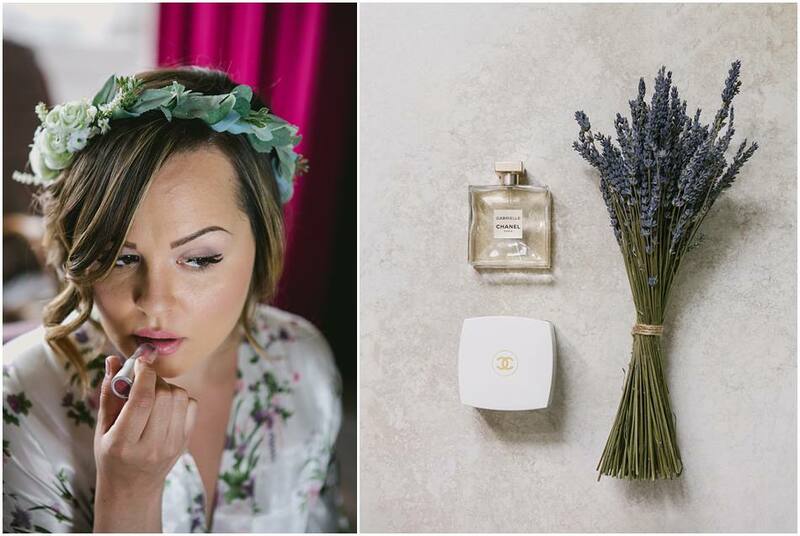 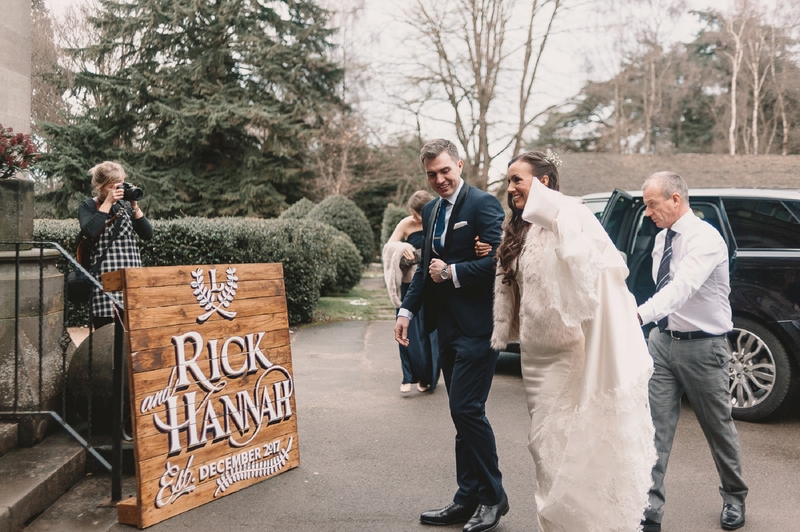 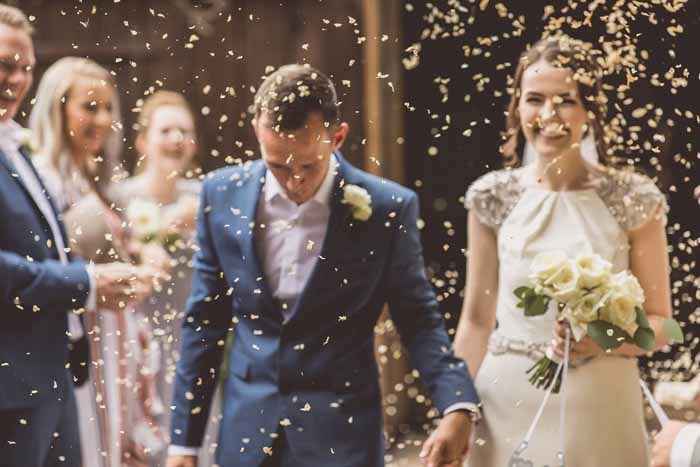 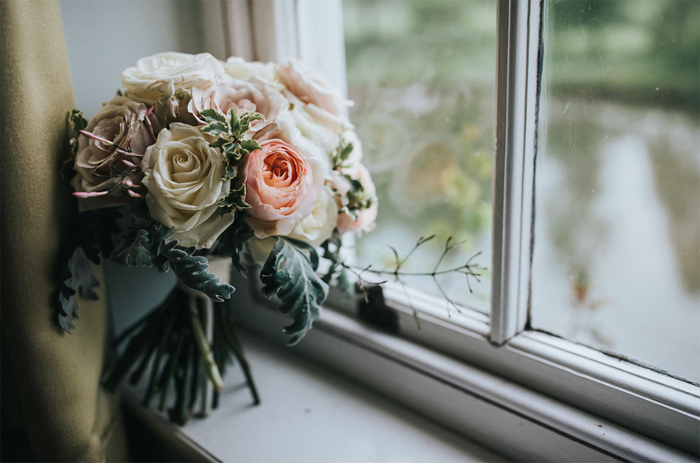 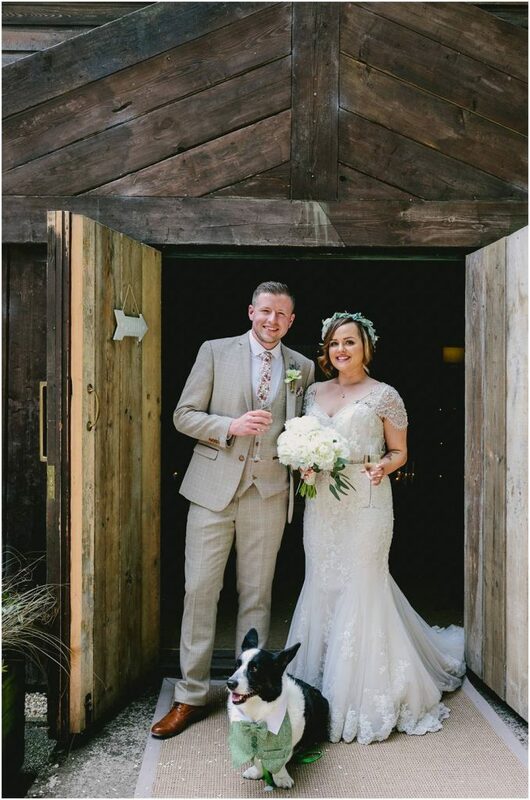 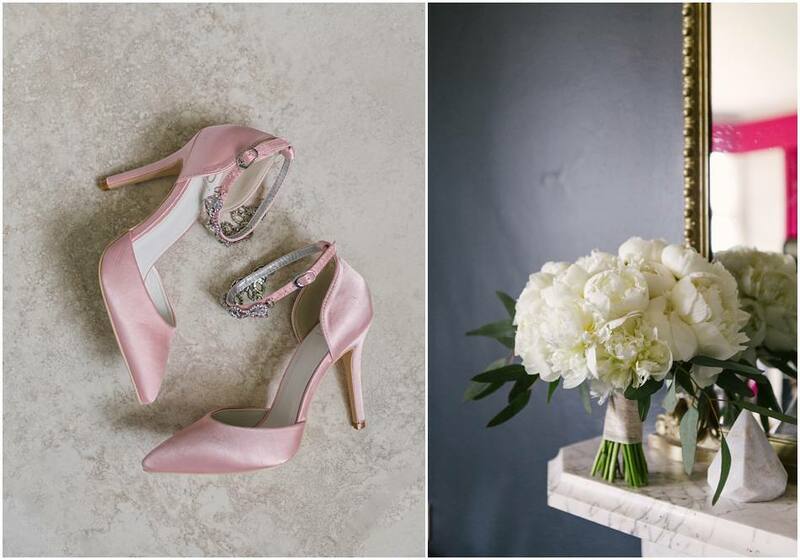 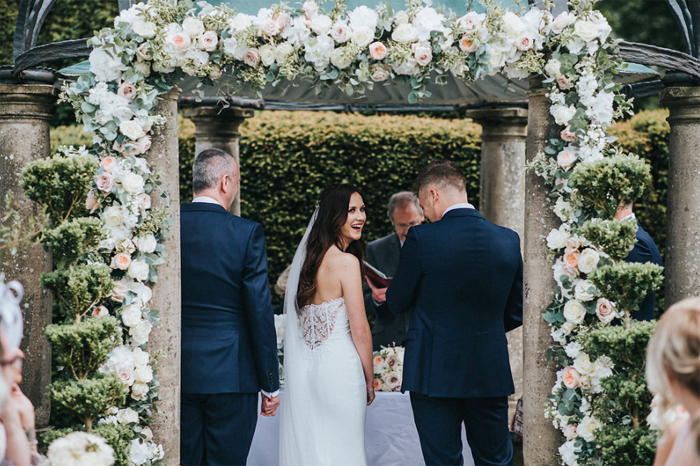 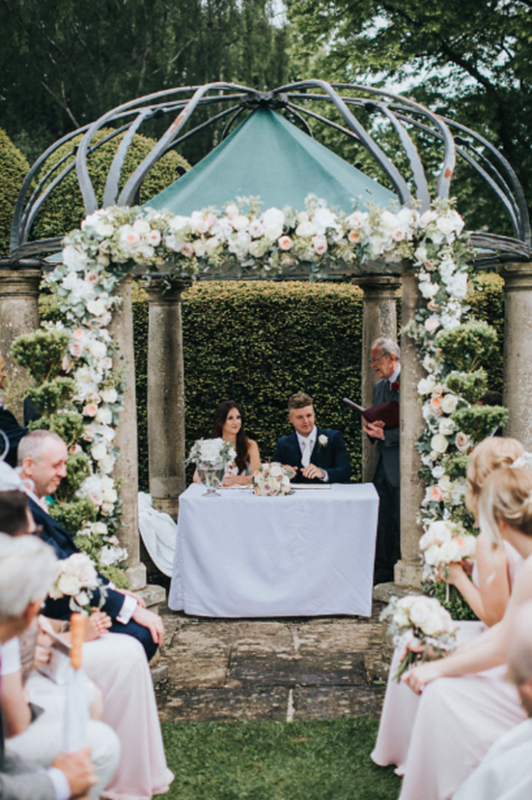 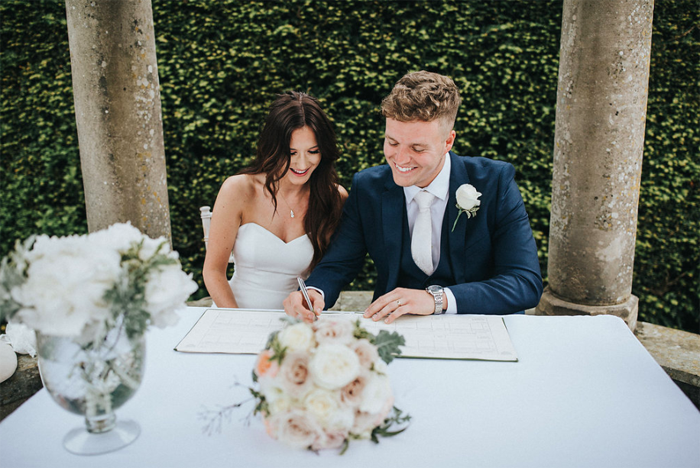 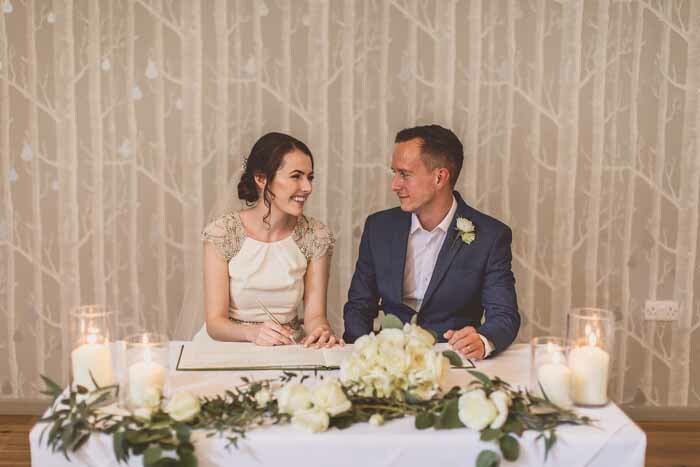 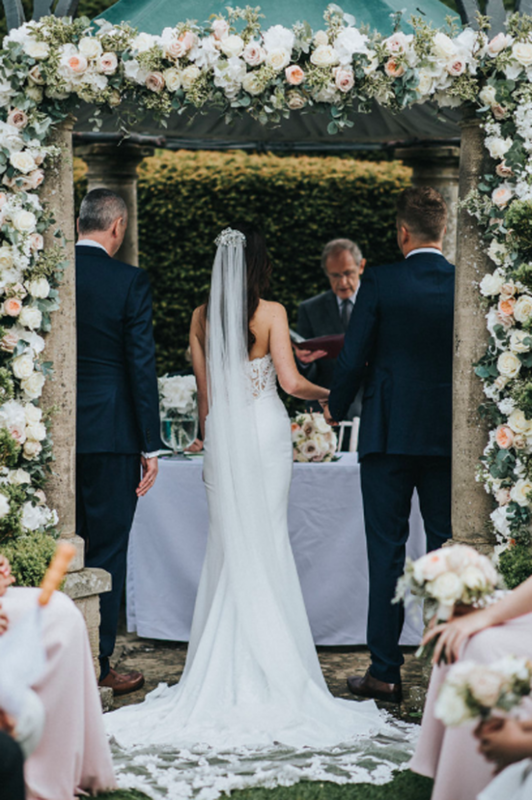 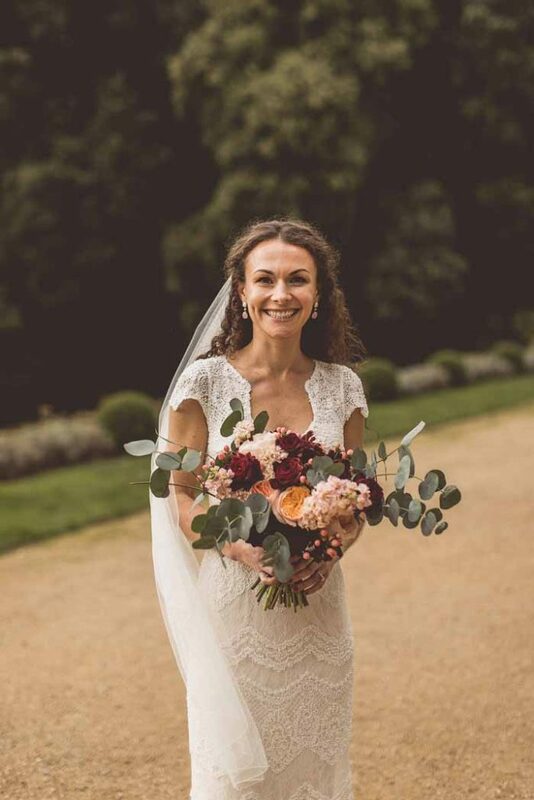 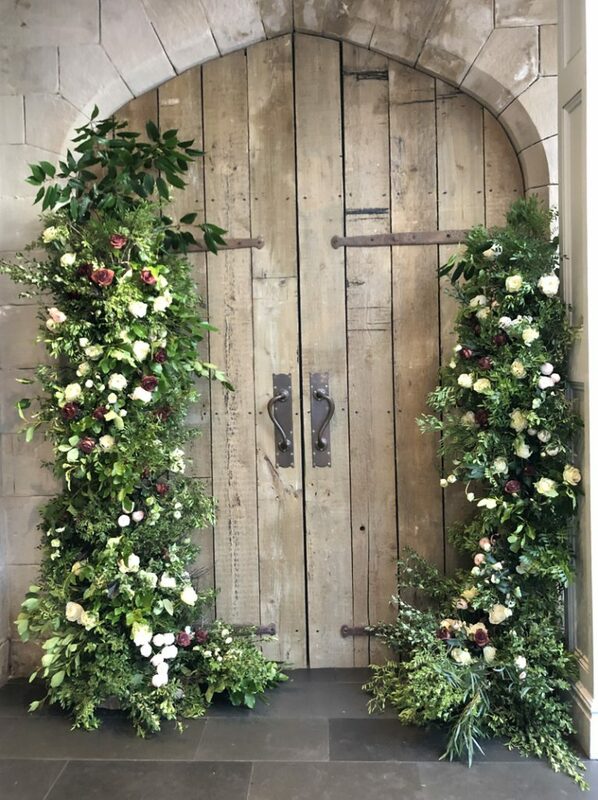 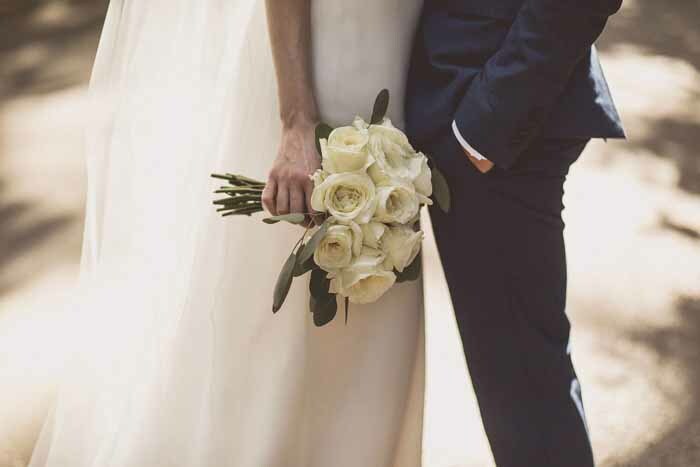 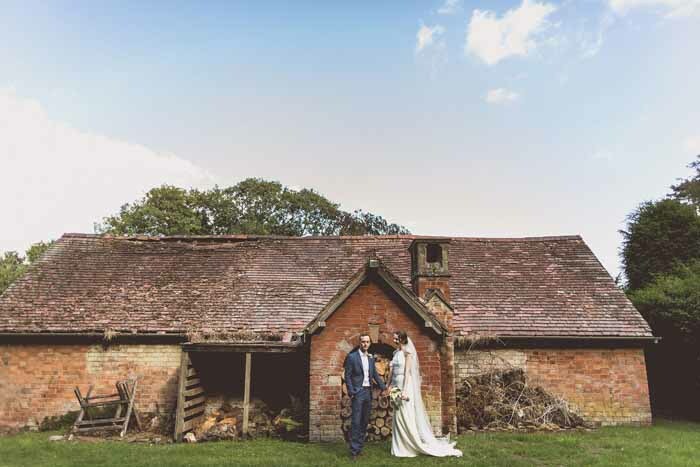 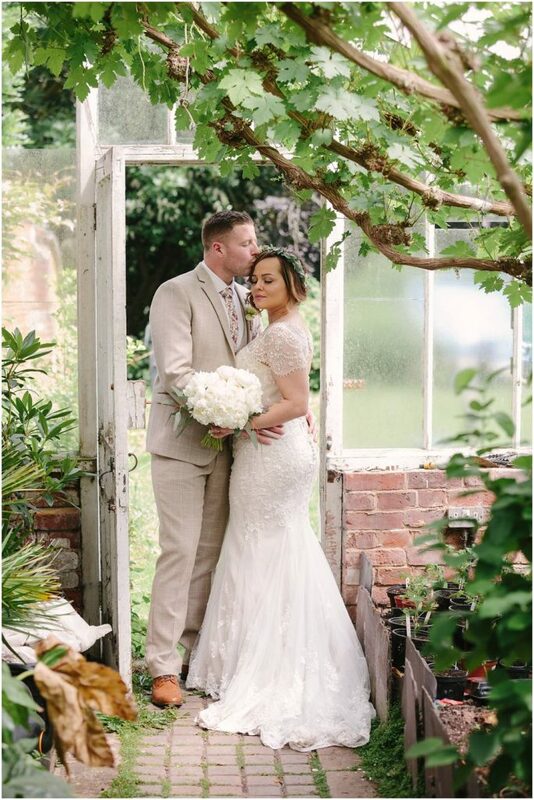 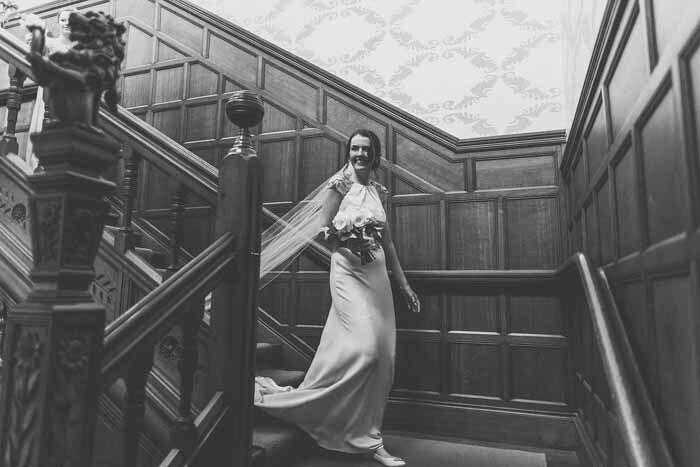 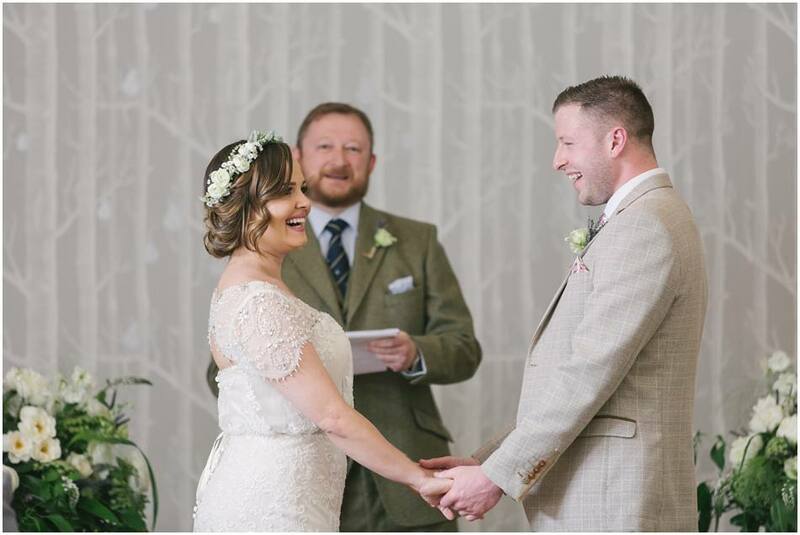 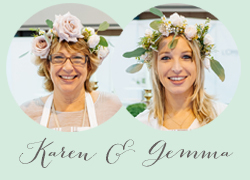 Thank you for sharing your photos to inspire our couples, we loved working with this couple of create their wedding flowers and styling at Hampton Manor and for your lovely words. 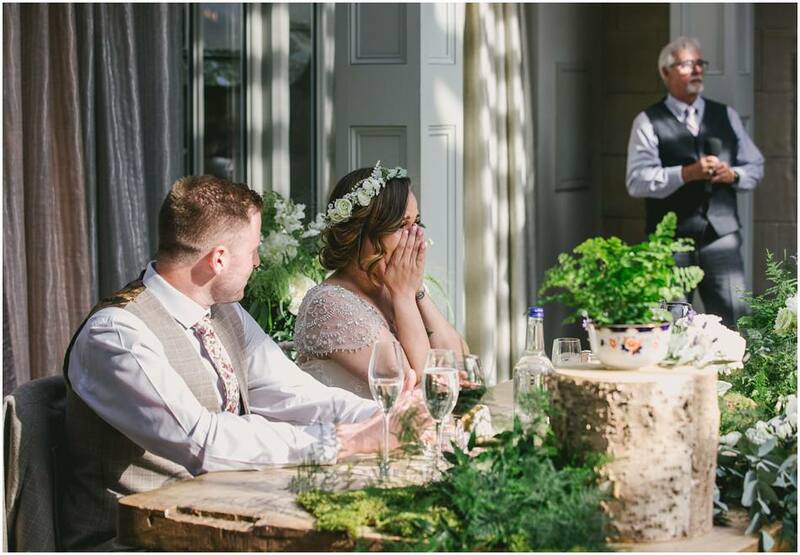 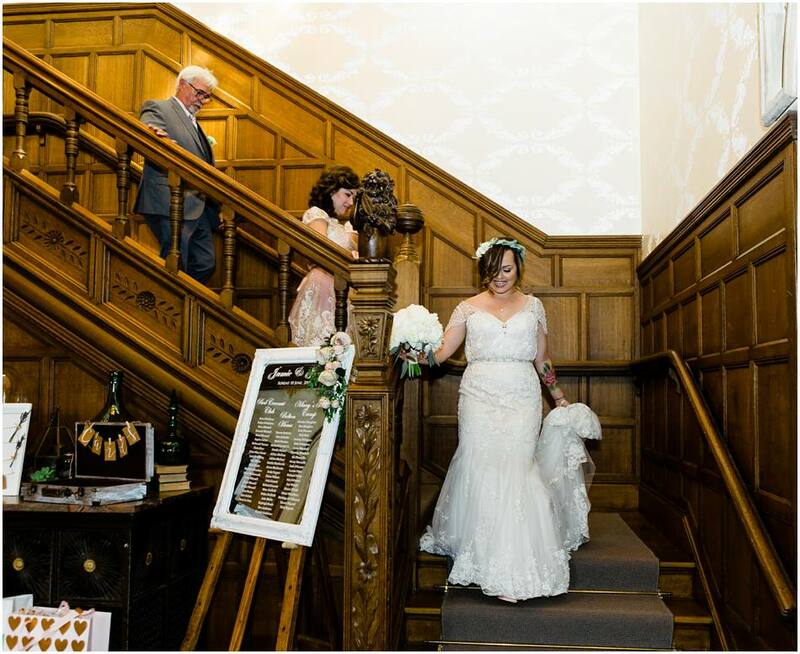 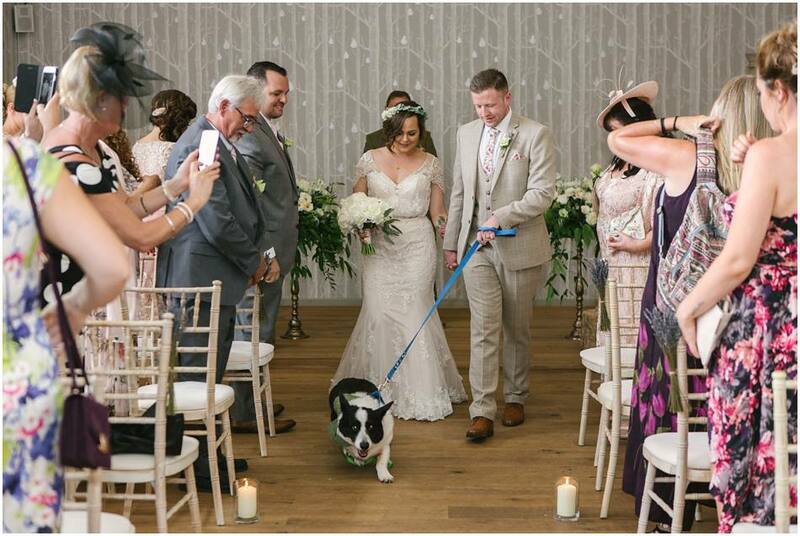 ‘I just wanted to email to say thank you so much for Saturday – the flowers were incredible, better than we could have imagined! The church and Elizabeth Court looked stunning too! 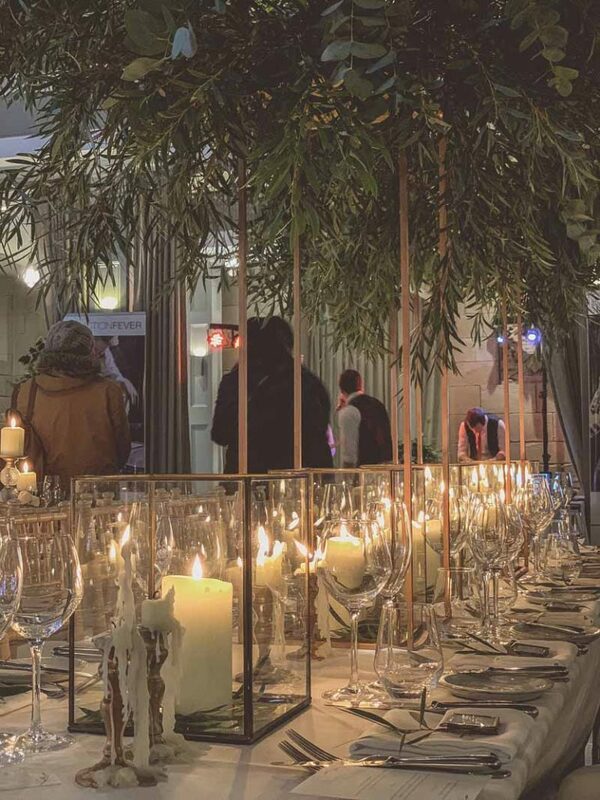 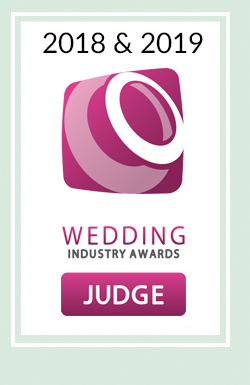 So much work must have gone into getting everything ready and we are very grateful for that. 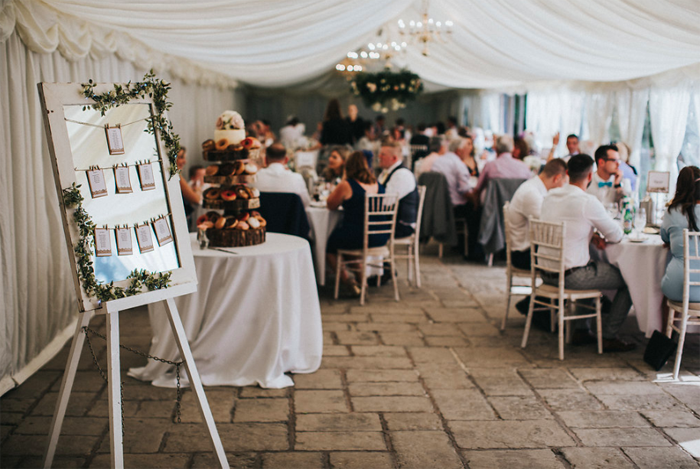 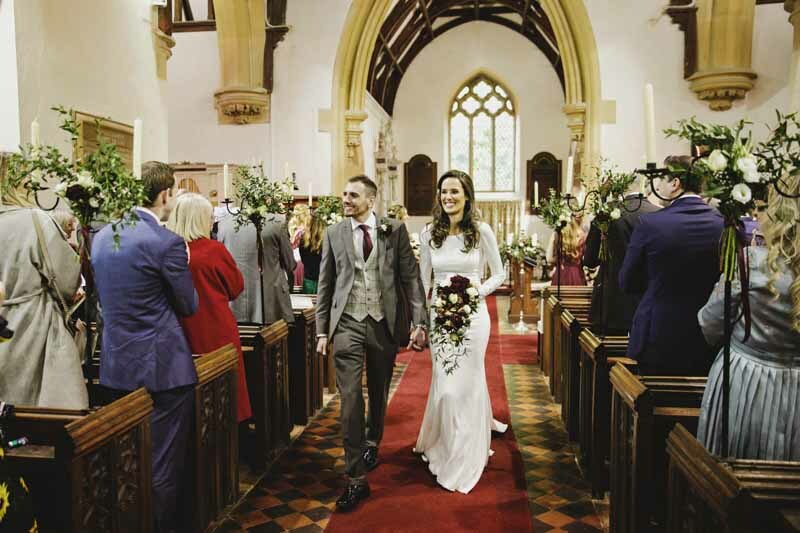 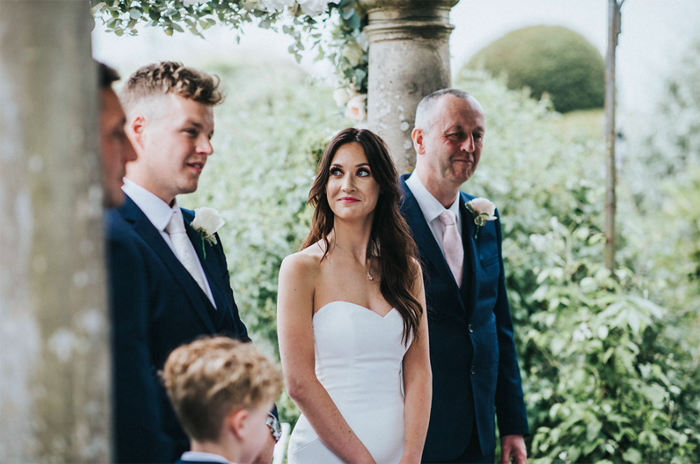 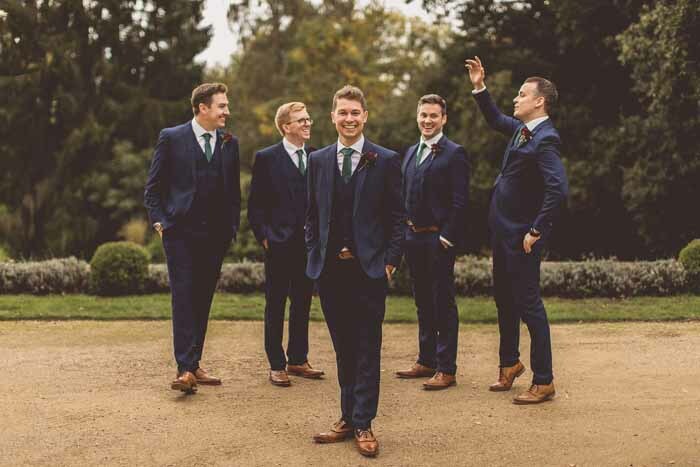 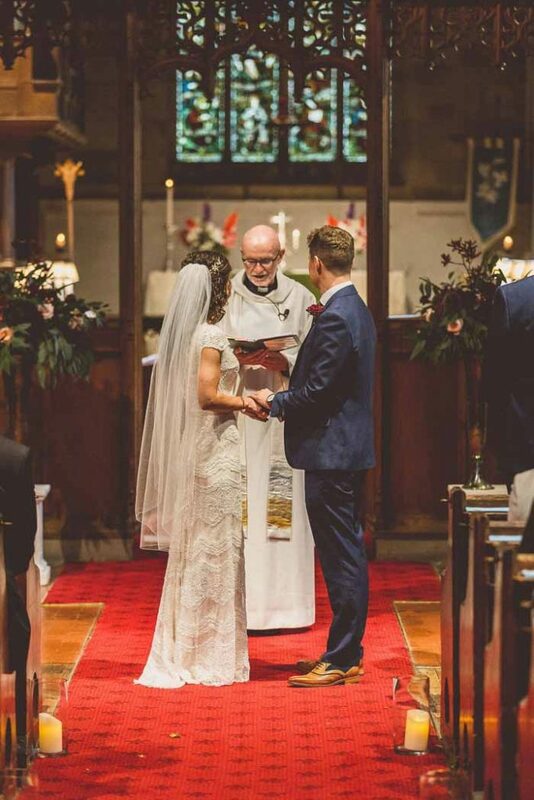 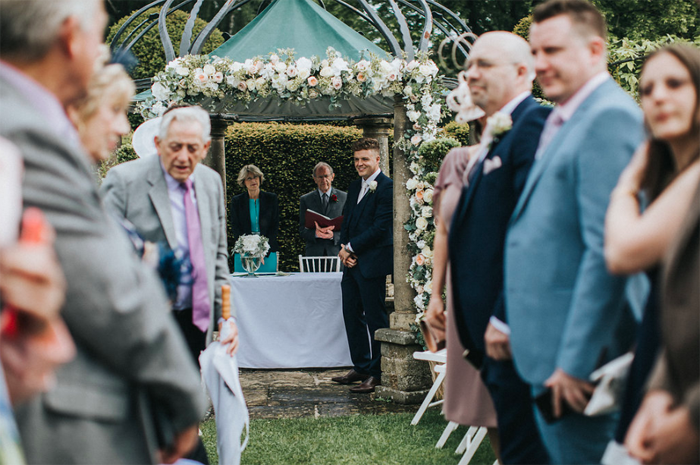 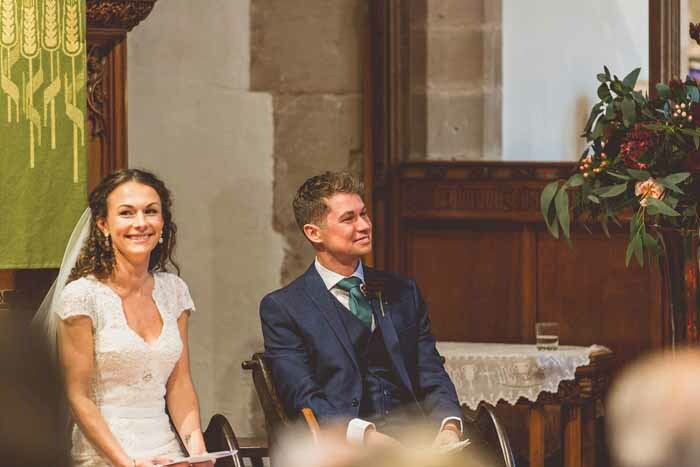 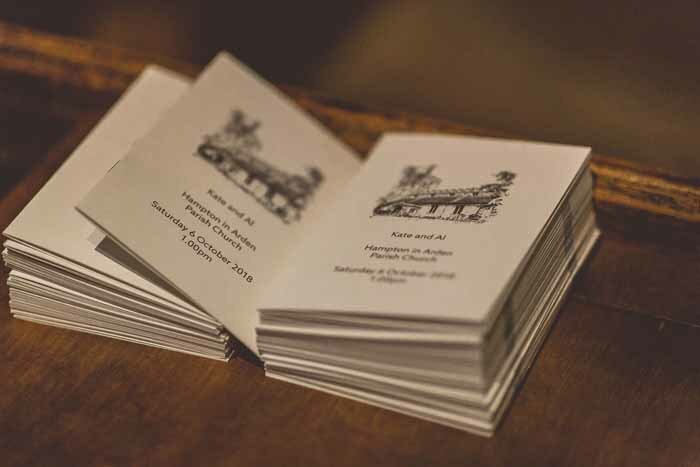 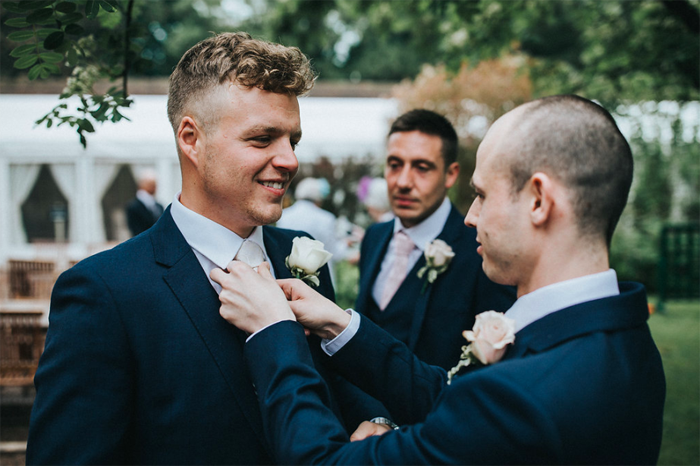 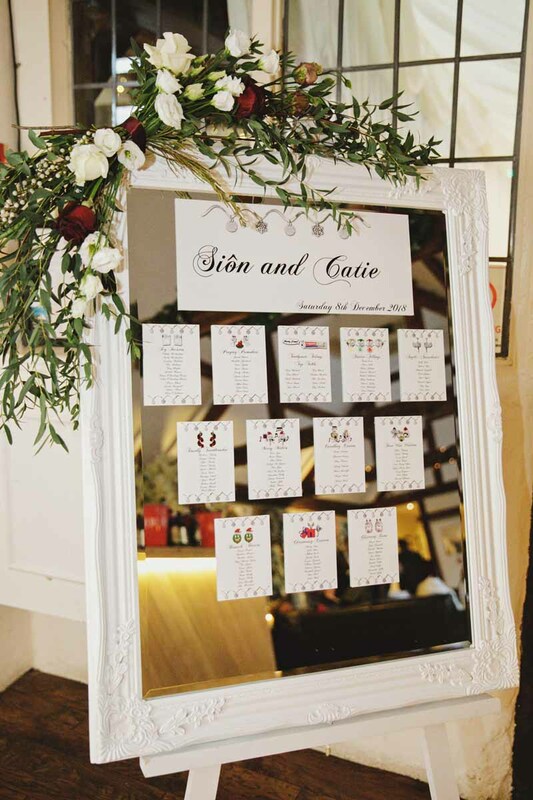 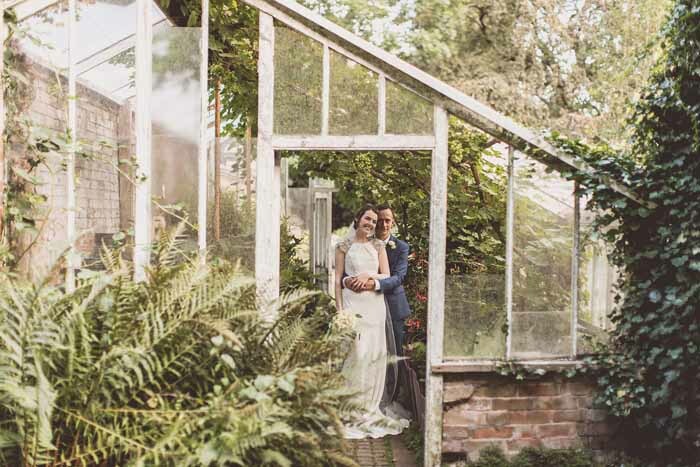 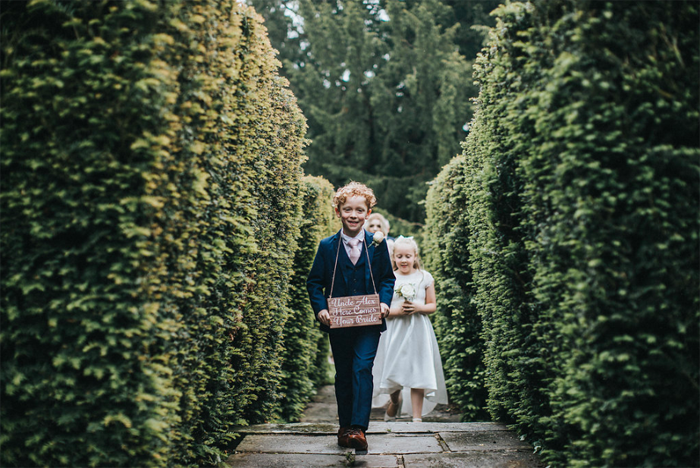 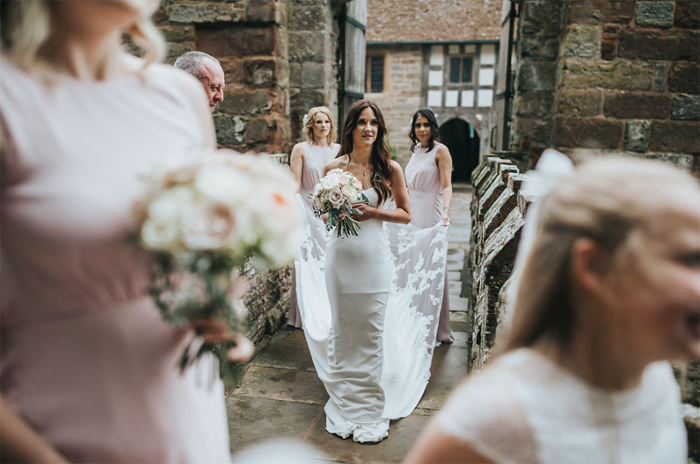 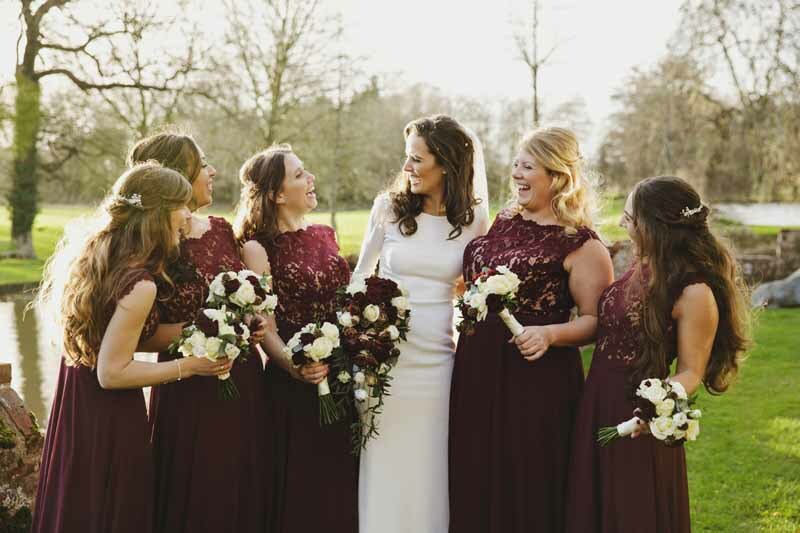 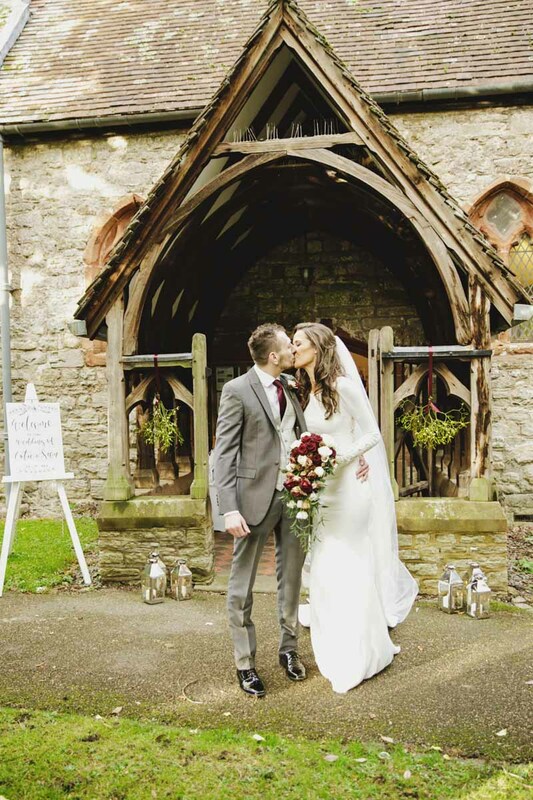 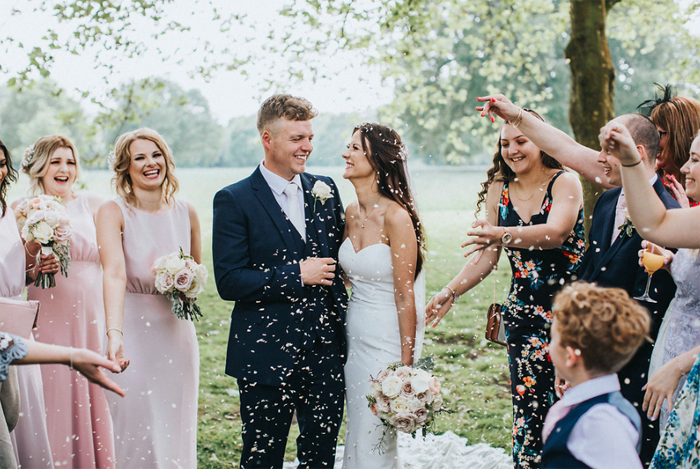 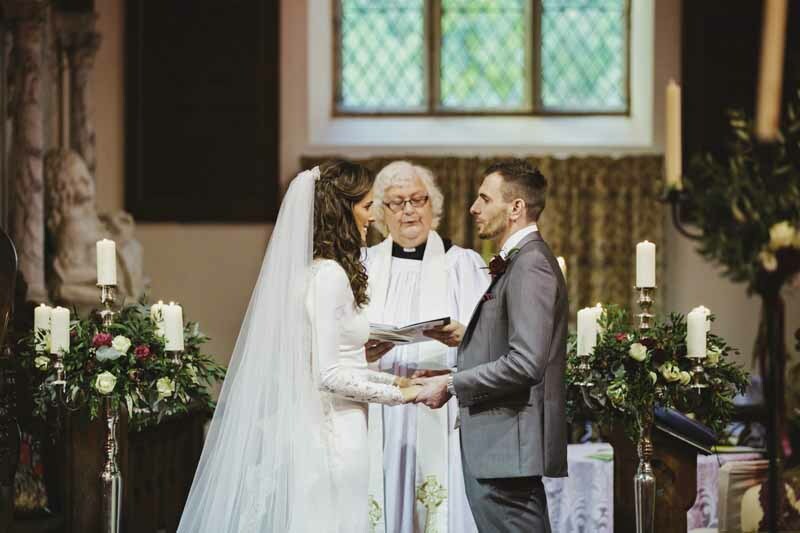 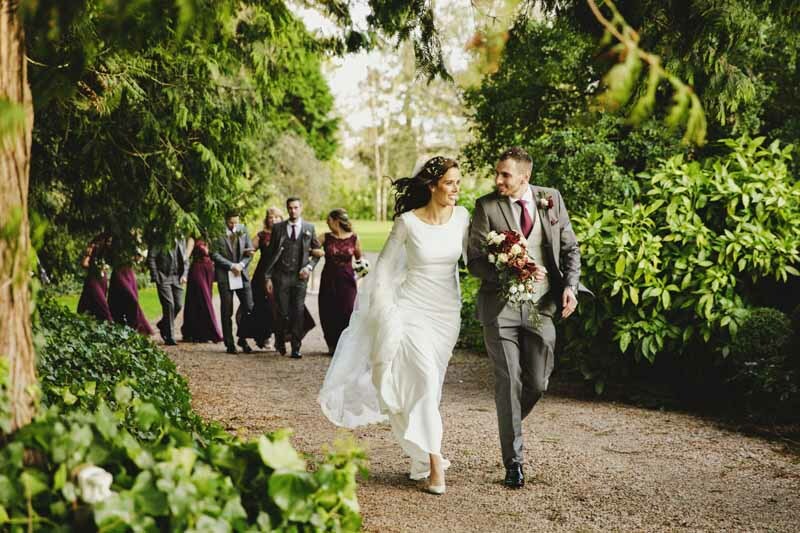 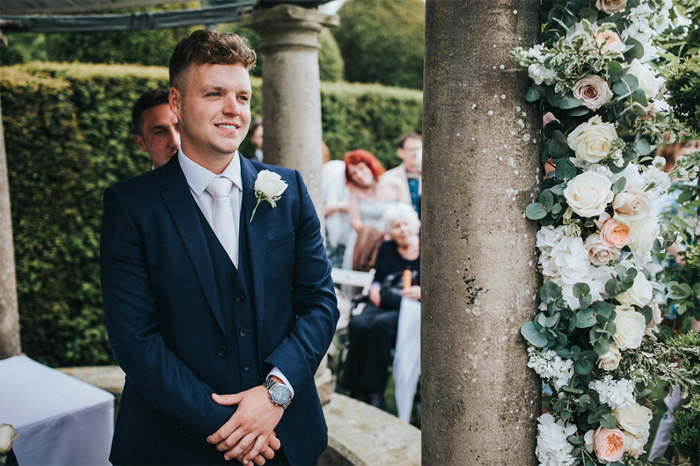 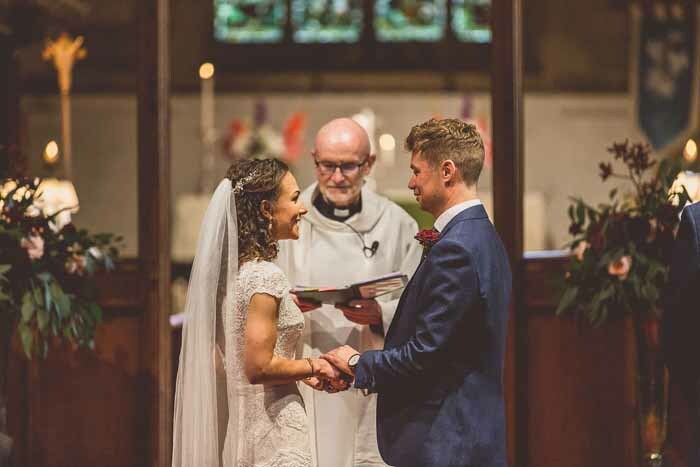 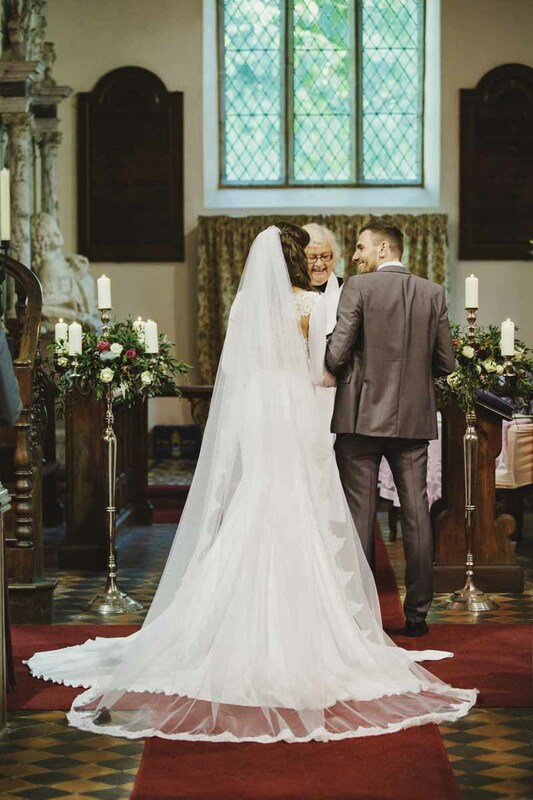 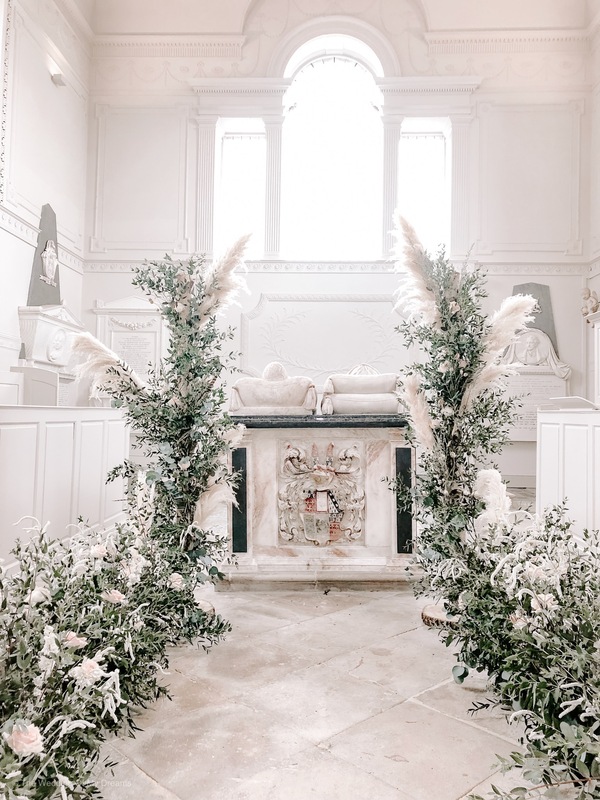 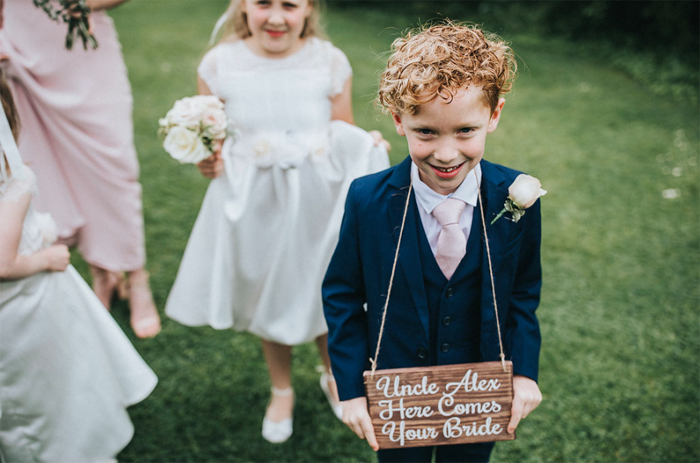 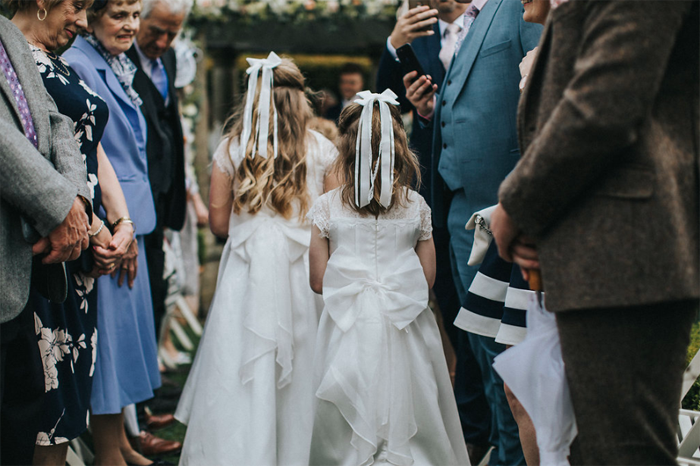 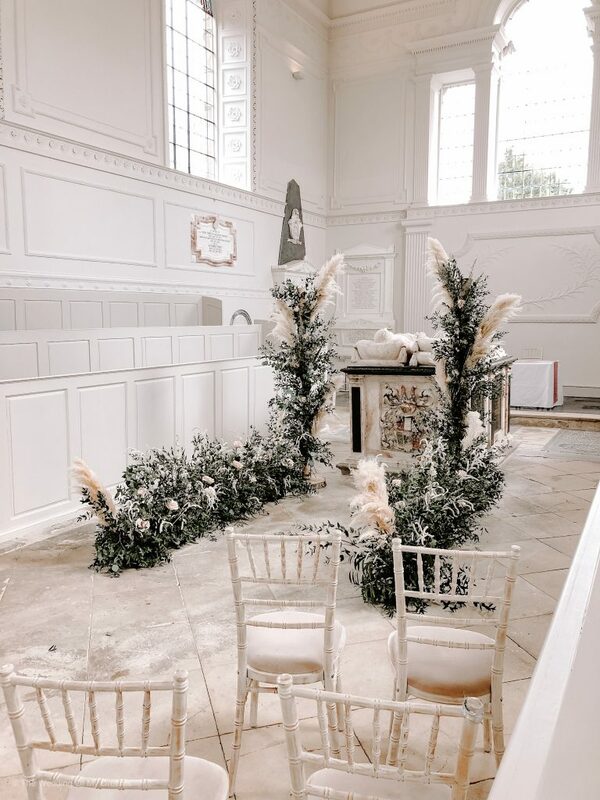 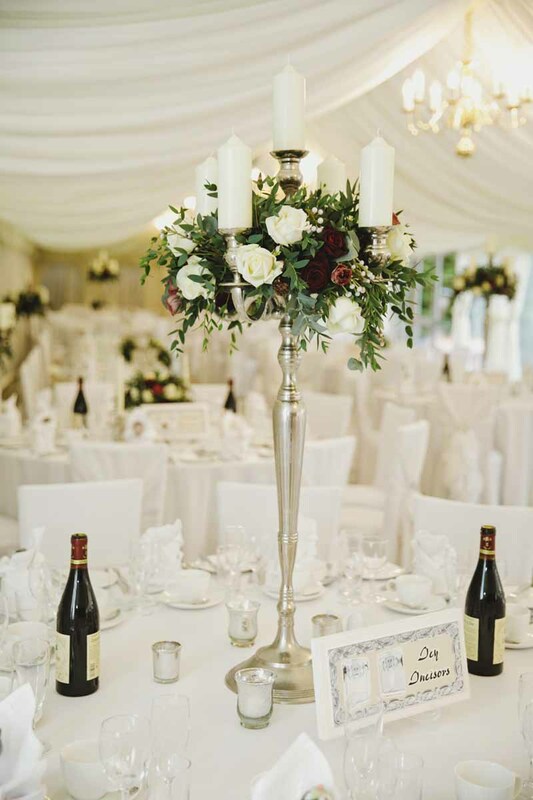 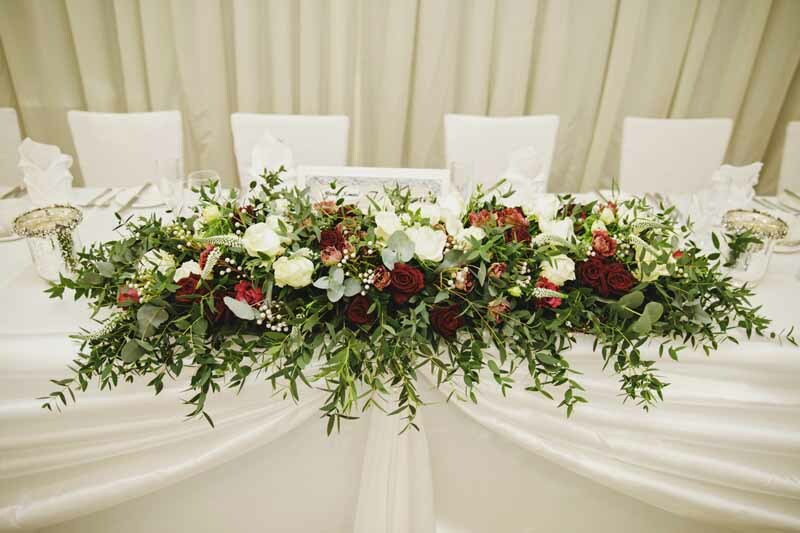 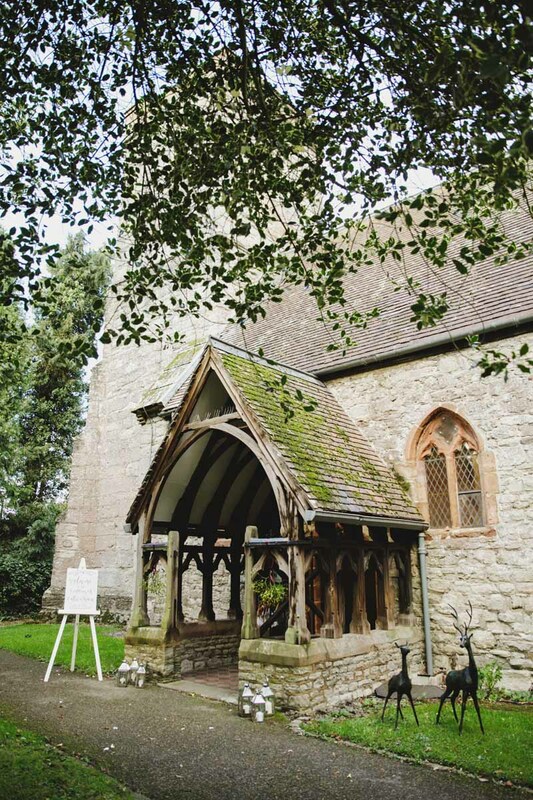 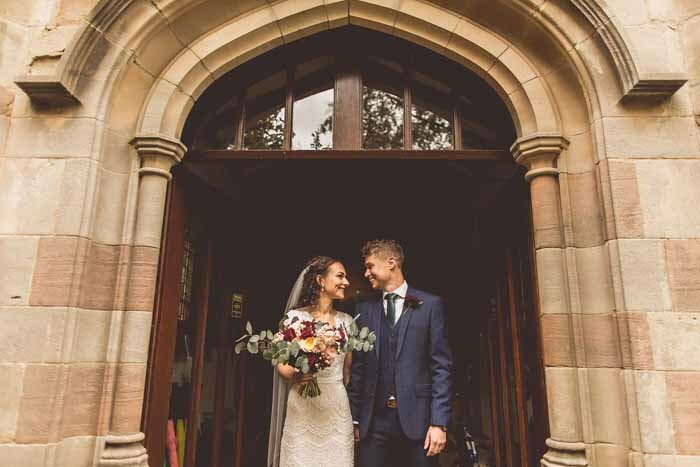 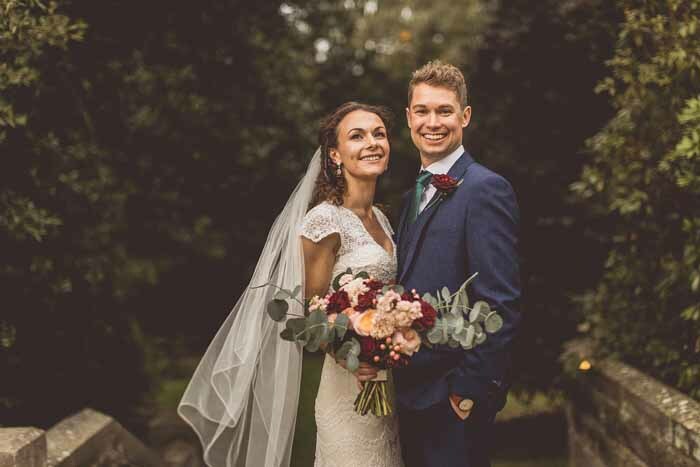 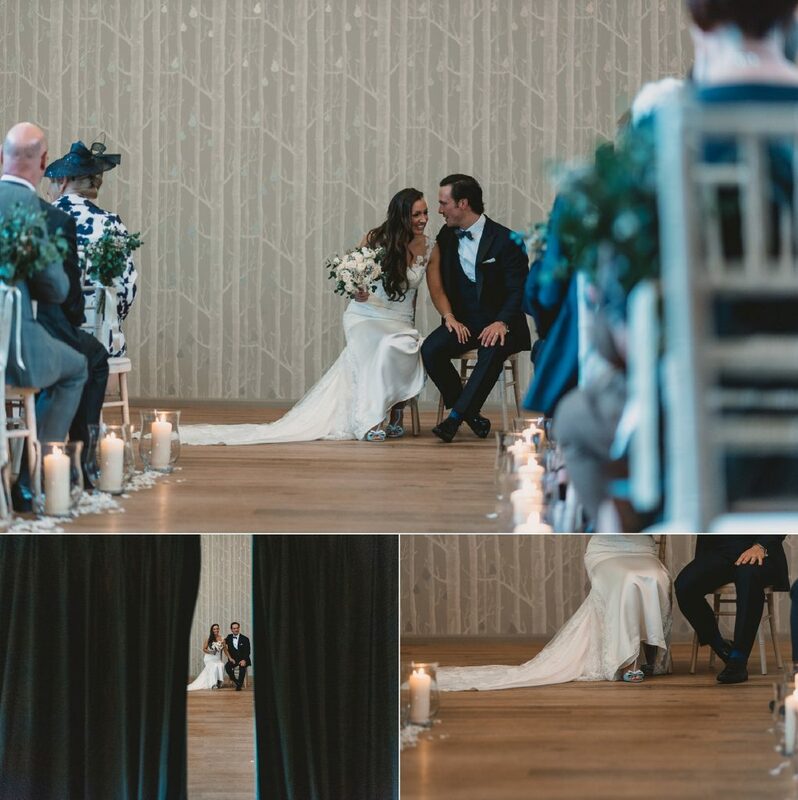 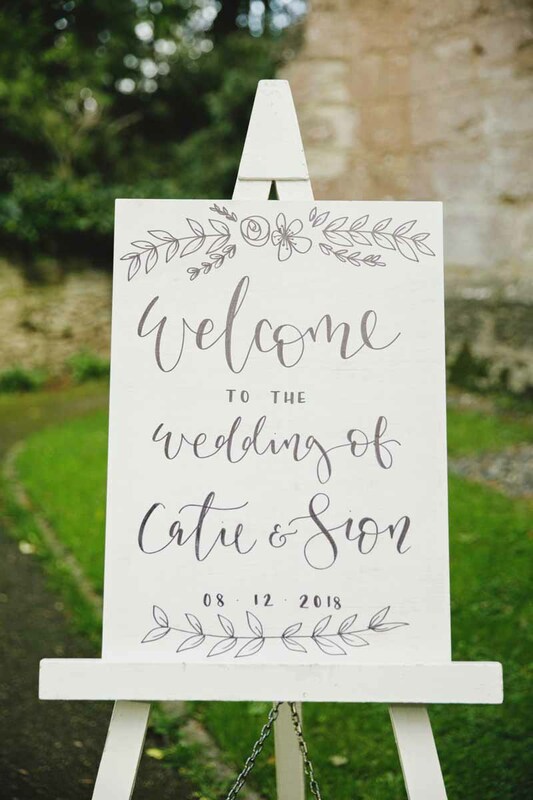 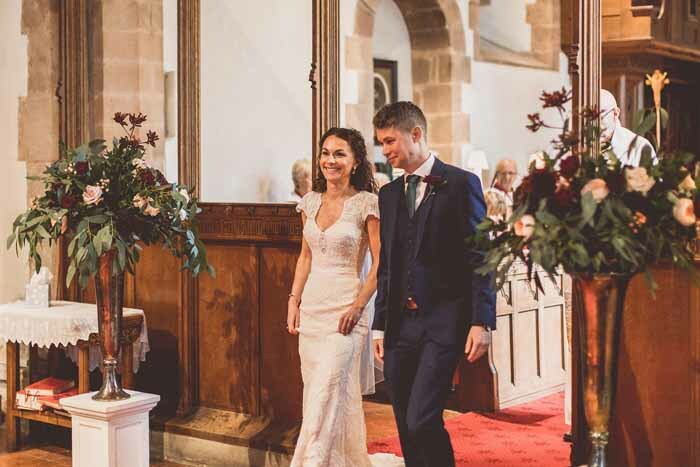 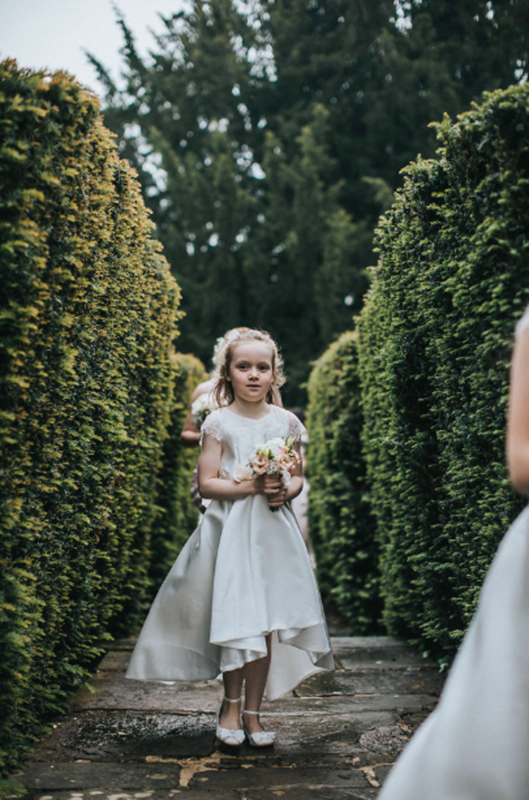 Catie and Sion chose Birtsmorton Church and Court for their elegant winder wonderland wedding with white silver and green colours and highlights of burgundy red. 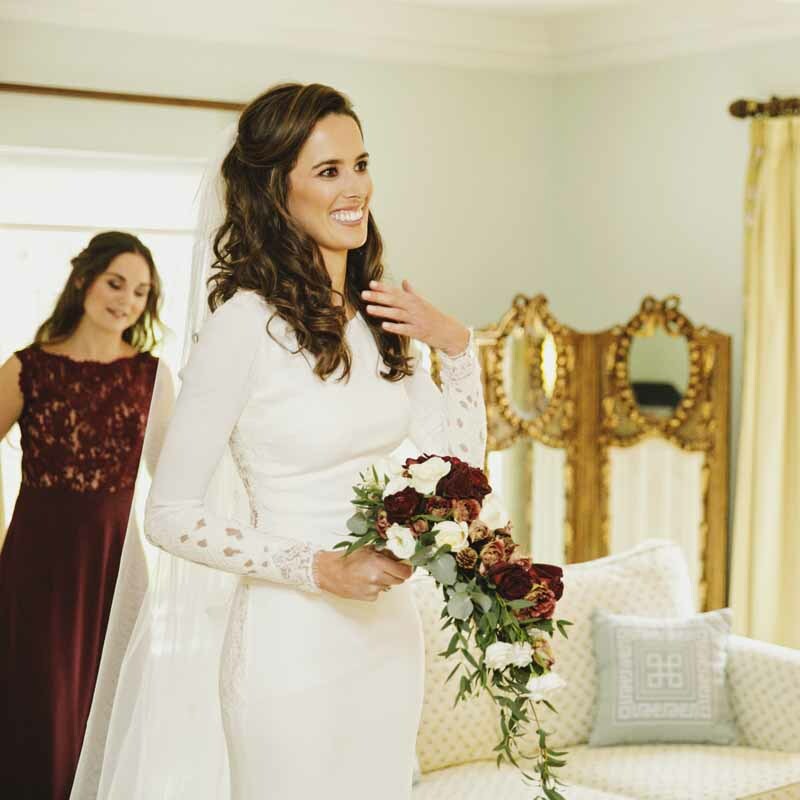 Catie’s elegant wedding dress suited a neat, trailing bouquet. 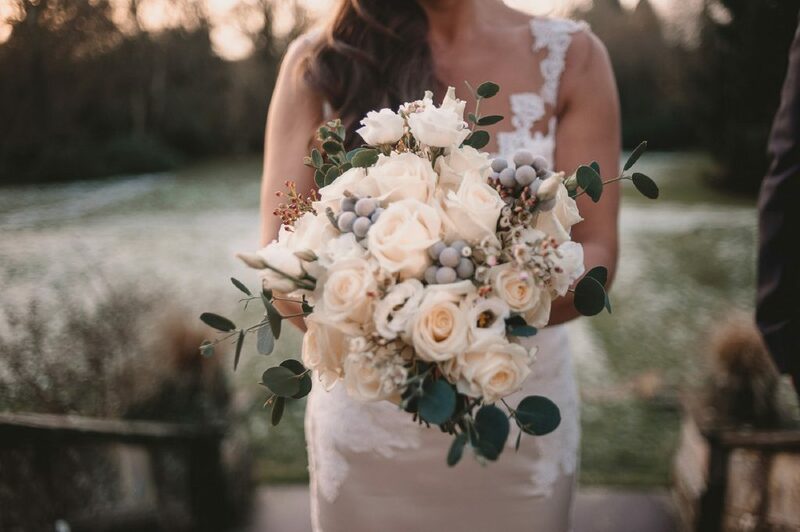 Natural flowers we included were a mix of roses, lisianthus, petite larch cones, and sprigs of eucalyptus to add a trail to the bouquet. 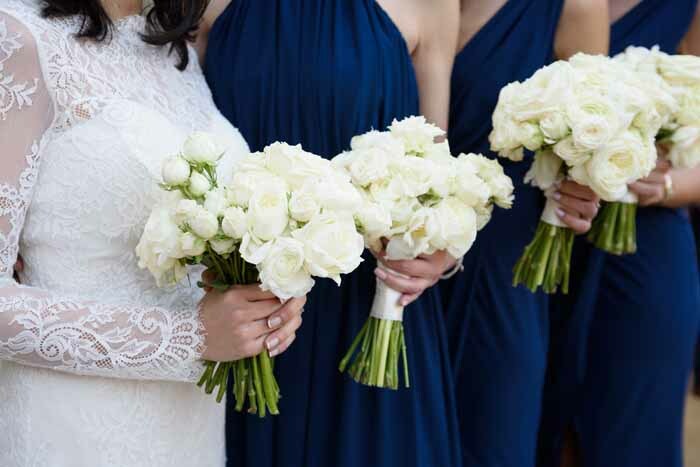 Her choice of bouquet was also dear to her as her mother carried an elegant trailing bouquet at her own wedding. 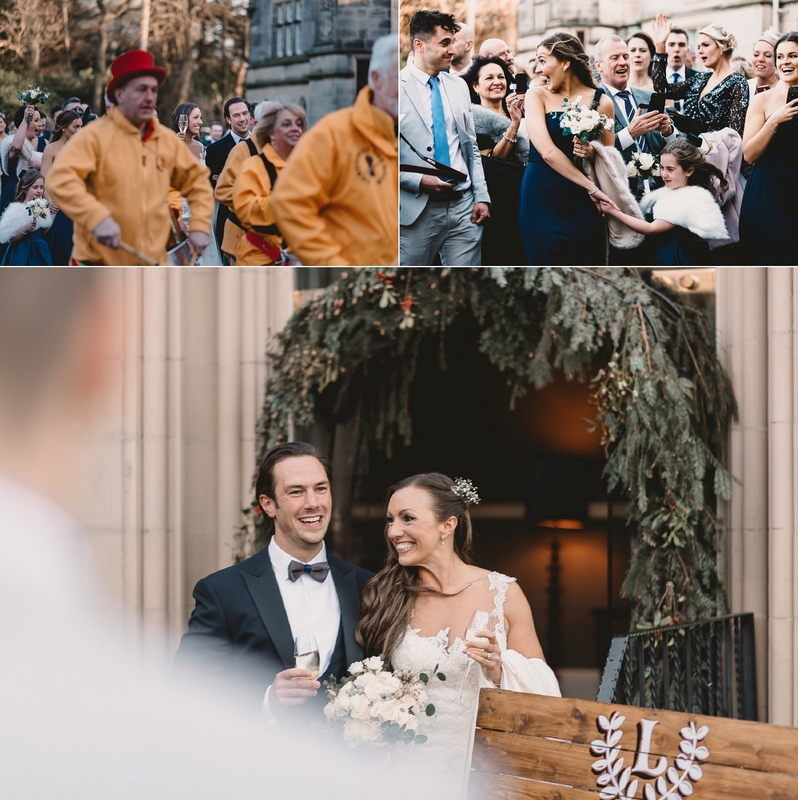 Winter button holes included a touch of larch cone for a wintry look. 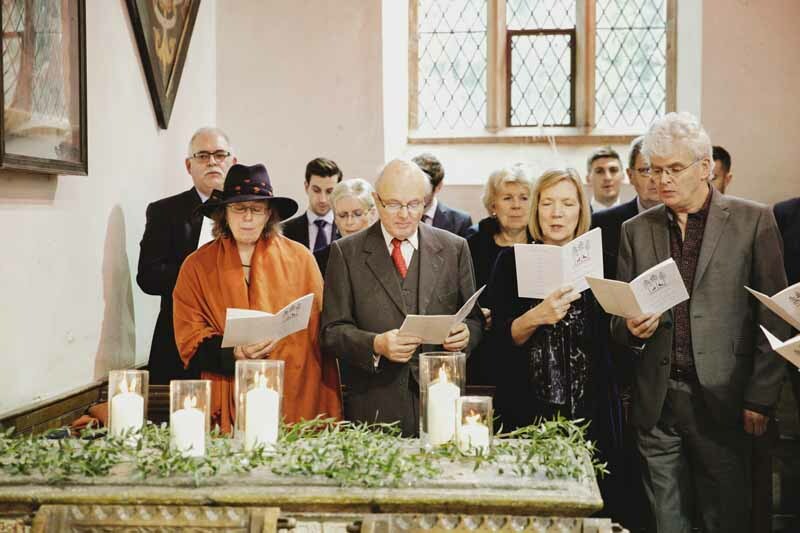 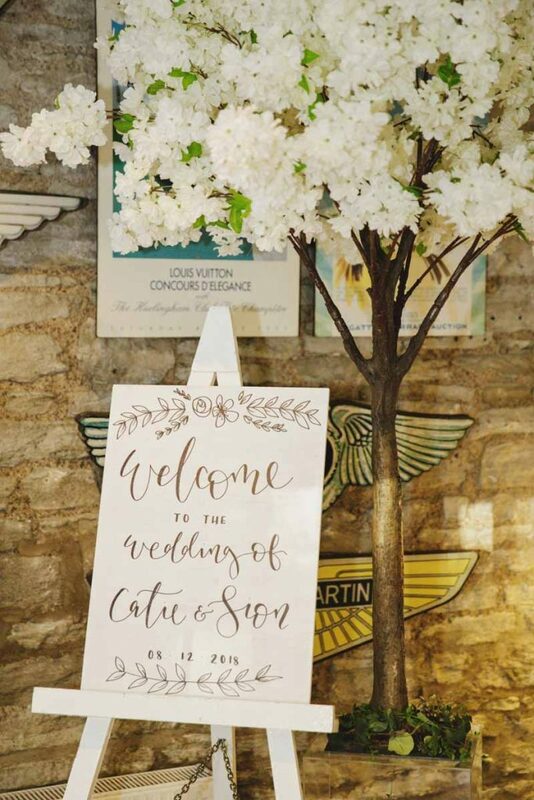 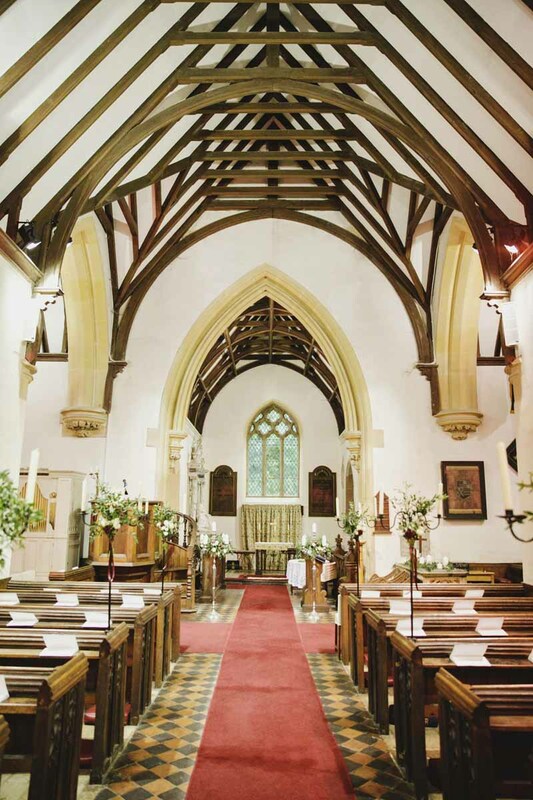 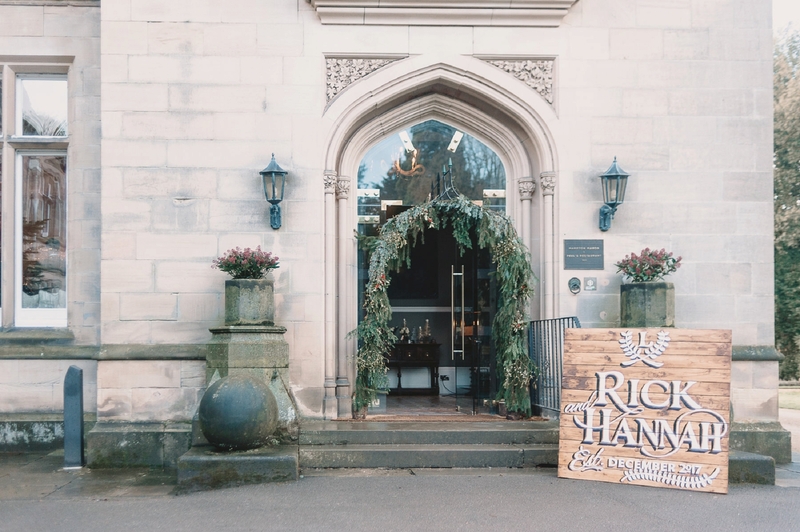 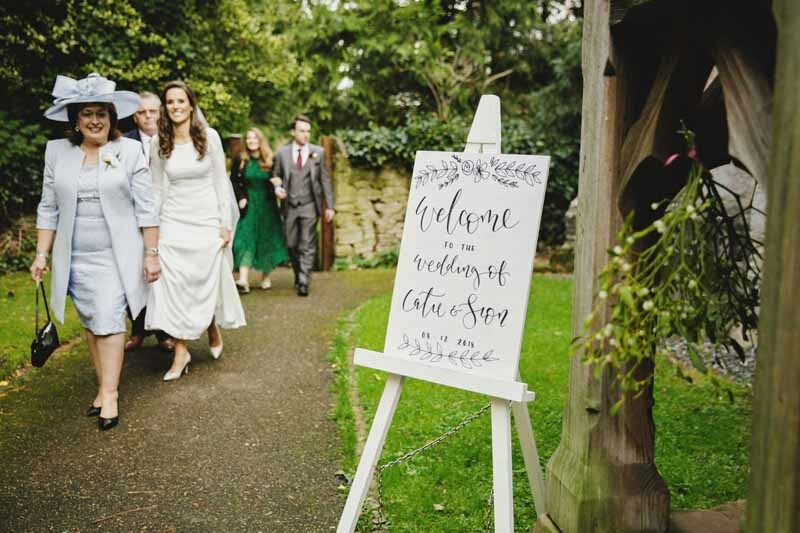 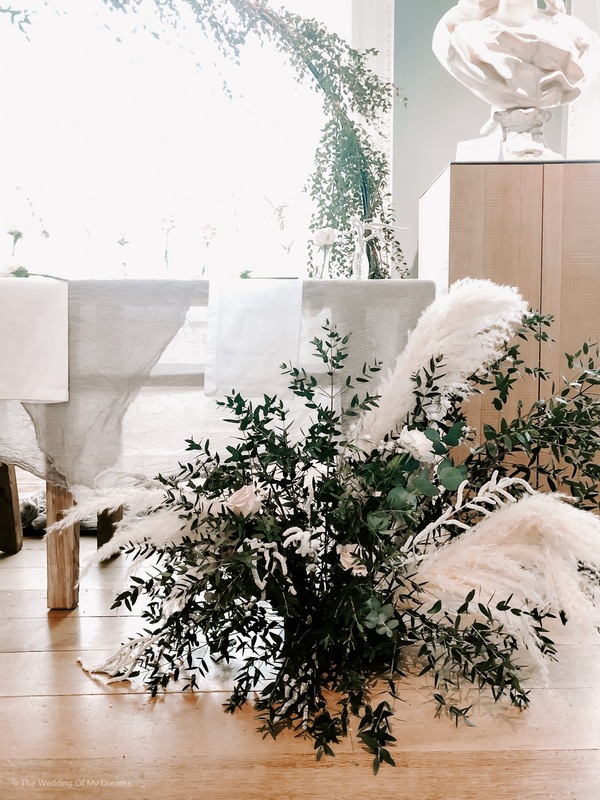 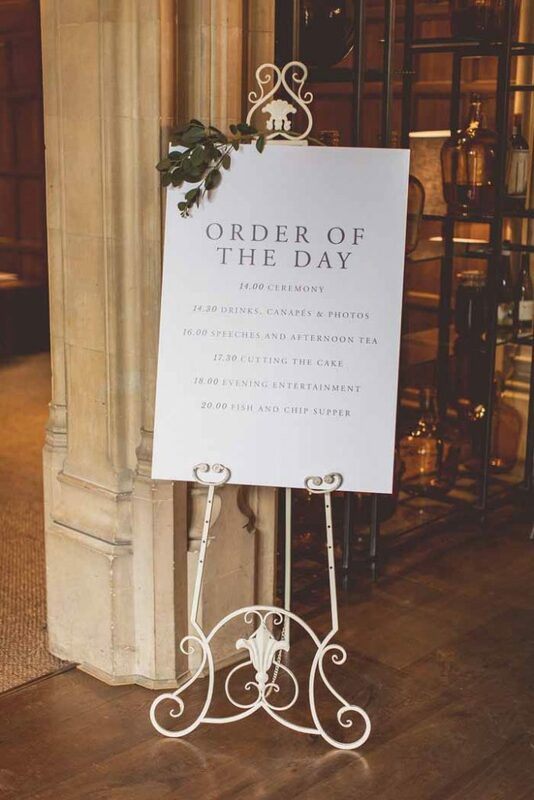 The church entrance was decorated with a bespoke white welcome sign, silver lanterns and bunches of local mistletoe. 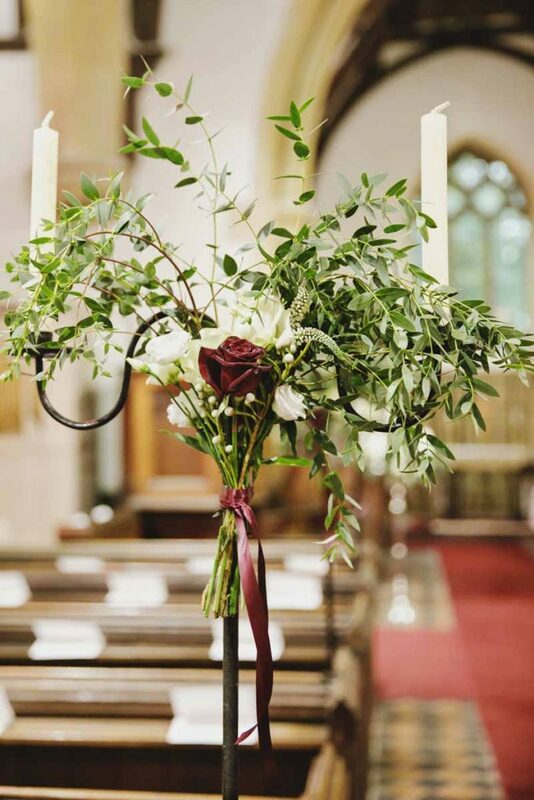 Inside this country estate church the tall candlesticks were decorated with flowers & foliage tied with deep burgundy ribbon. Tall silver candelabra decorated with flowers from the day made a wonderful frame for the wedding ceremony. 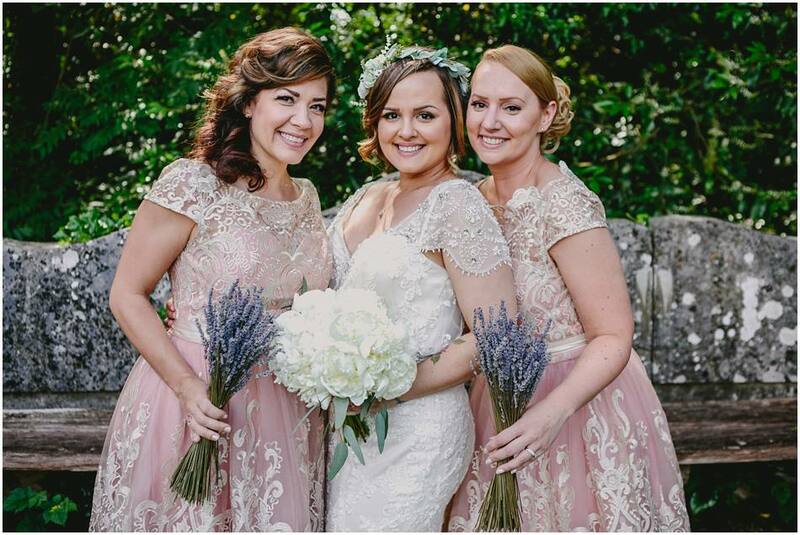 The beautiful deer were a personal touch bringing back memories for Catie and her mother. 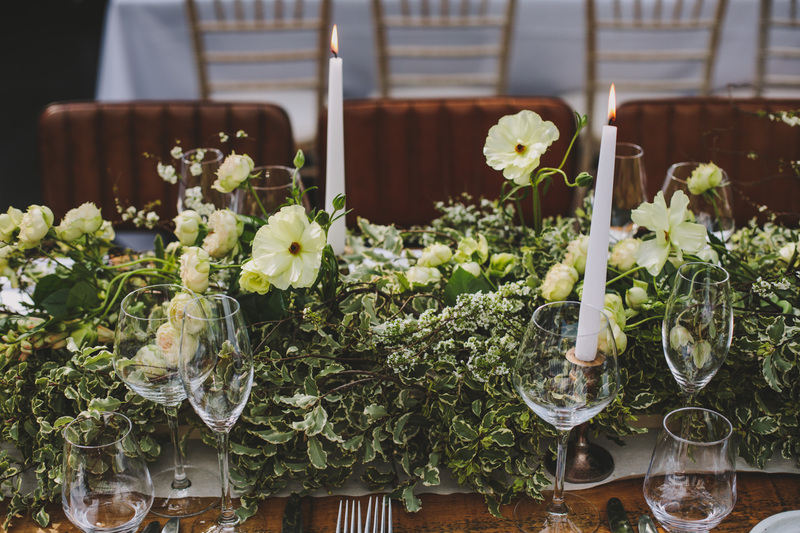 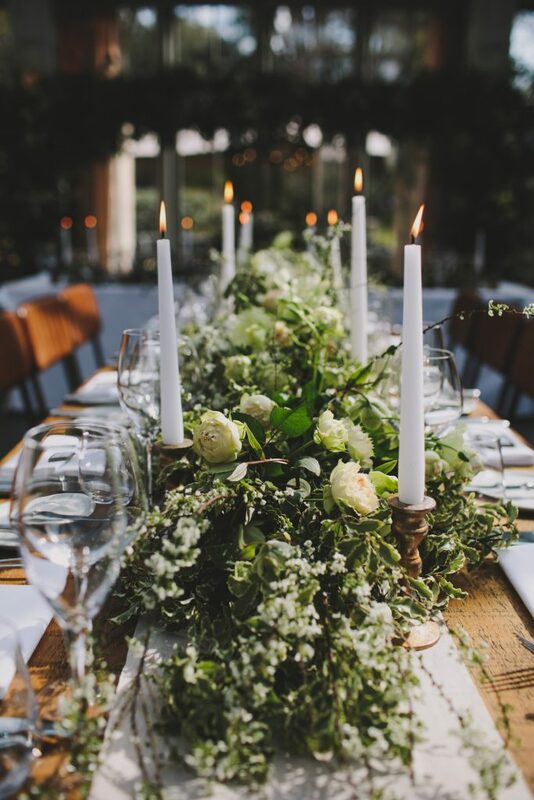 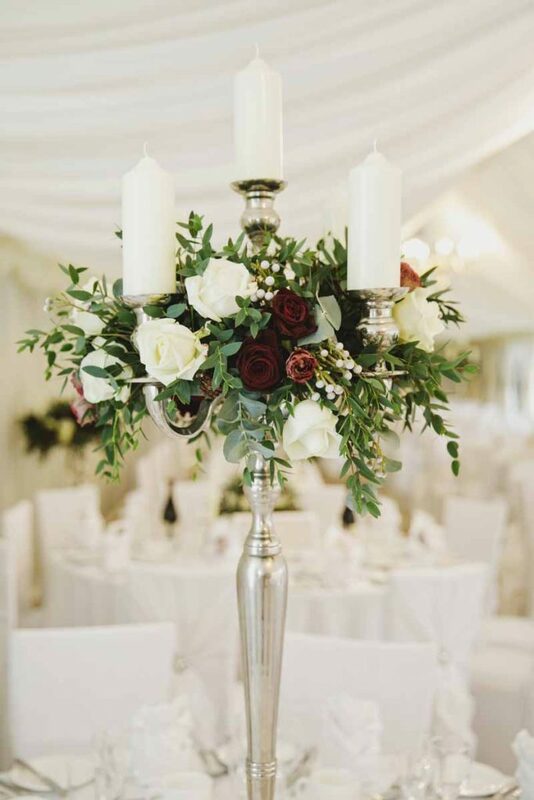 The winter elegance continued at Birtsmorton Court with elegant silver candelabra and footed bowls filled with a relaxed mix of blooms and foliage from the day. 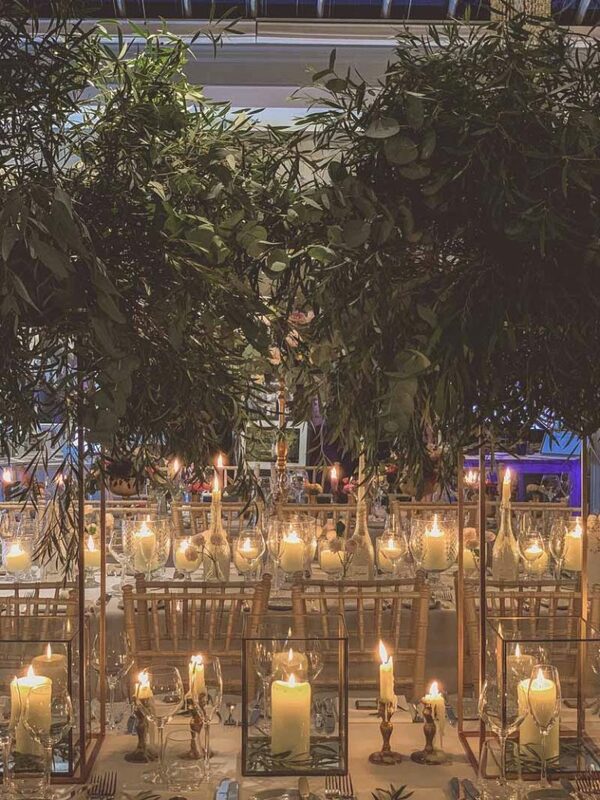 The top table was framed by the tall candelabra with an elegant central arrangement and a mix of vases and votives were added. 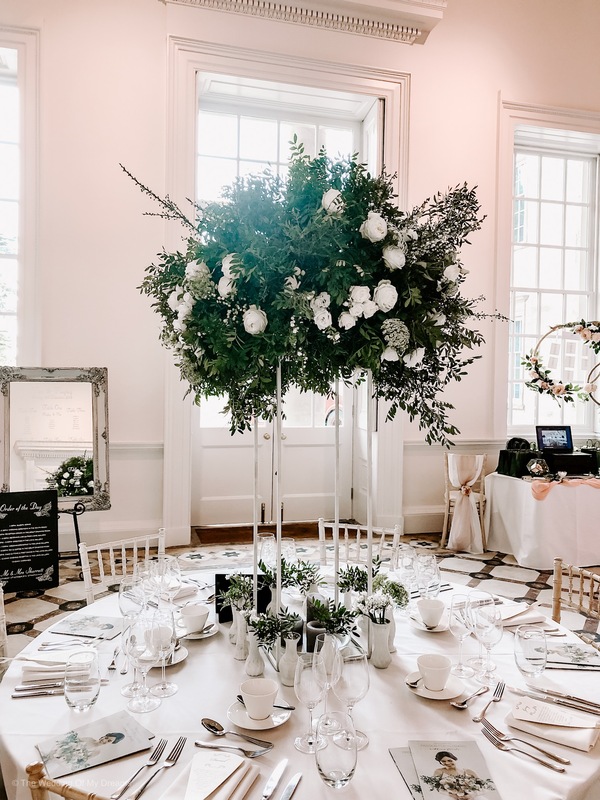 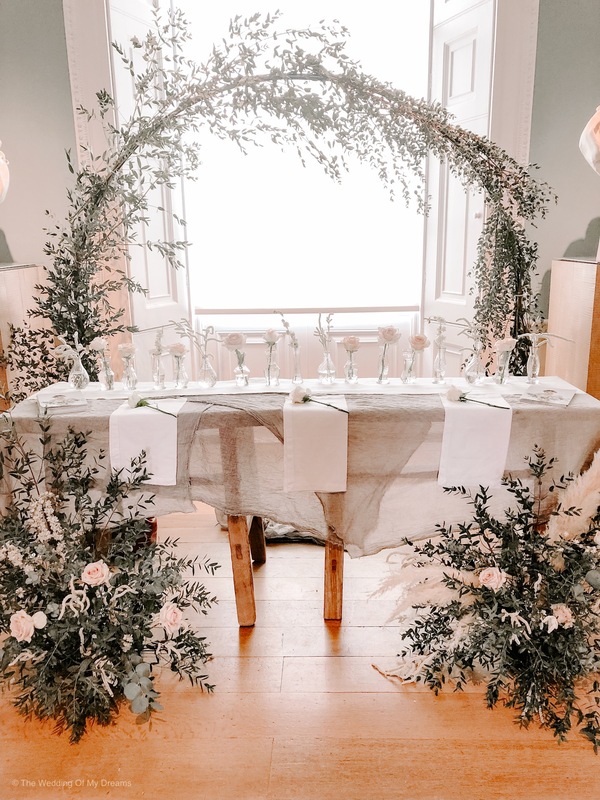 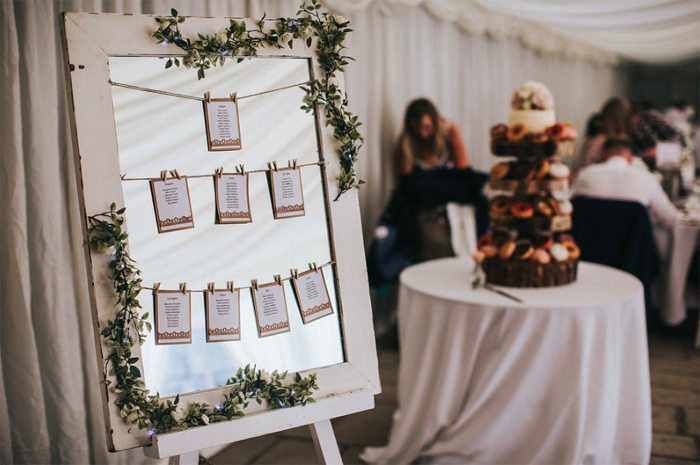 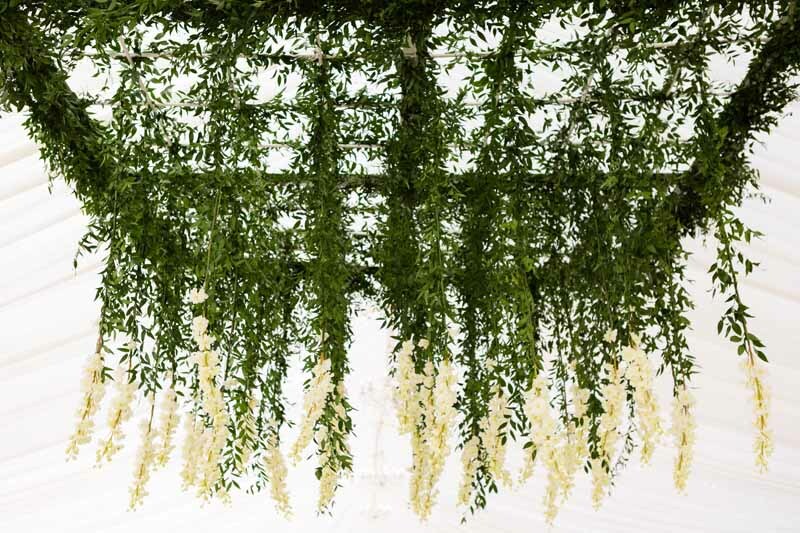 The table plan mirror continued the look with a garland of foliage and flowers from the day bringing colour to the look. 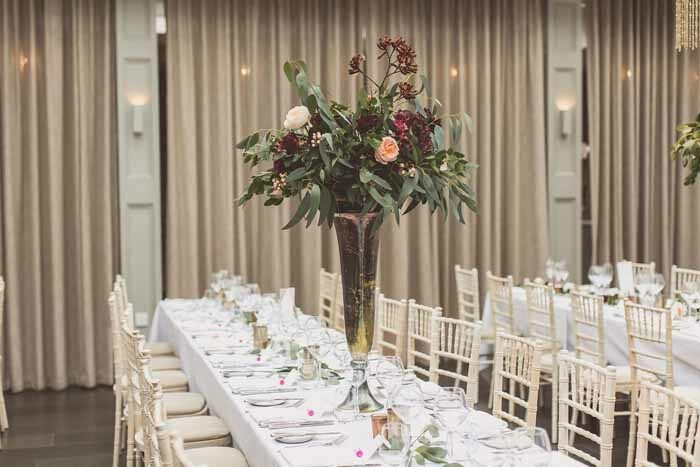 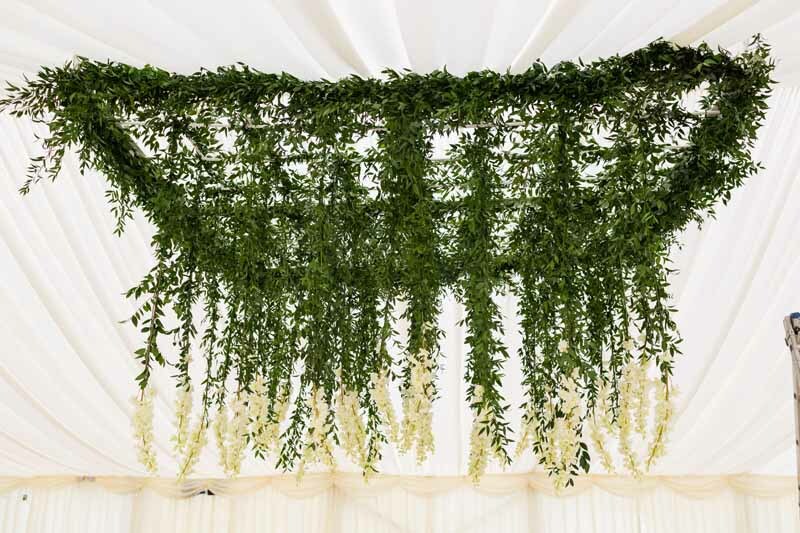 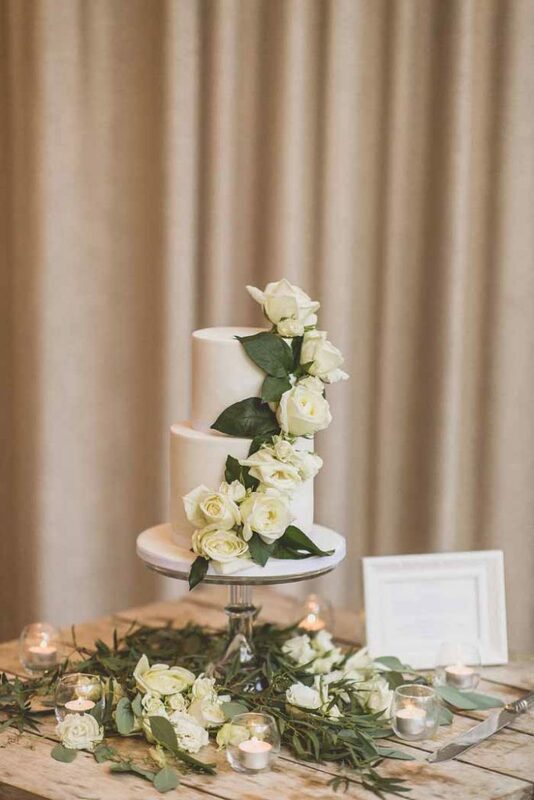 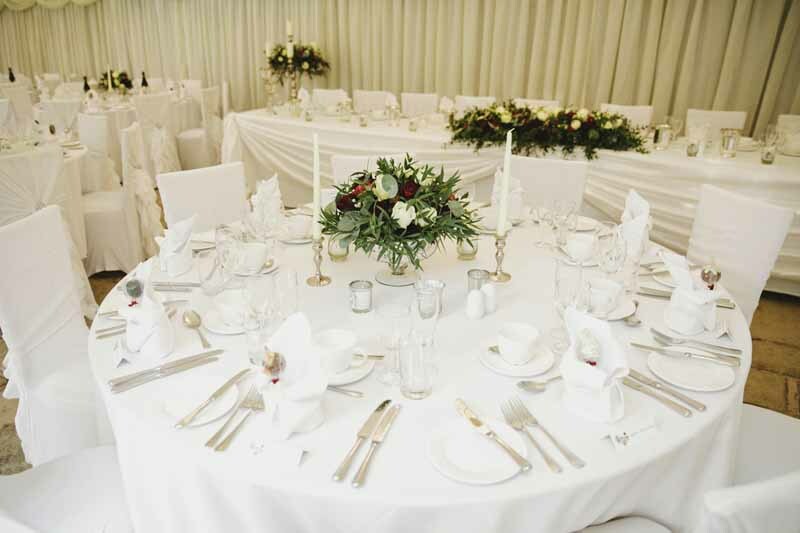 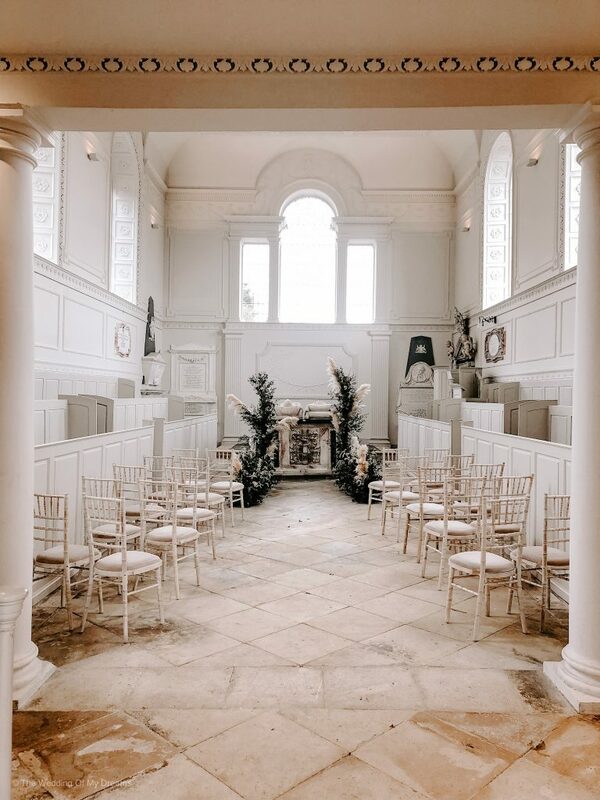 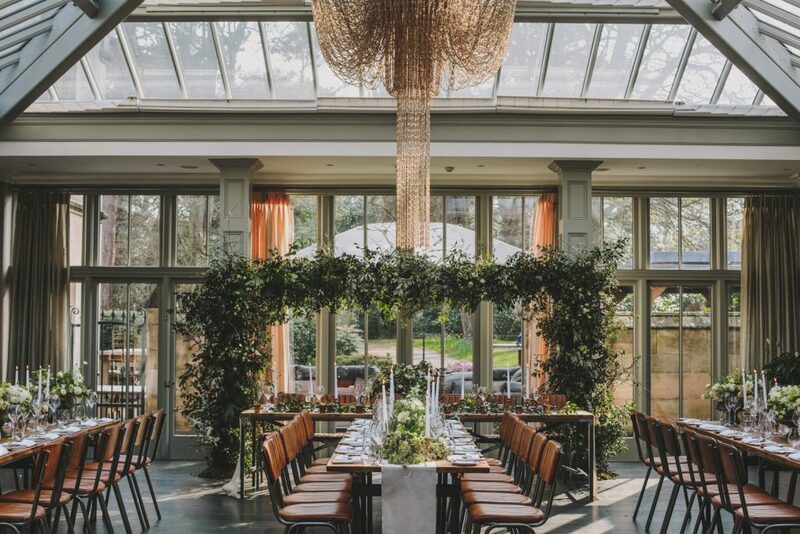 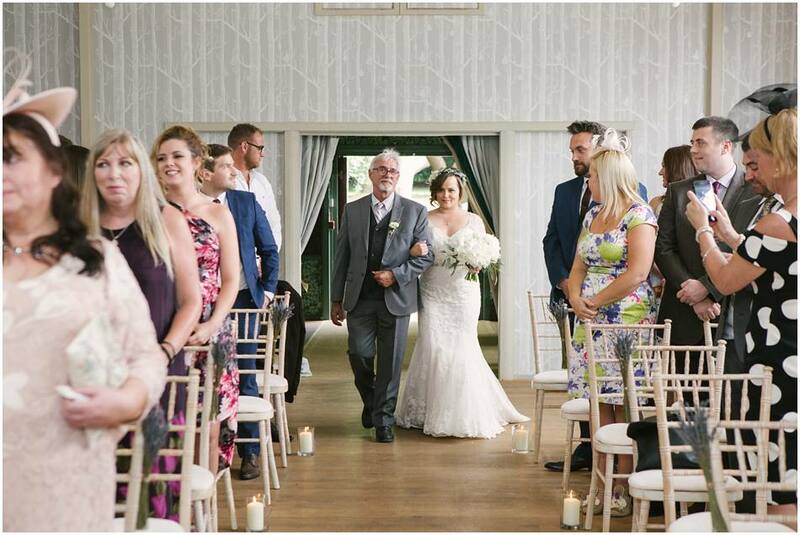 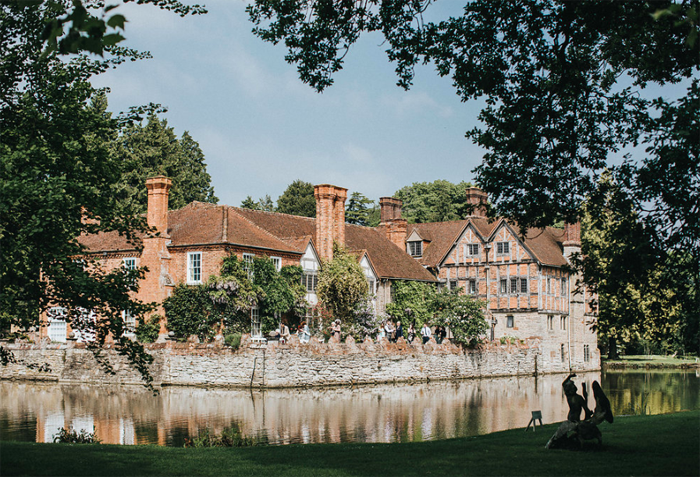 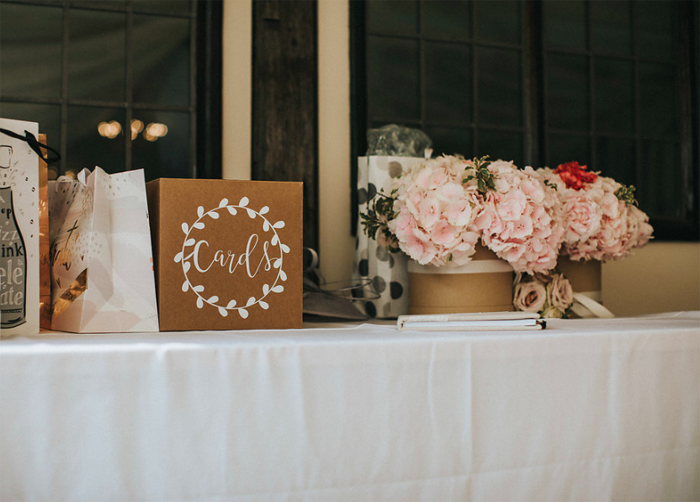 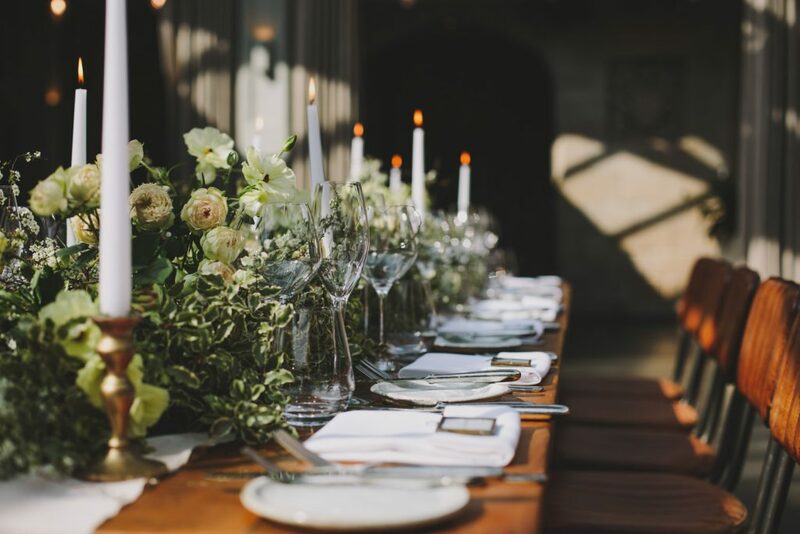 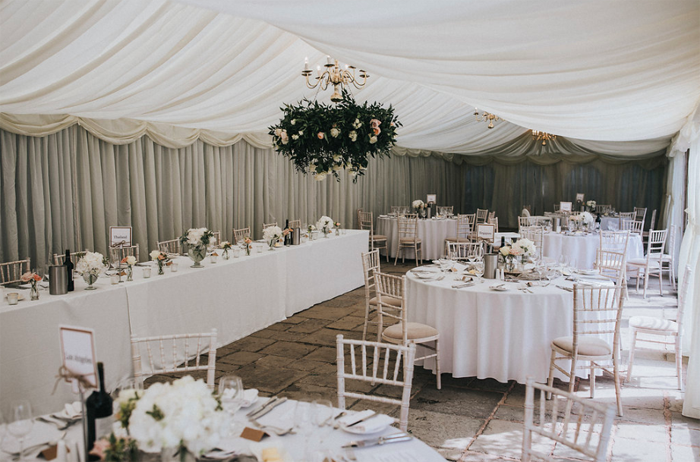 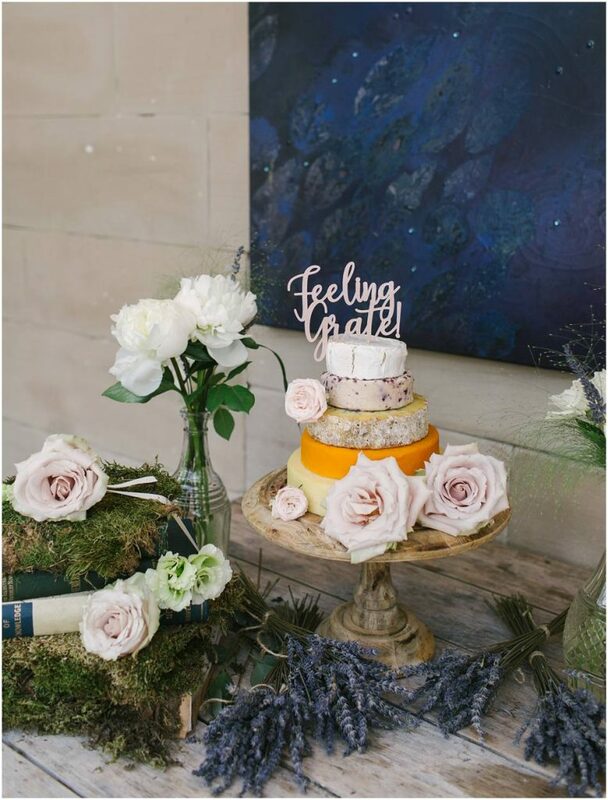 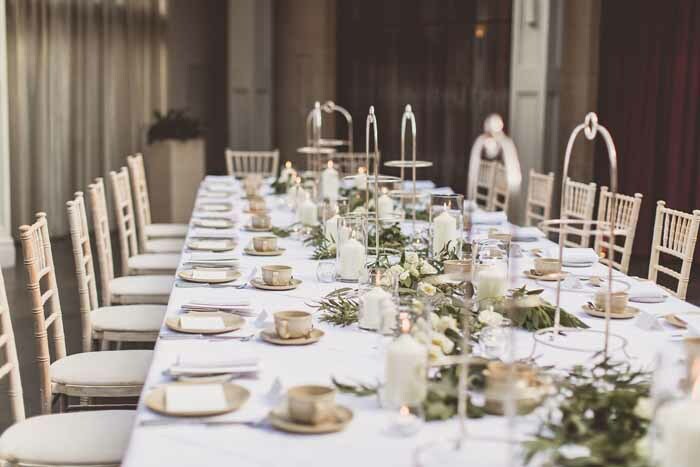 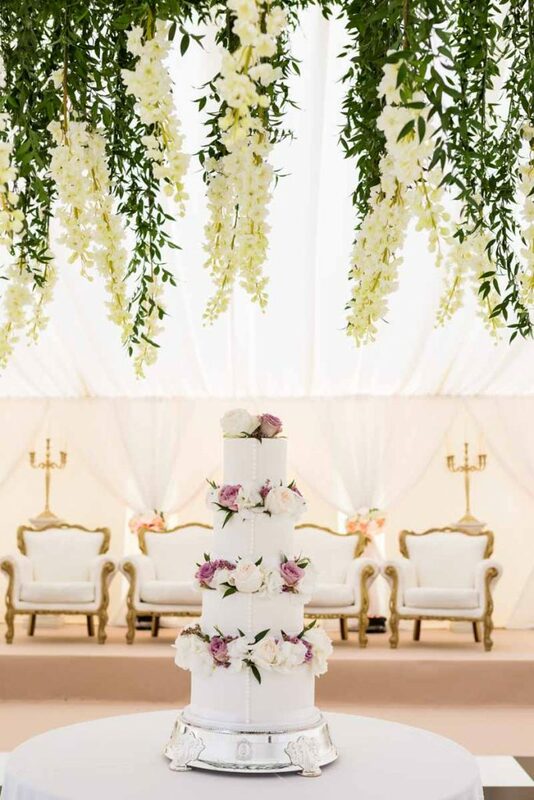 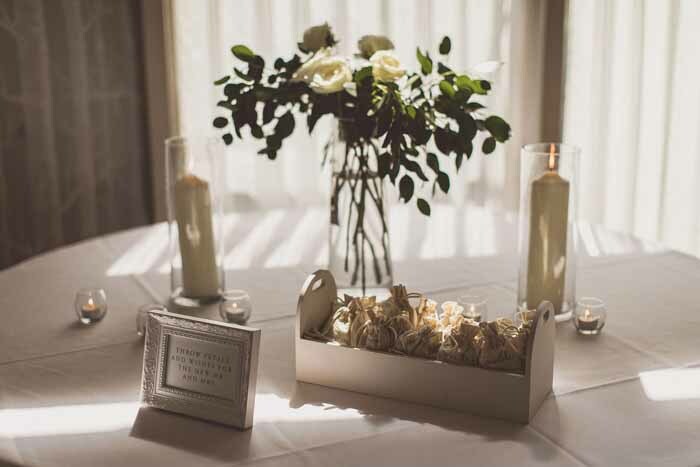 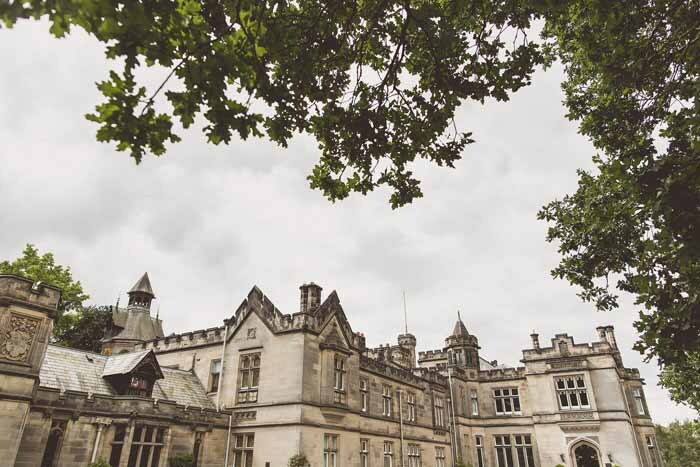 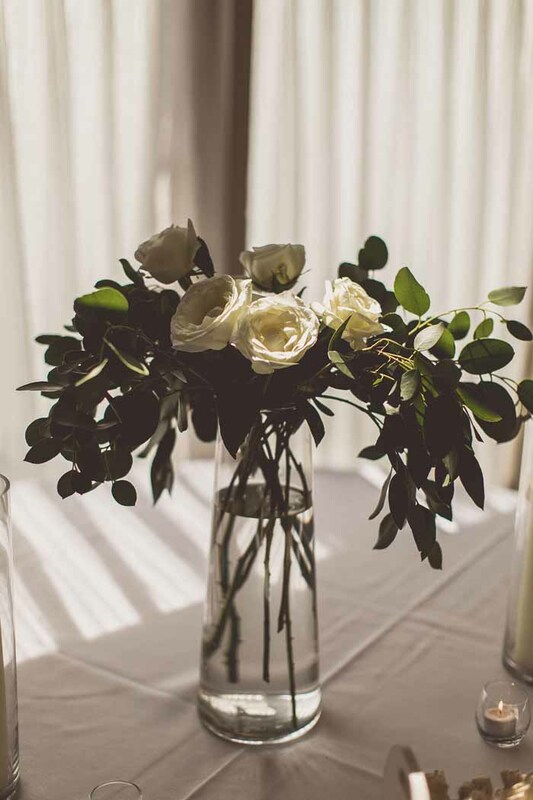 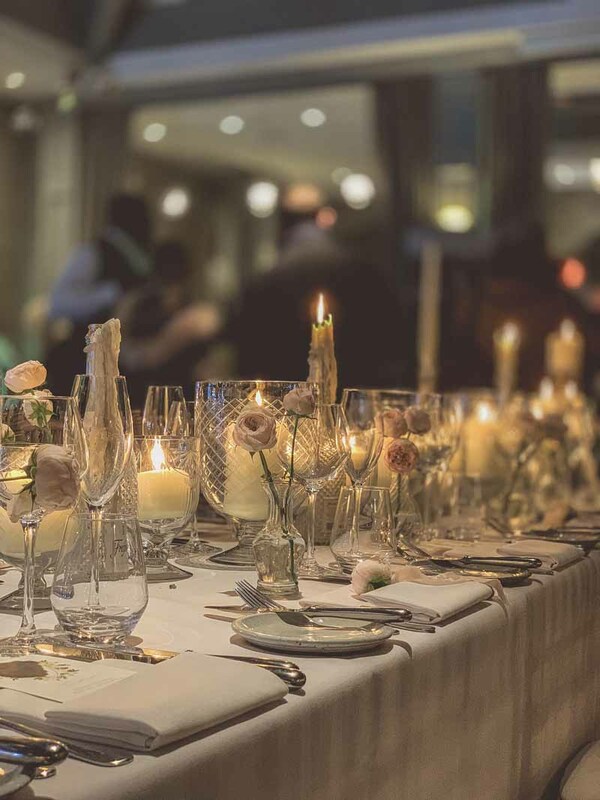 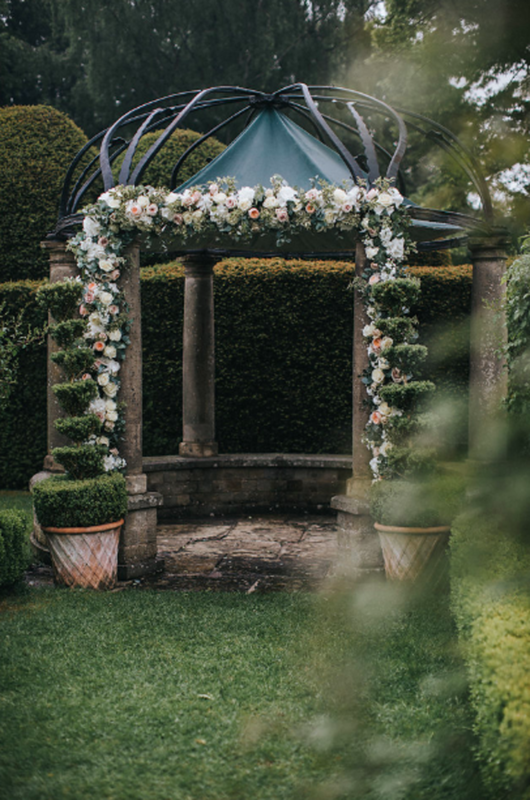 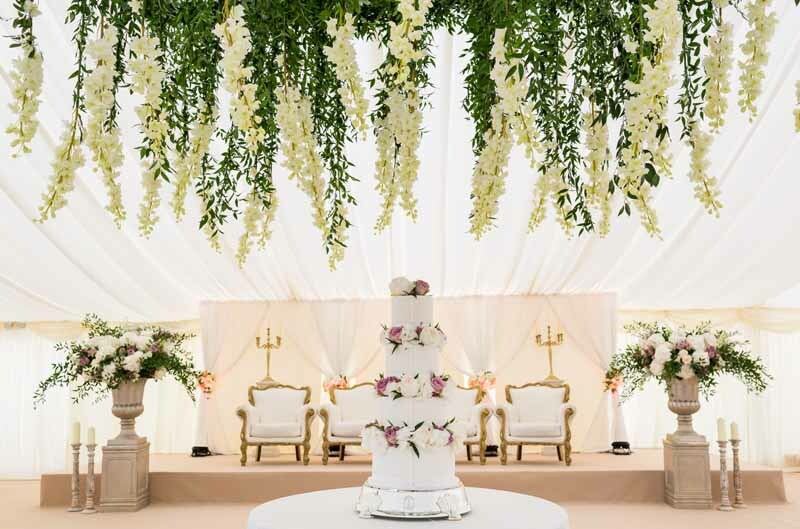 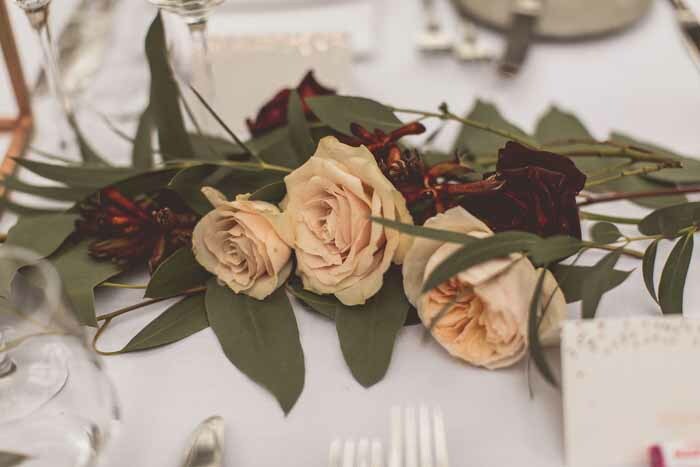 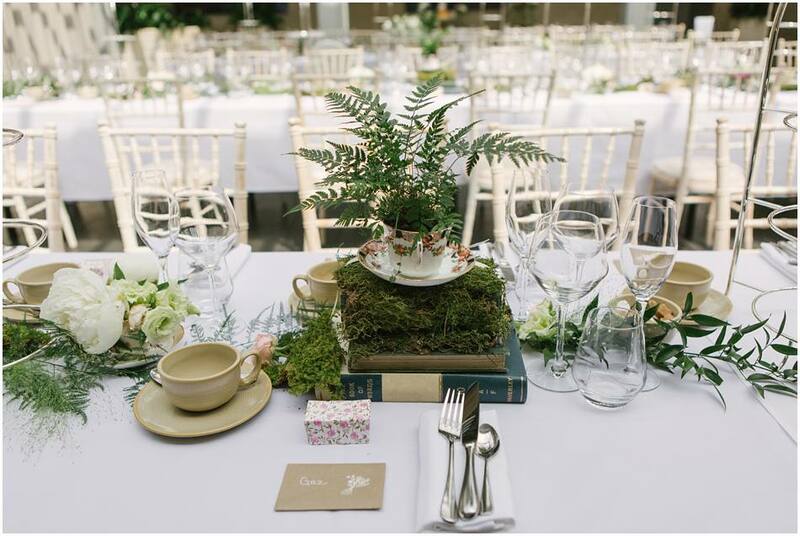 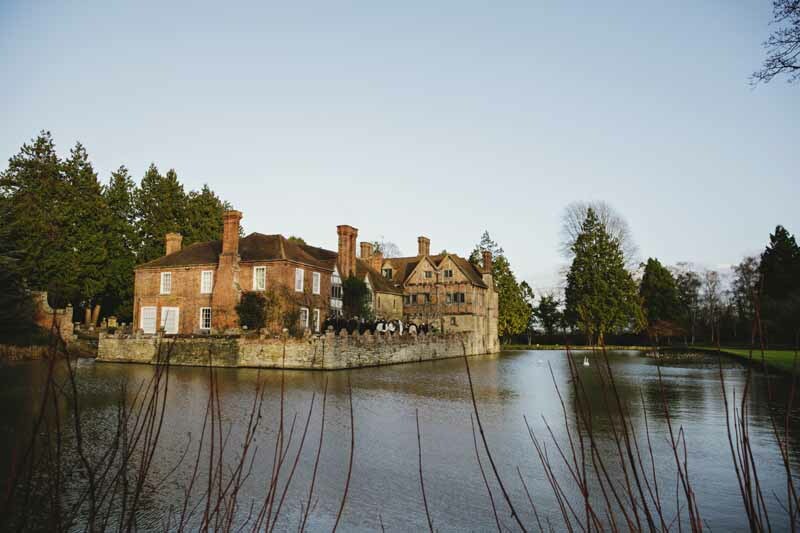 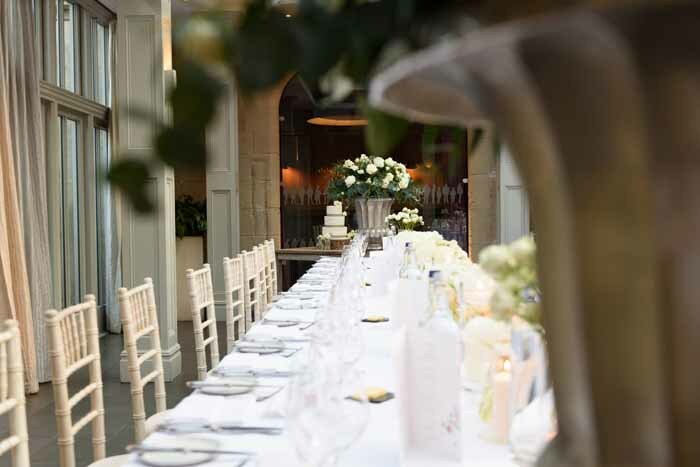 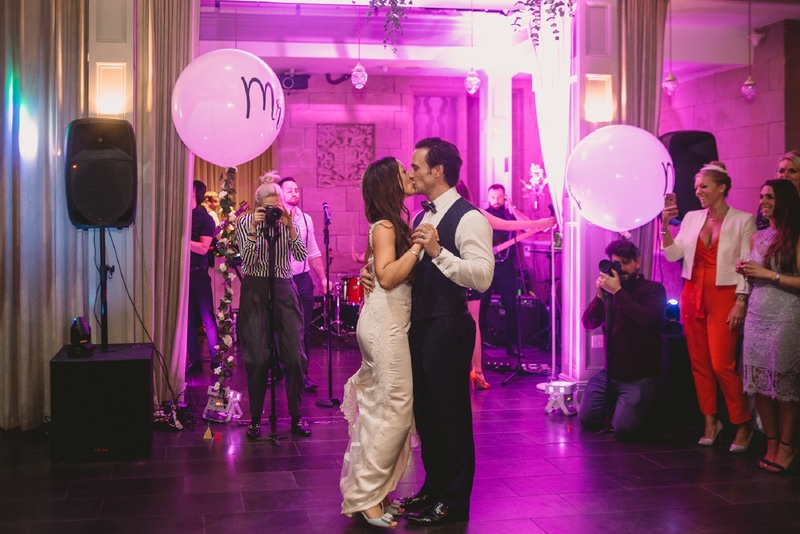 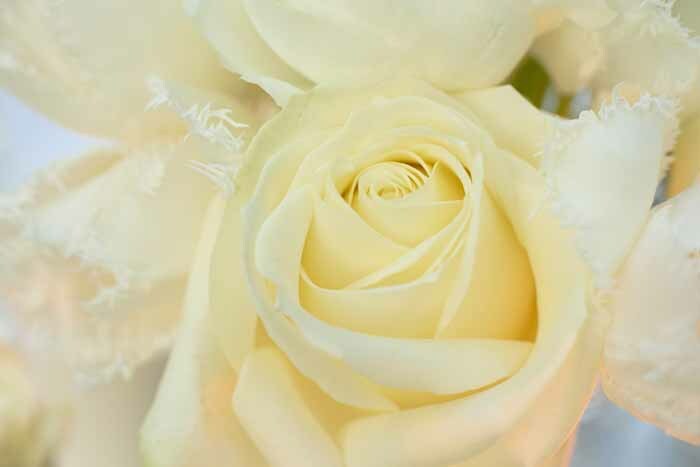 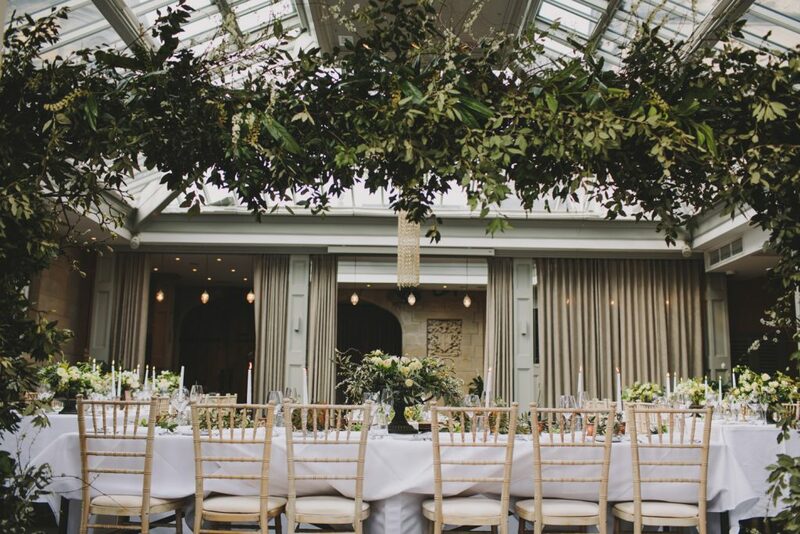 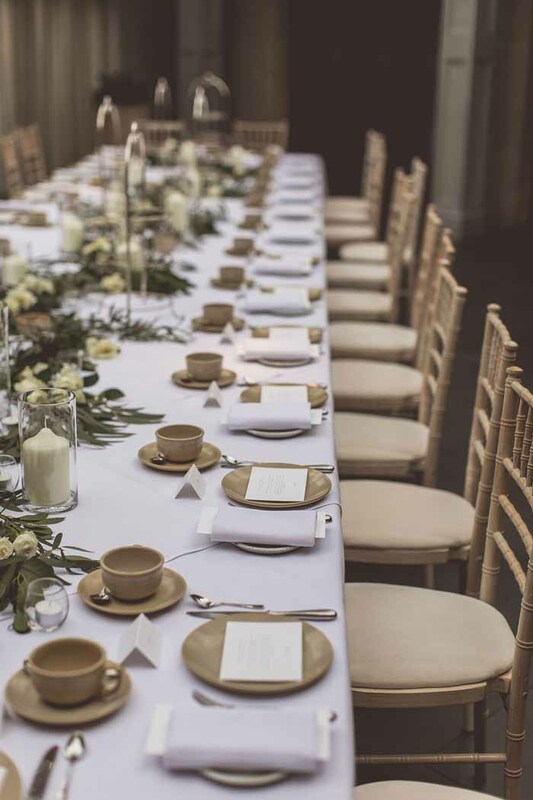 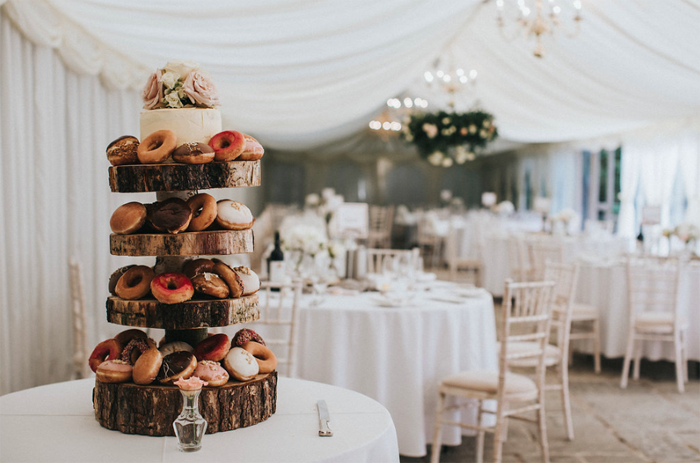 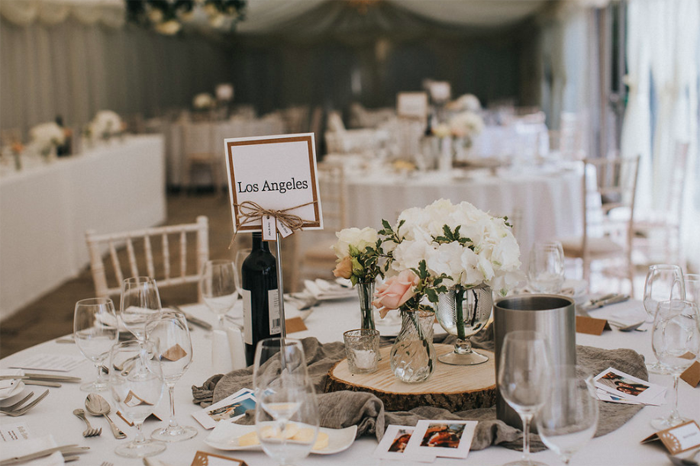 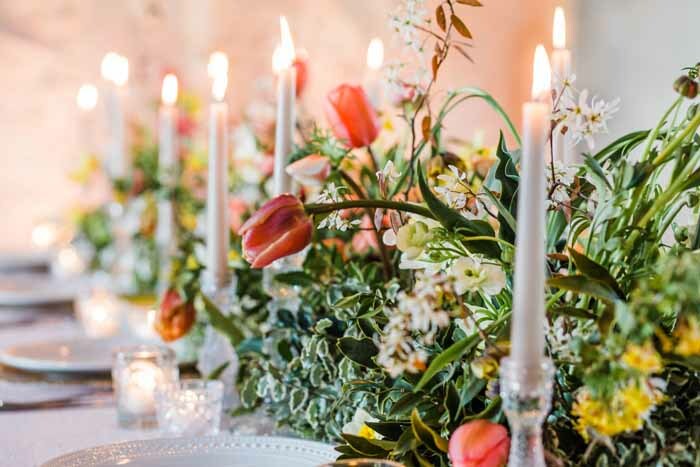 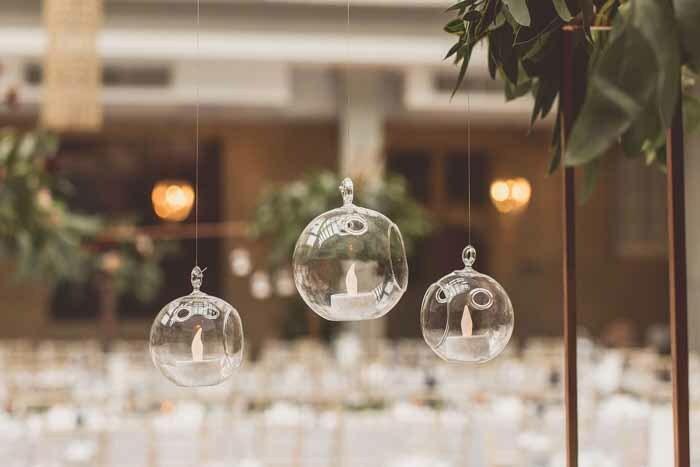 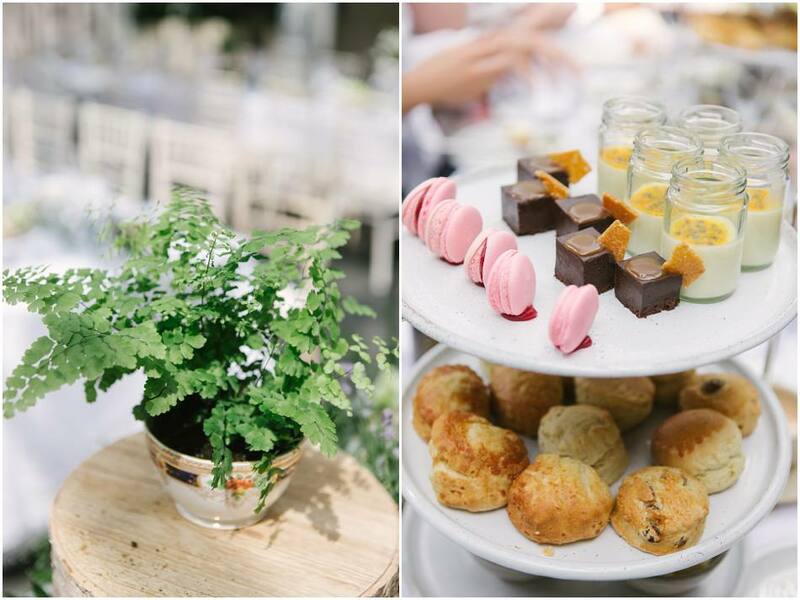 We love decorating and styling weddings and events at Hampton Manor and enjoy keeping in touch with the look and feel of the seasons. 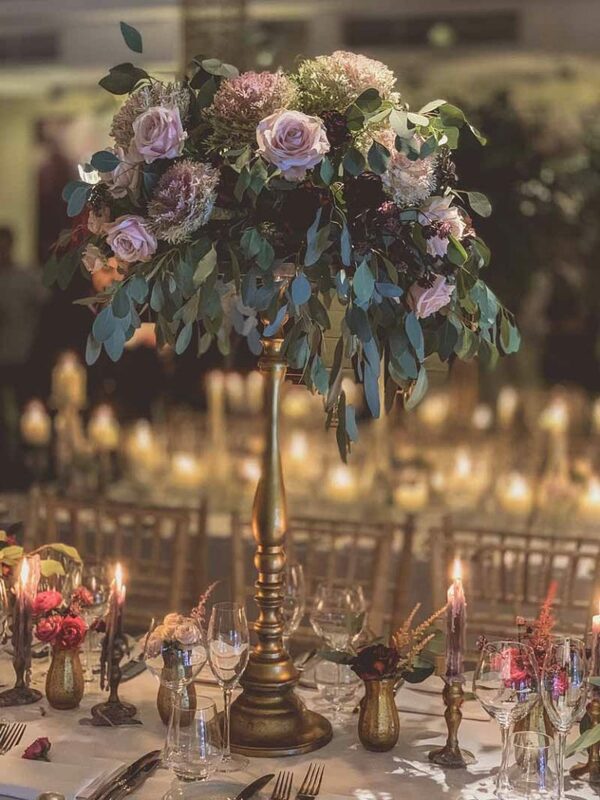 Adding gold footed urns and tall gold stands to the long tables creates an opulent look to the tables. 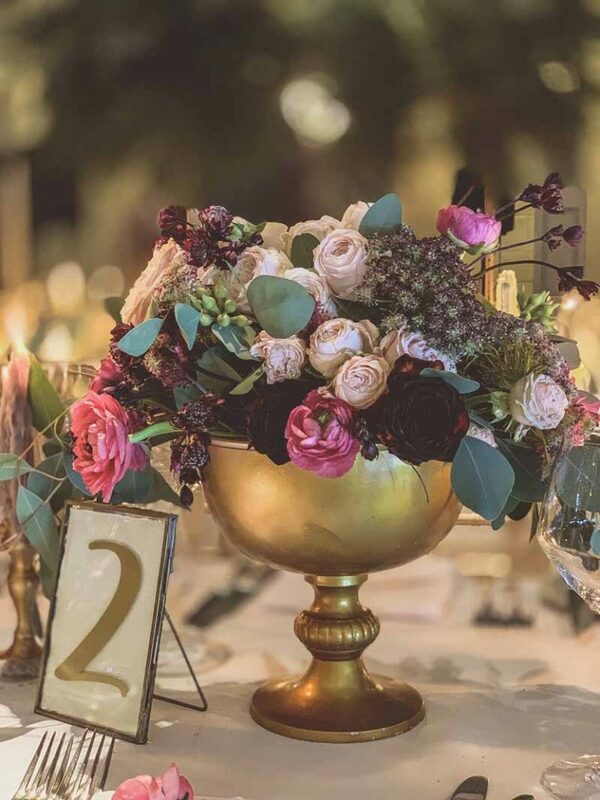 Teaming these with flowers and foliage in warm berry tones adds a richness to the designs, small gold posy vases and candlesticks complete the look. 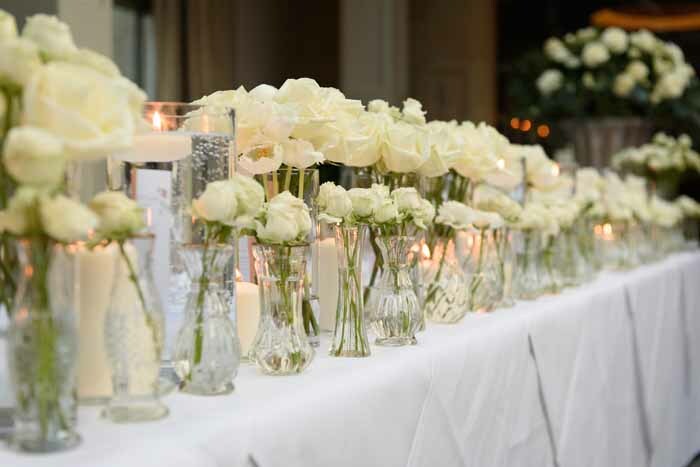 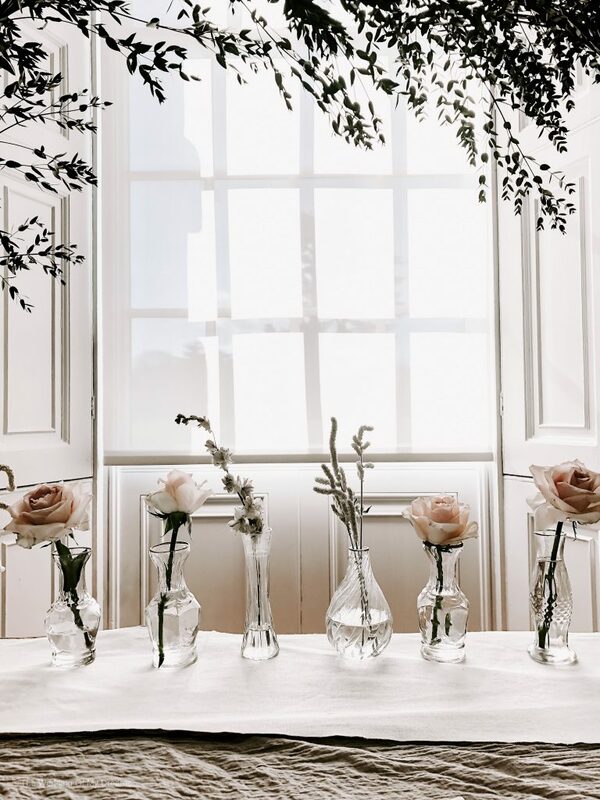 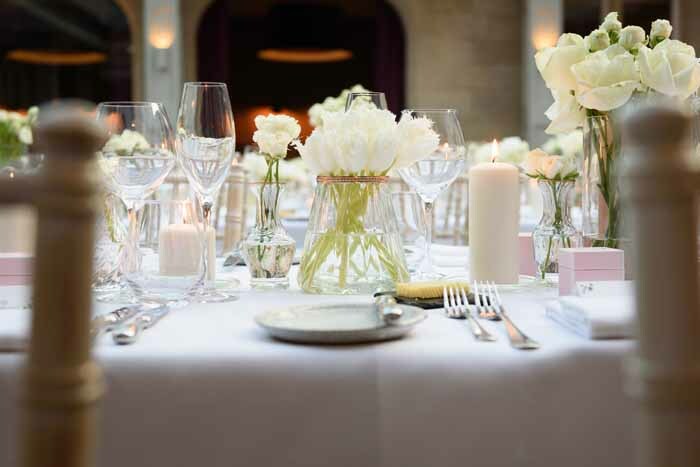 Choose glass vases and a mix of glass footed vases with church candles for an elegant look to your wedding. 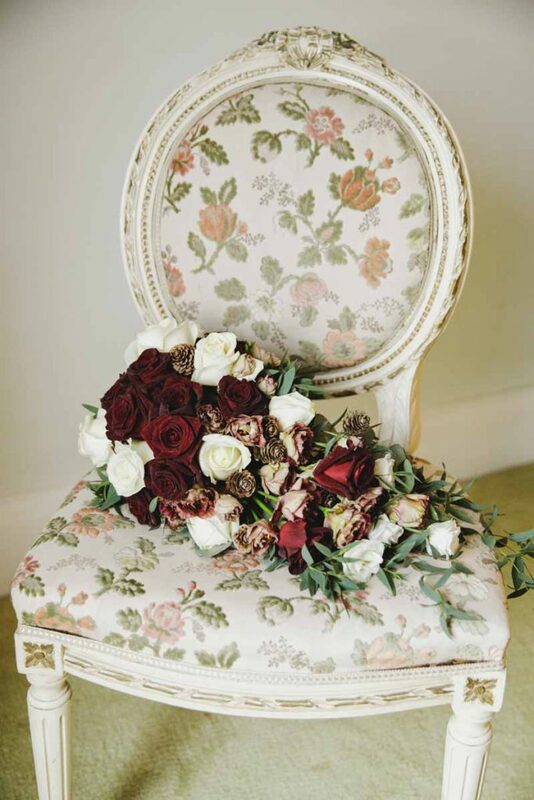 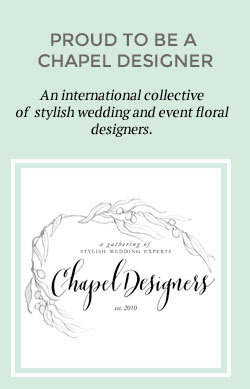 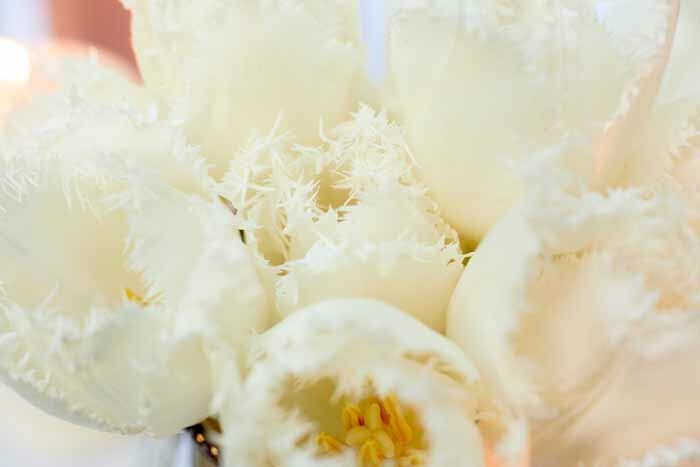 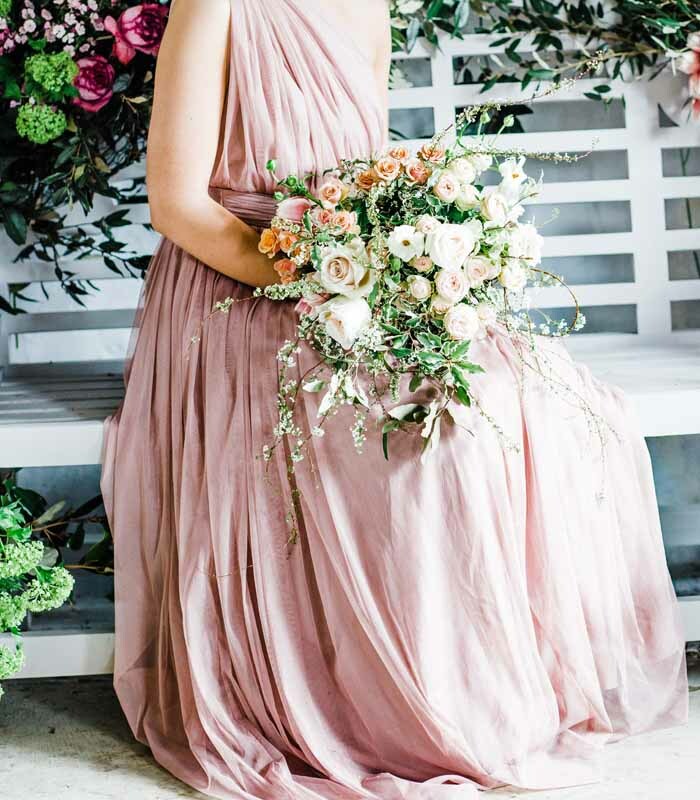 Blush flowers give a lightness to the look and foliage could be added to entwine through the designs. 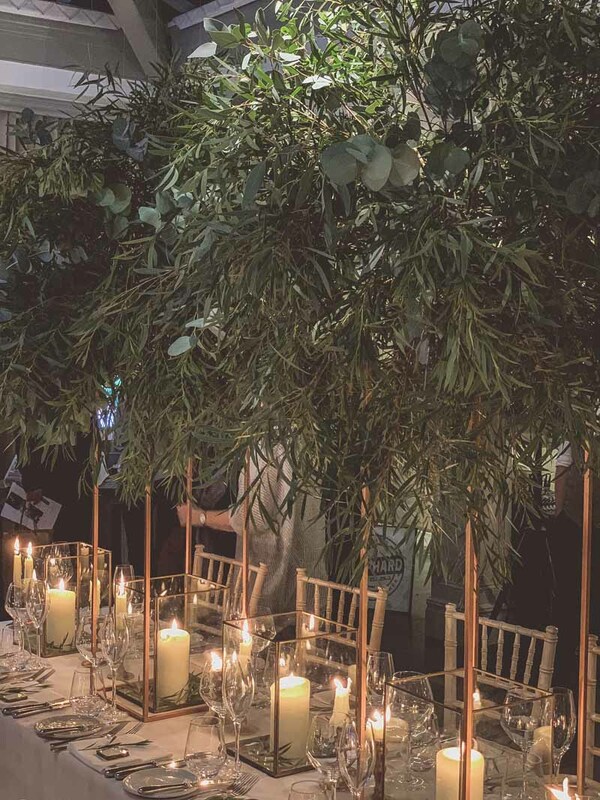 Foliage is very much a firm favourite for long tables and these elevated designs on gold stands create a wow factor look to the tables. 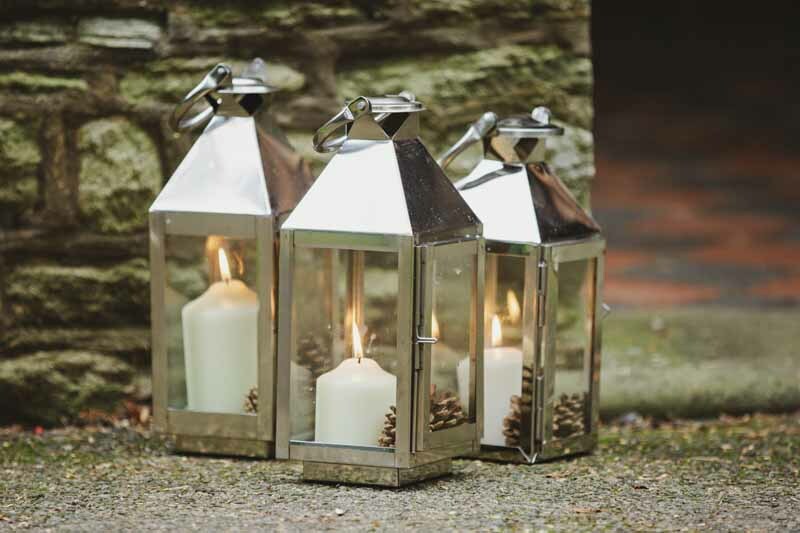 Here we set brass lanterns with church candles to add interest to the table and echo the shape of the stands.